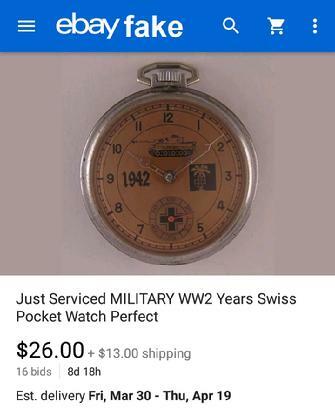 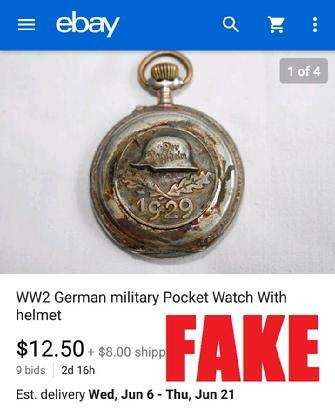 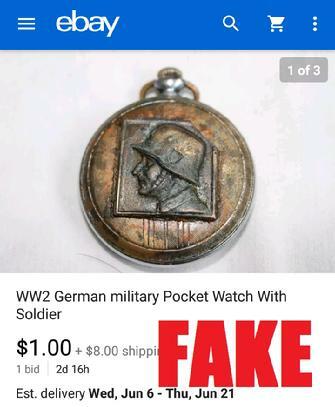 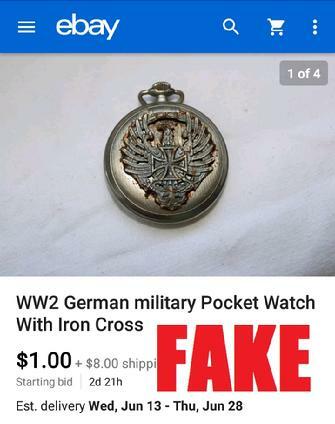 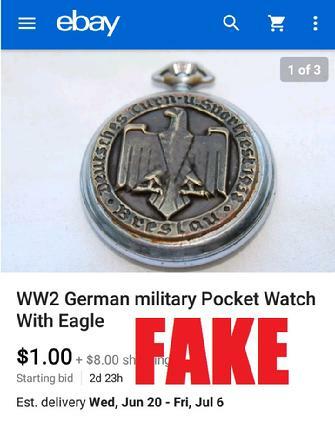 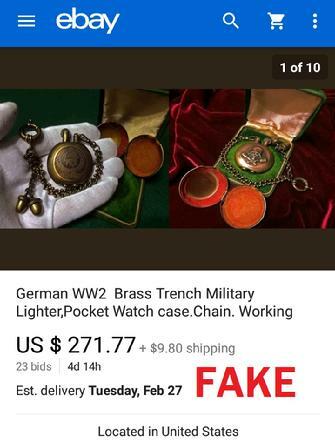 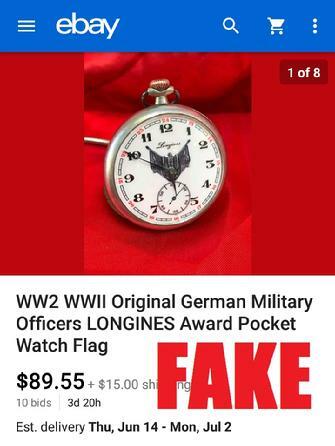 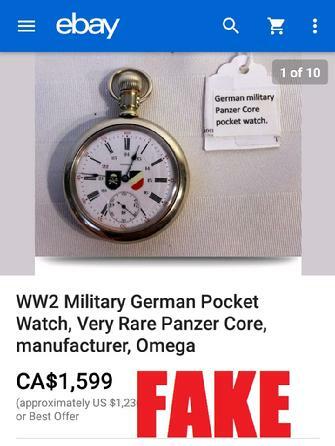 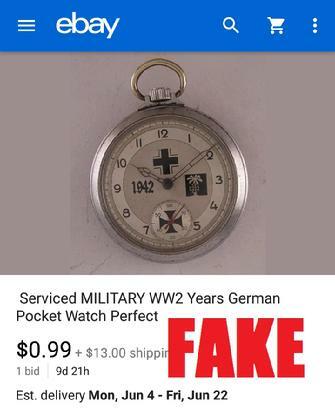 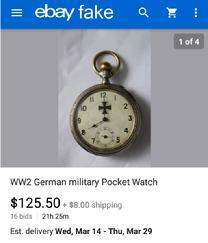 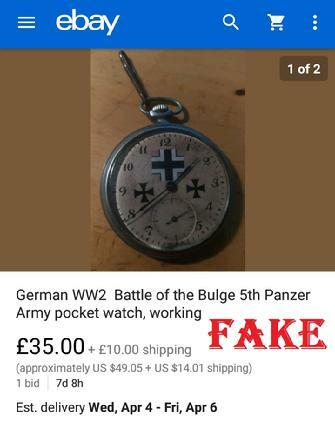 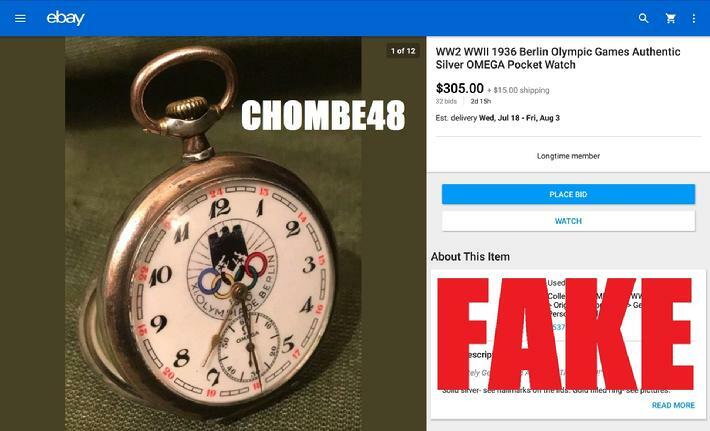 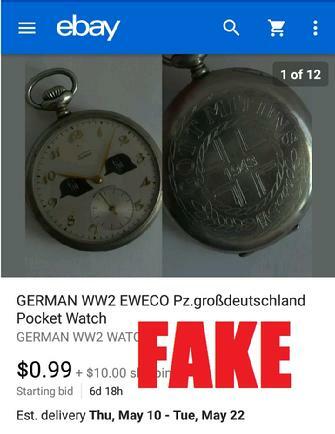 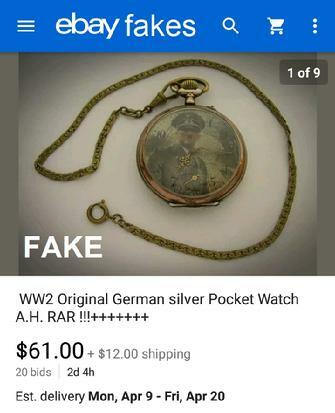 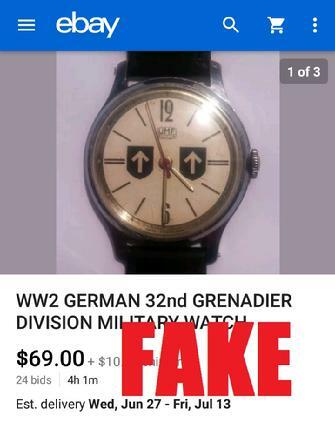 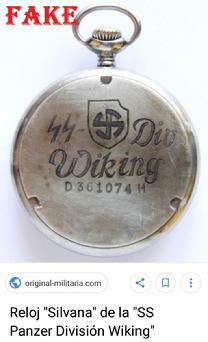 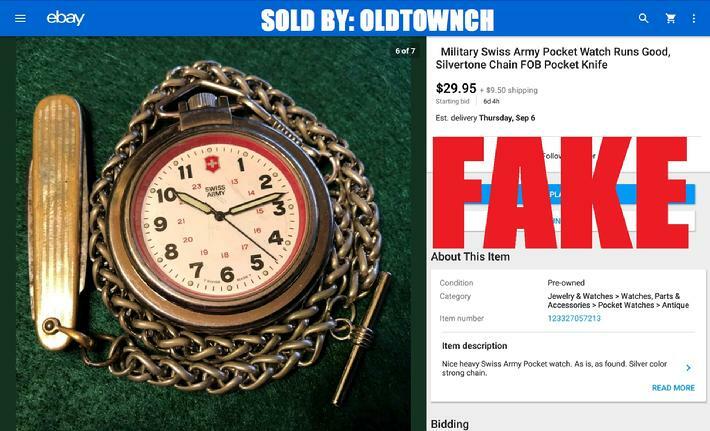 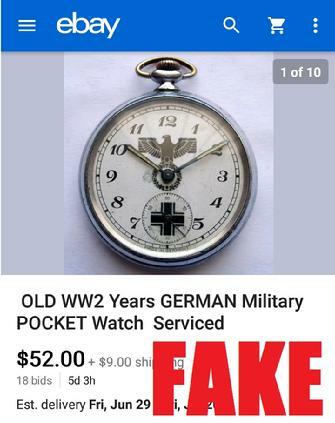 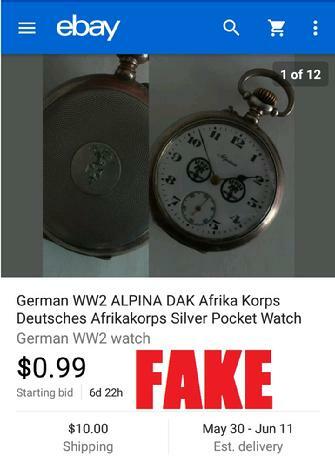 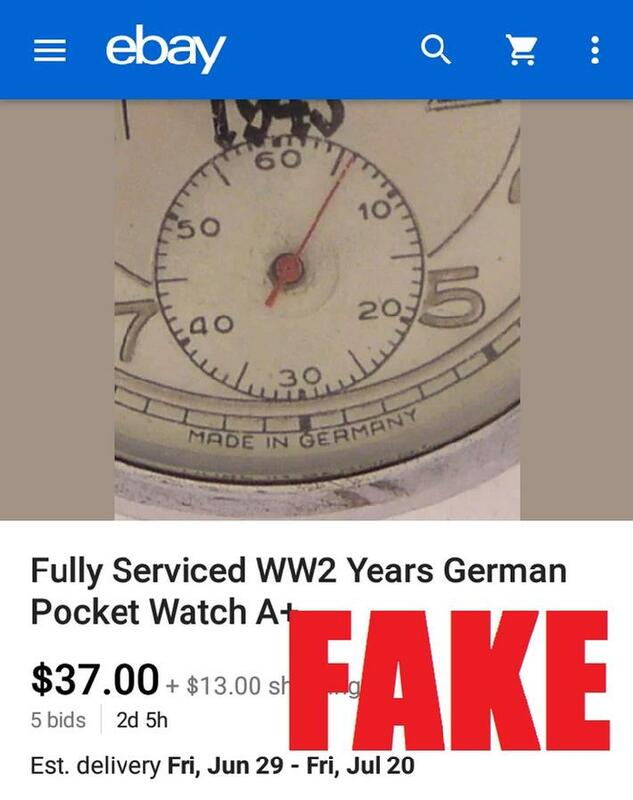 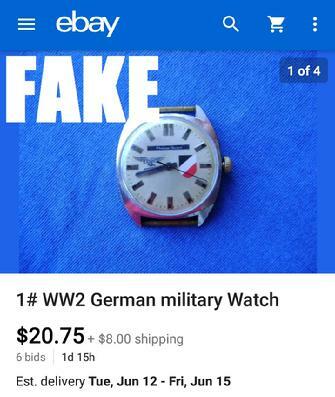 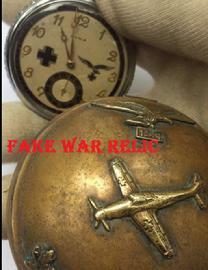 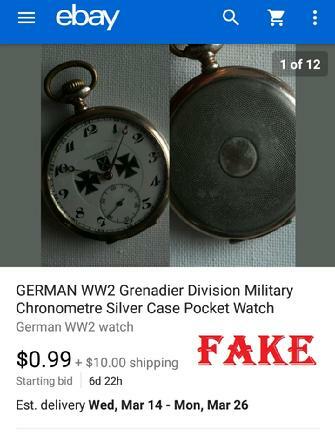 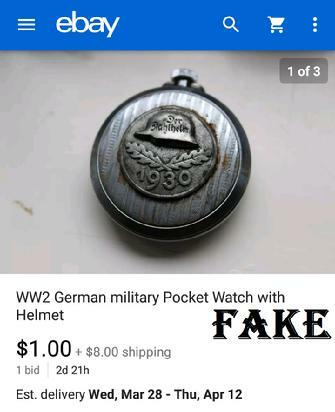 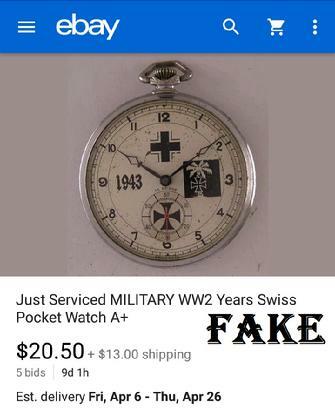 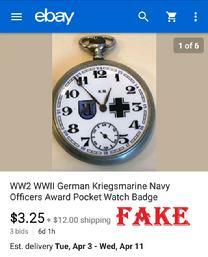 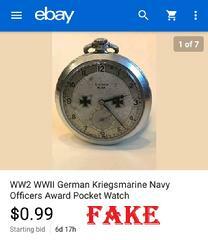 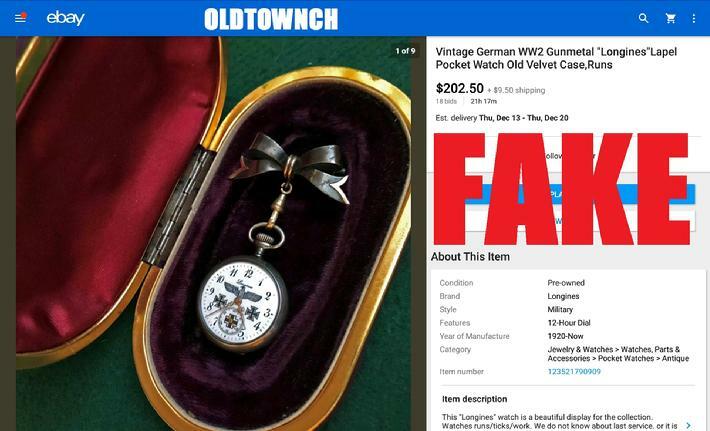 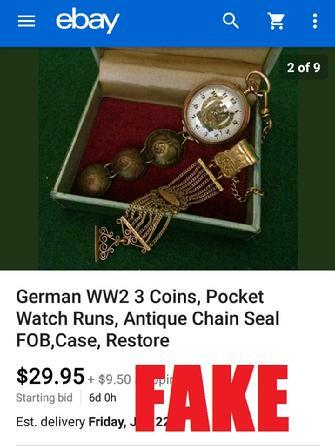 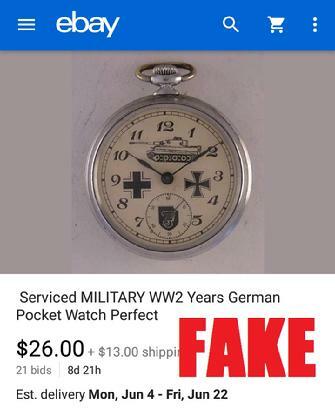 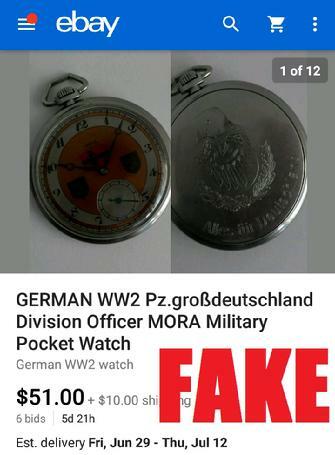 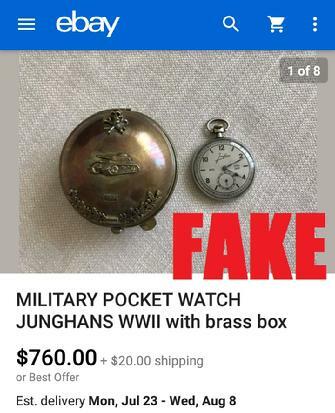 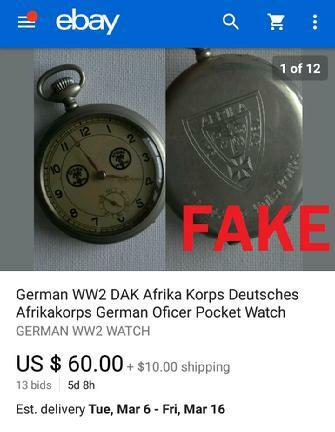 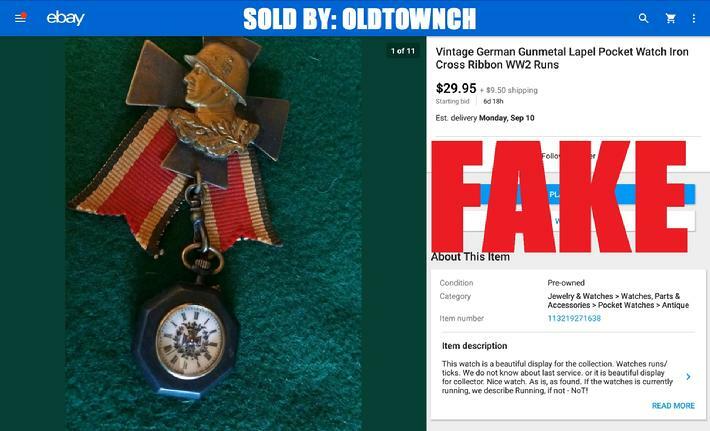 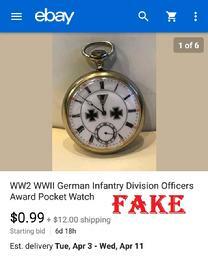 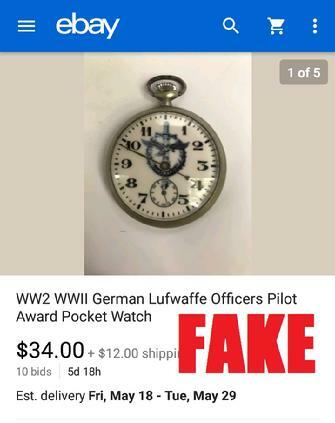 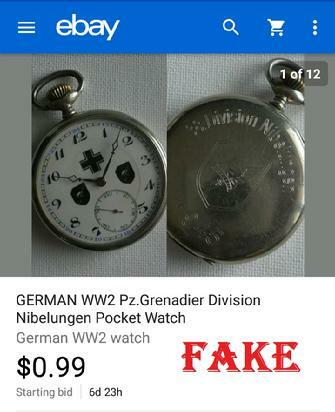 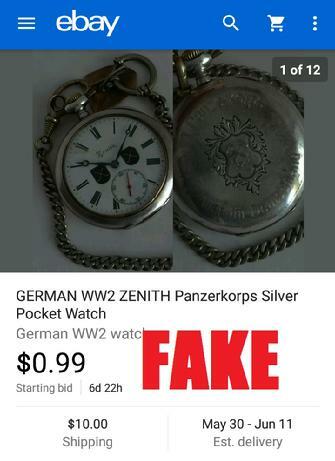 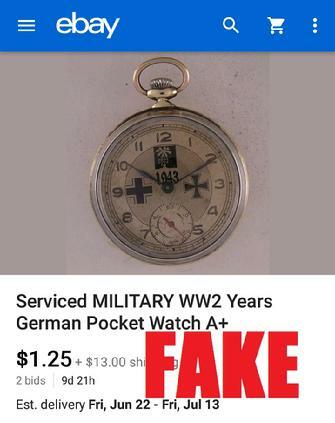 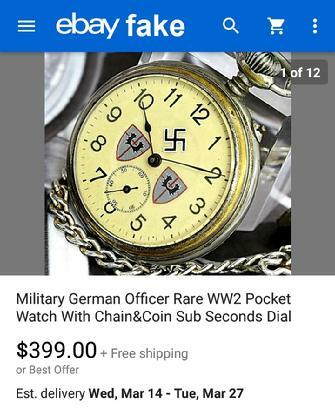 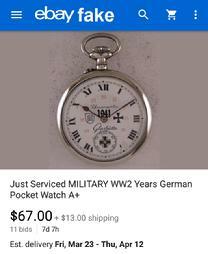 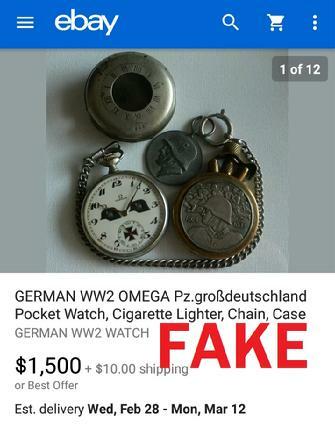 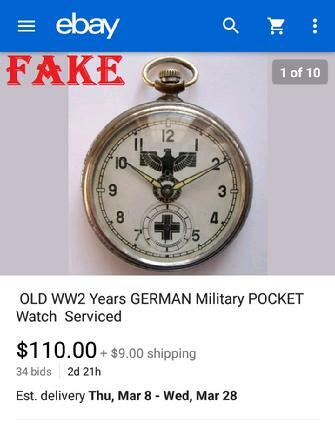 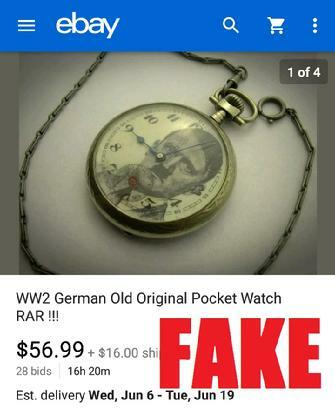 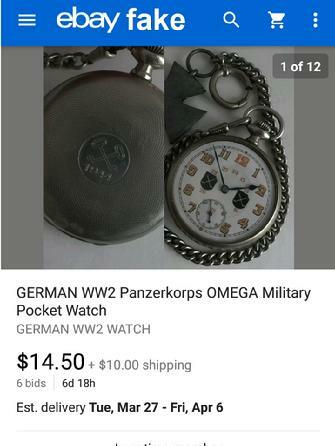 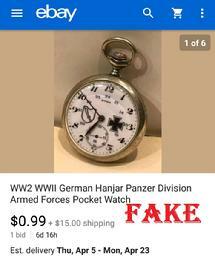 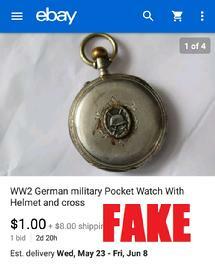 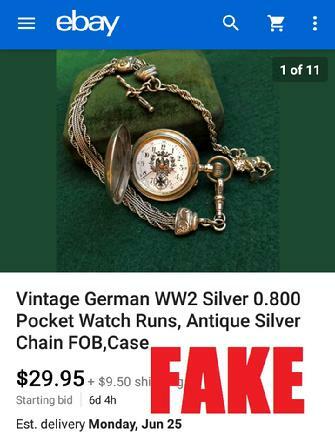 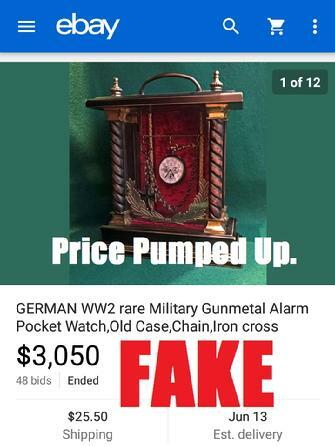 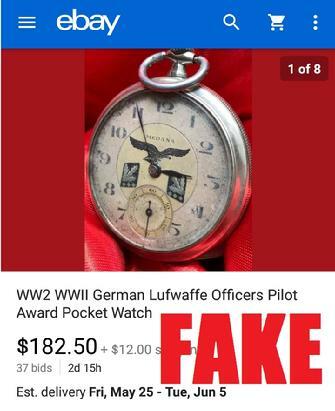 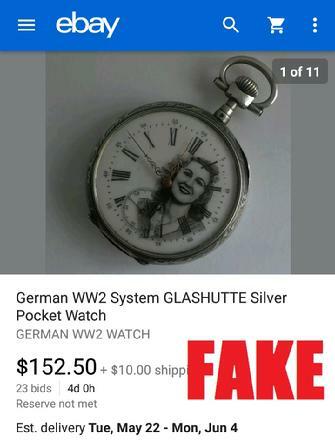 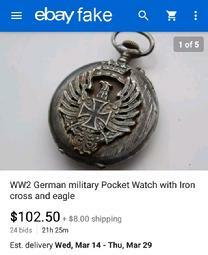 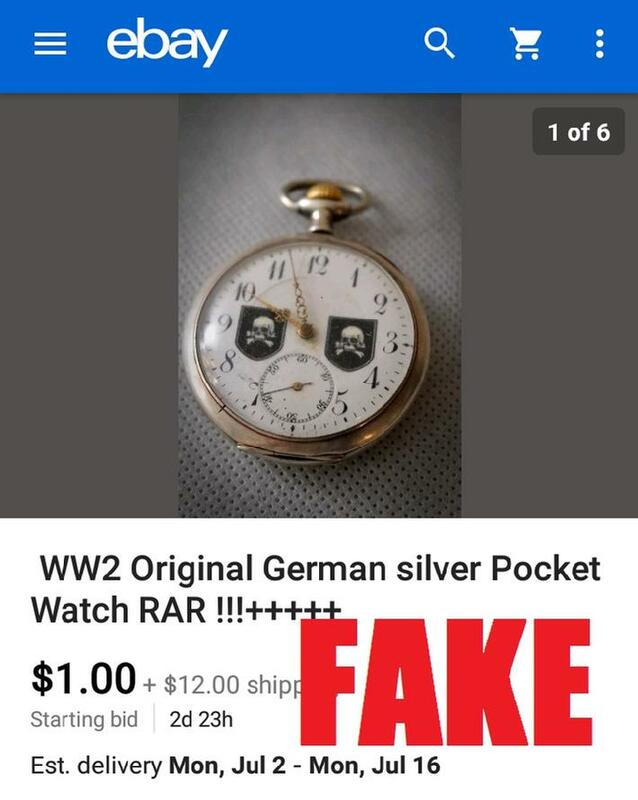 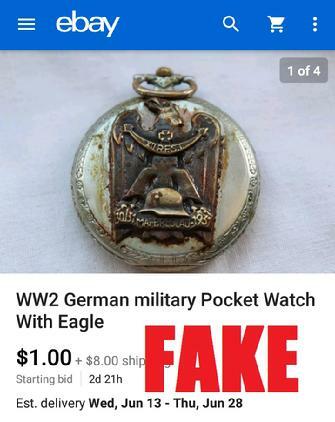 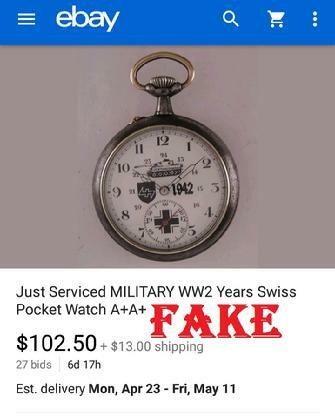 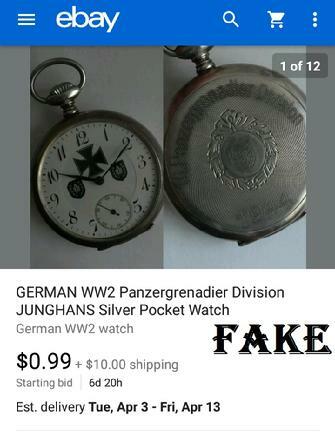 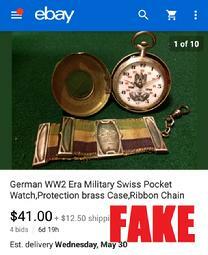 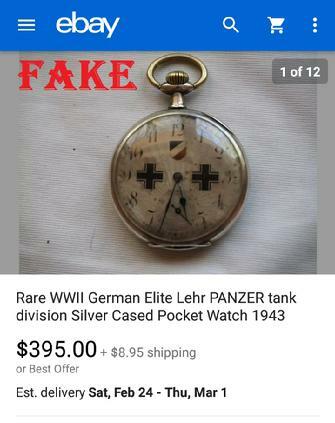 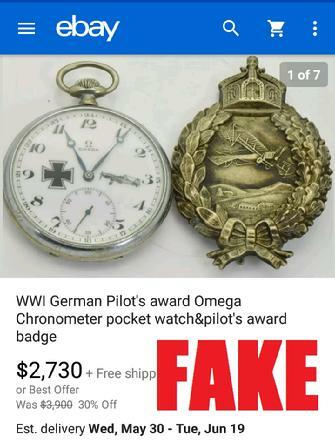 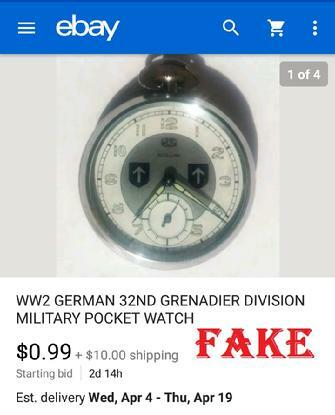 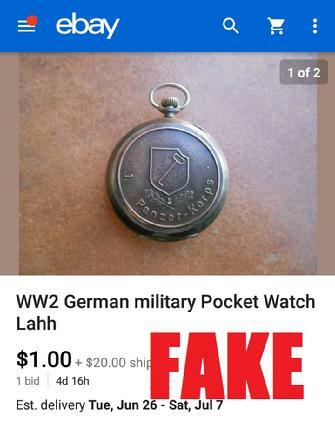 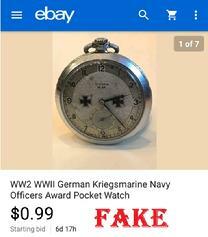 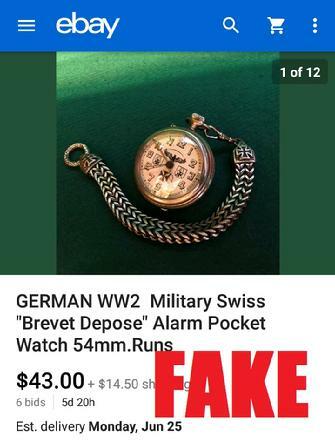 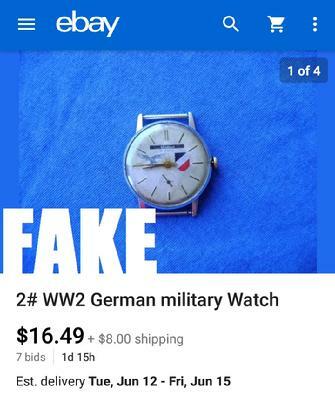 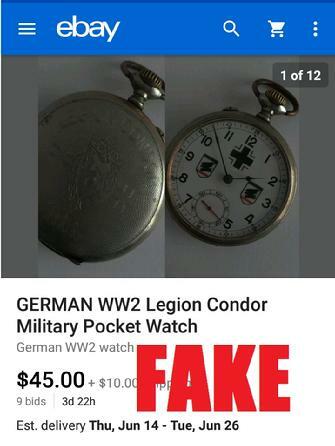 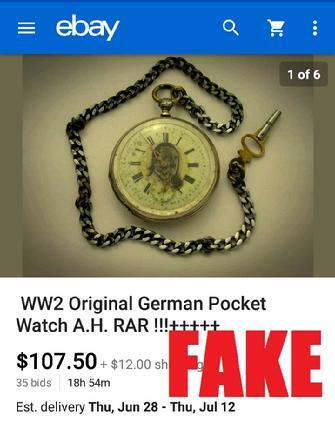 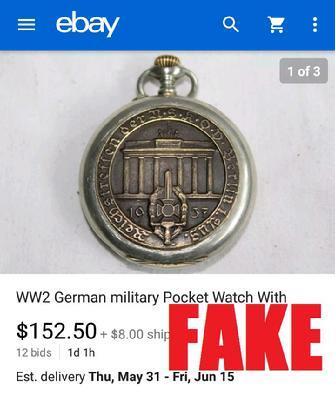 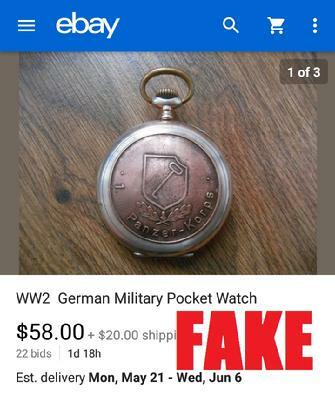 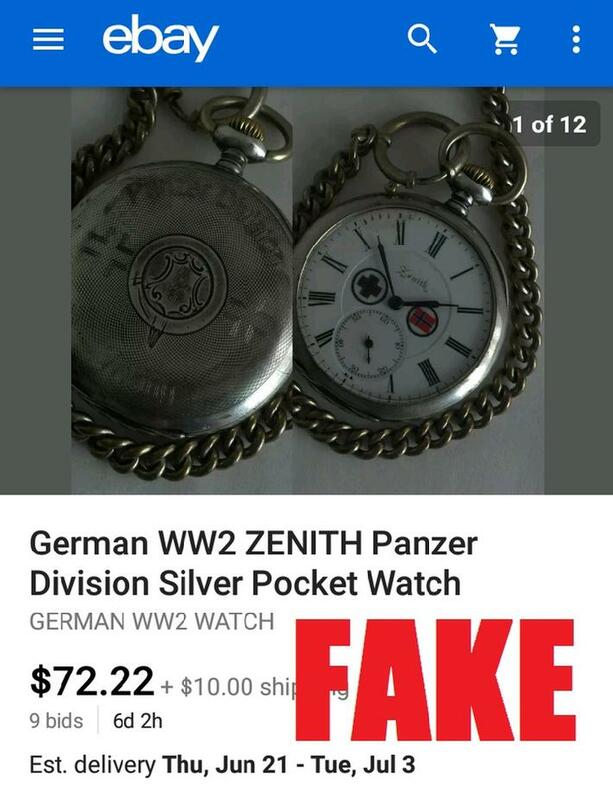 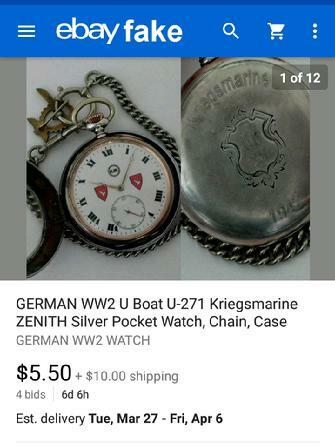 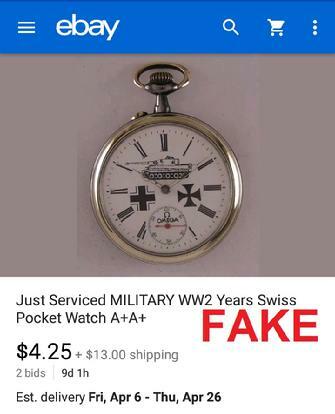 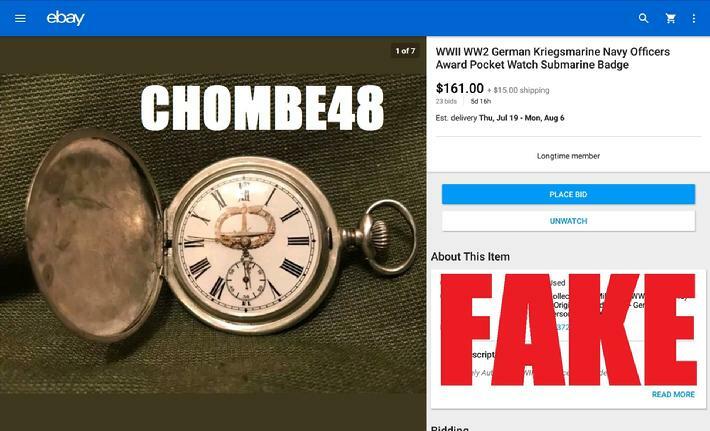 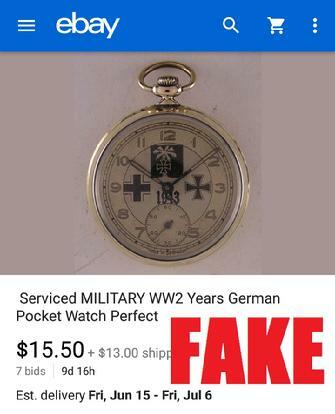 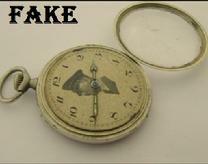 It’s sad how many of these worthless pieces of garbage have permeated the WW2 memorabilia market over the years. 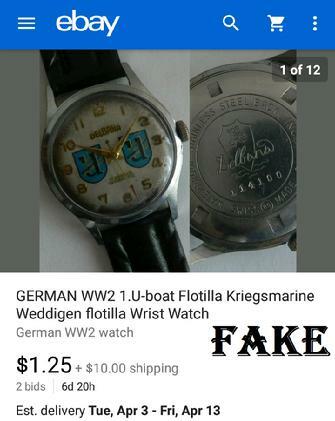 Many are brought in from Latvia, Lithuania, Poland, etc. 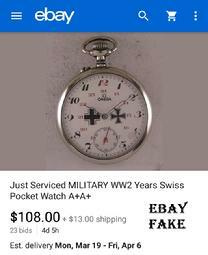 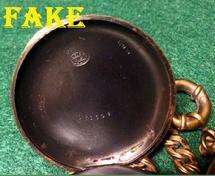 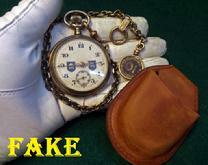 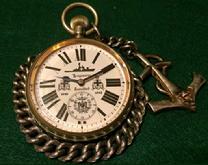 Some are frequently resold by US dealers on various auction sites. 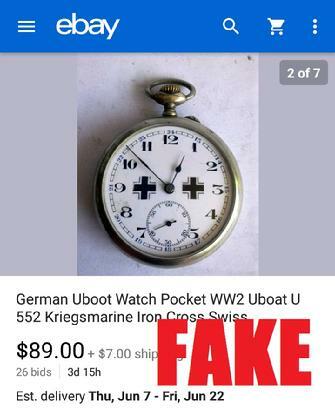 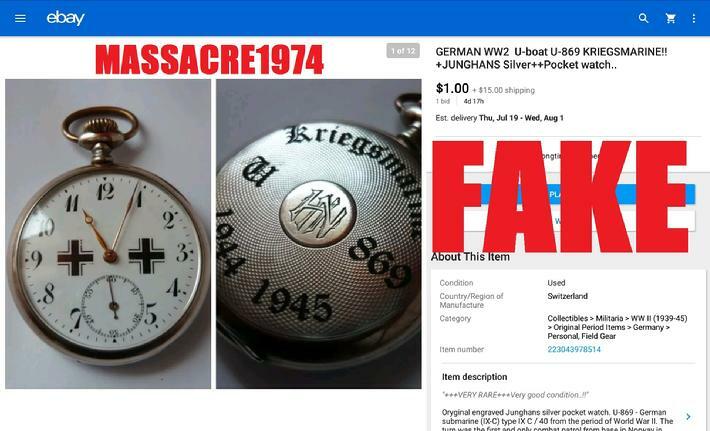 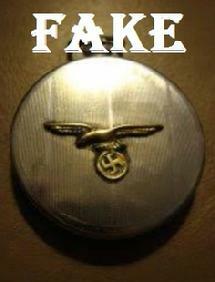 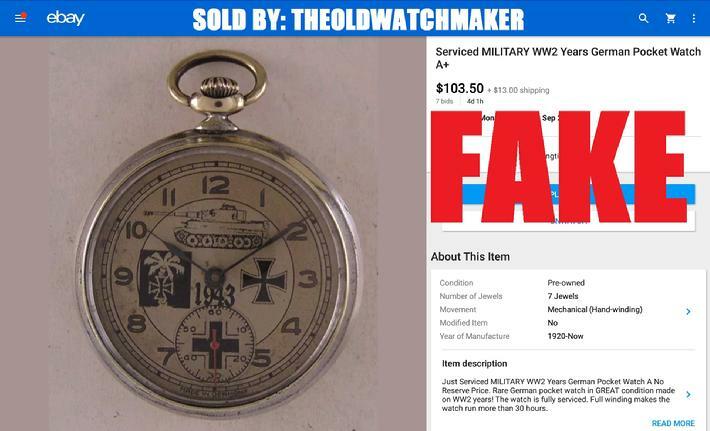 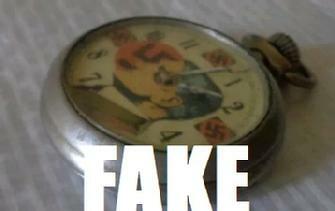 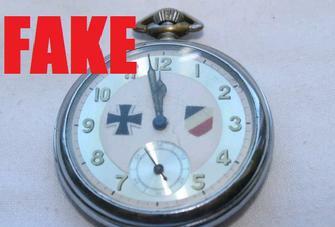 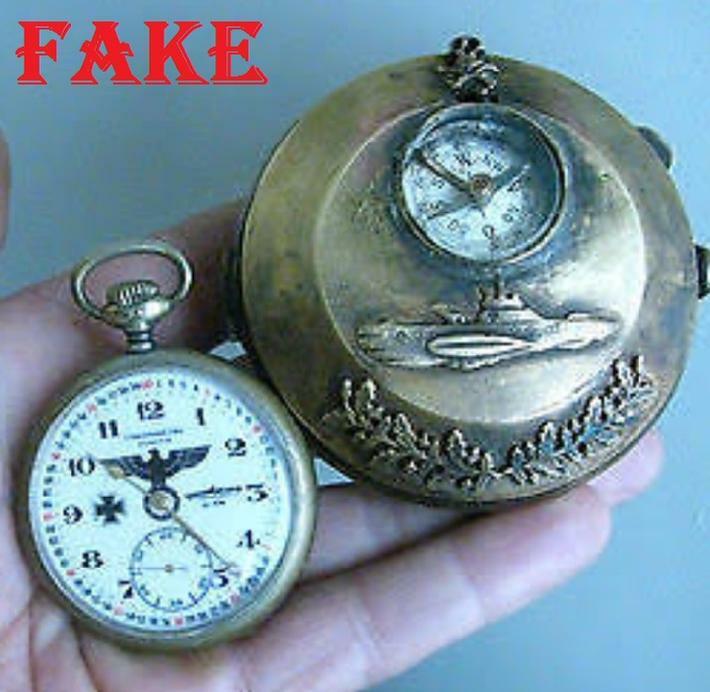 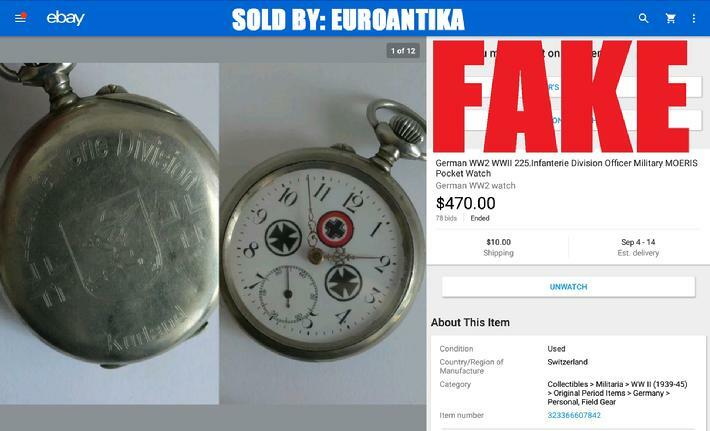 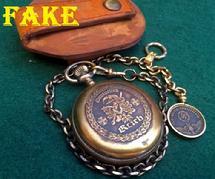 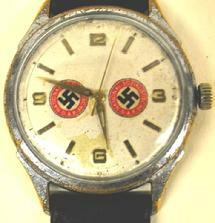 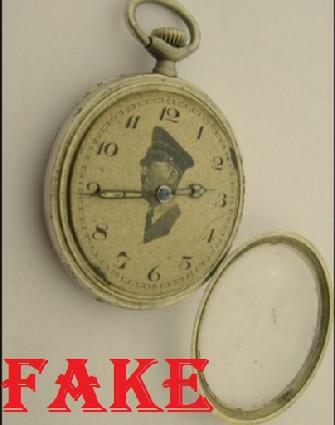 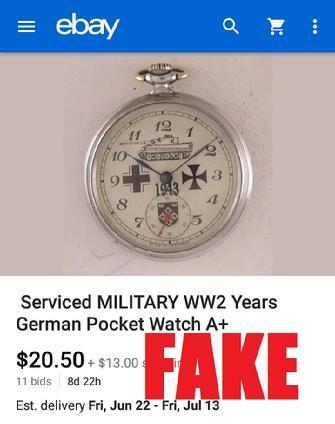 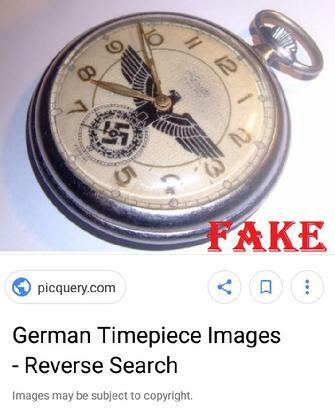 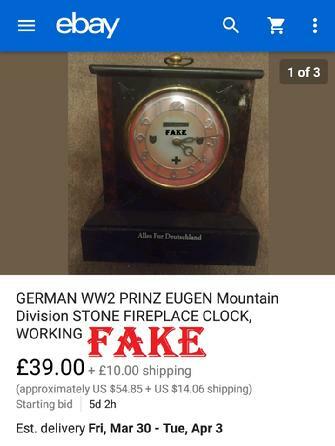 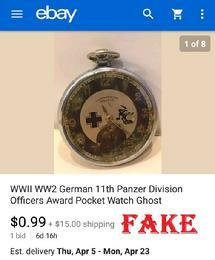 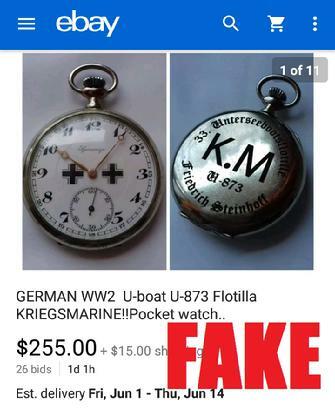 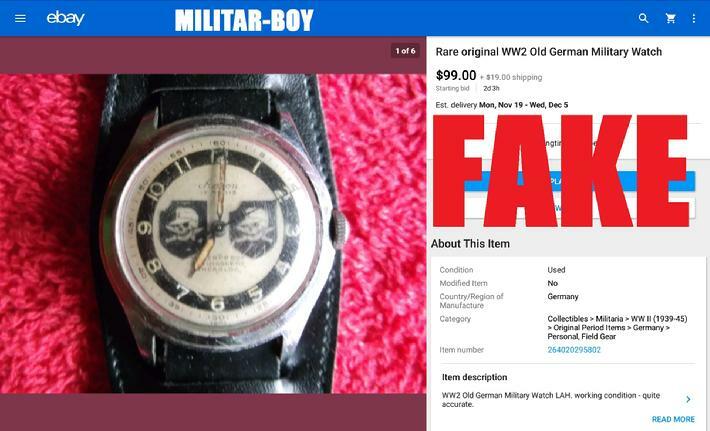 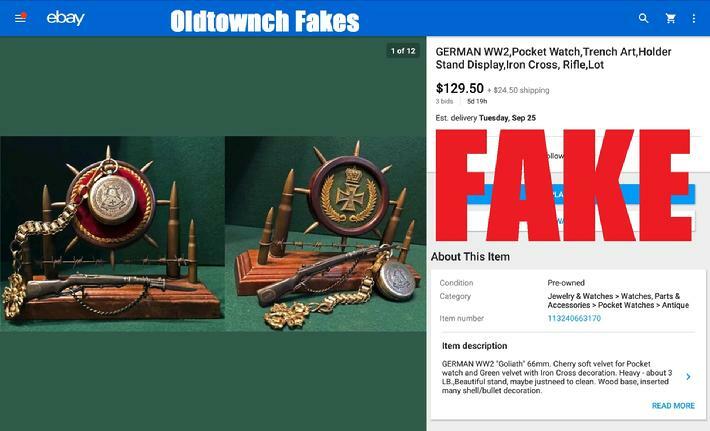 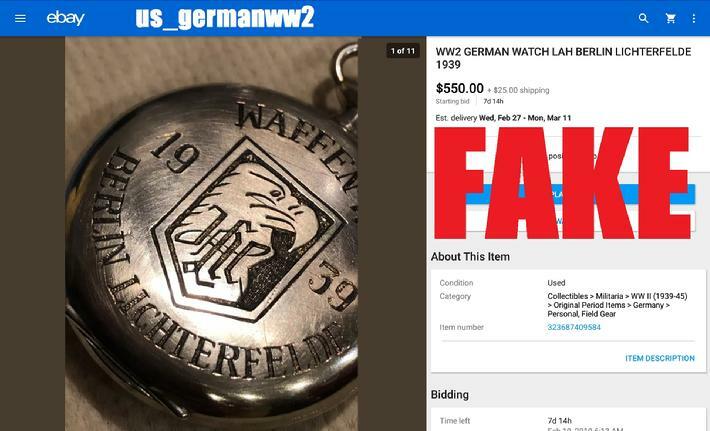 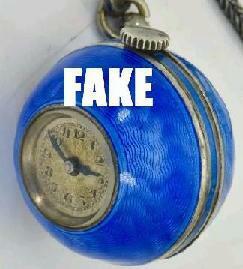 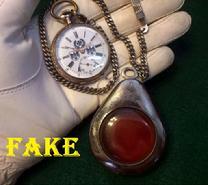 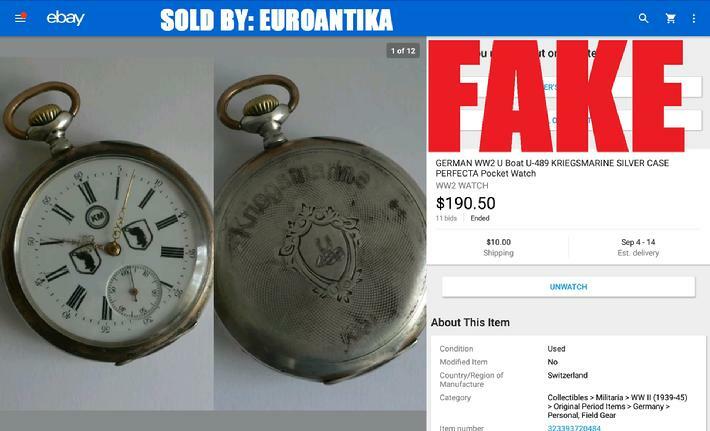 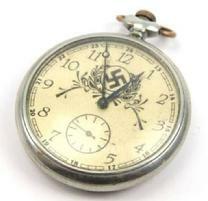 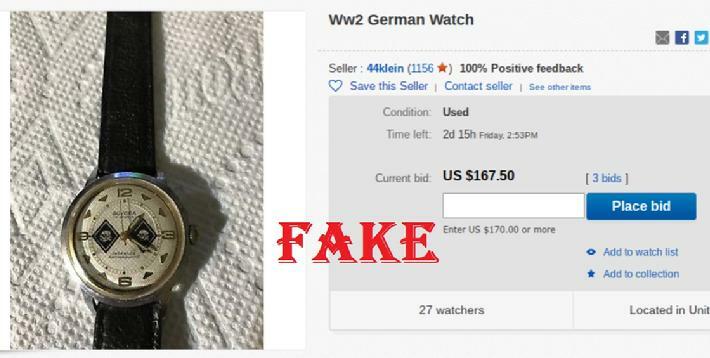 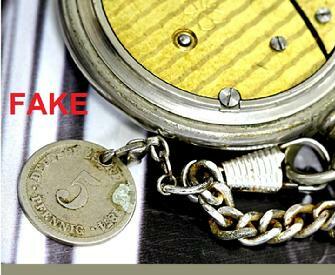 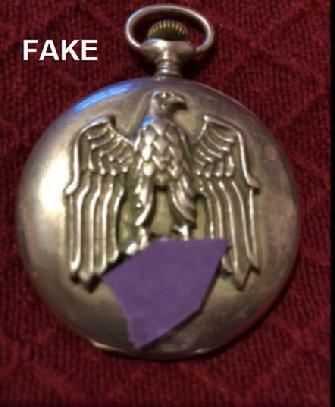 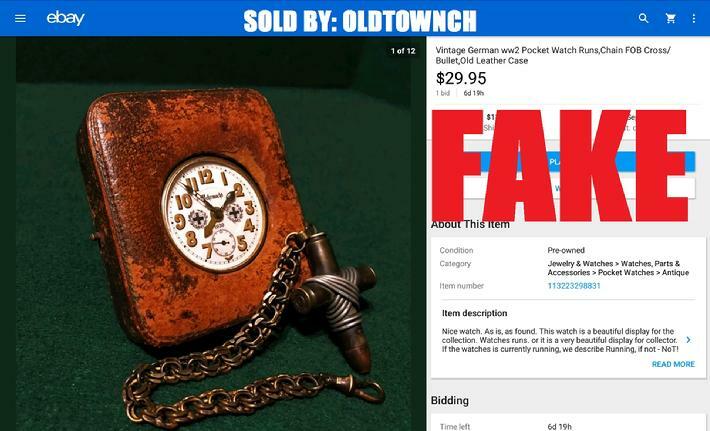 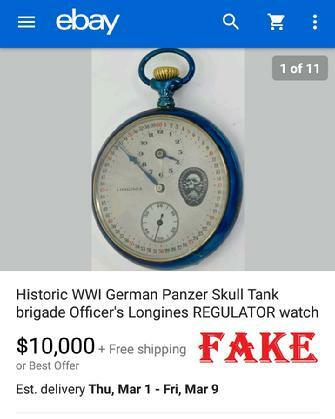 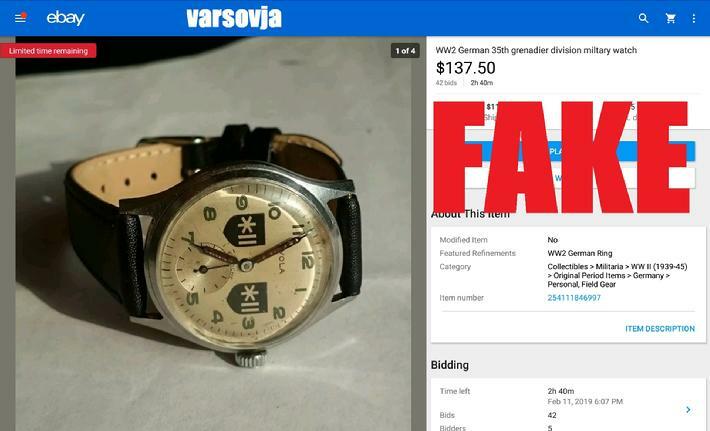 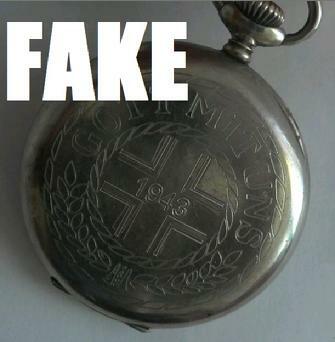 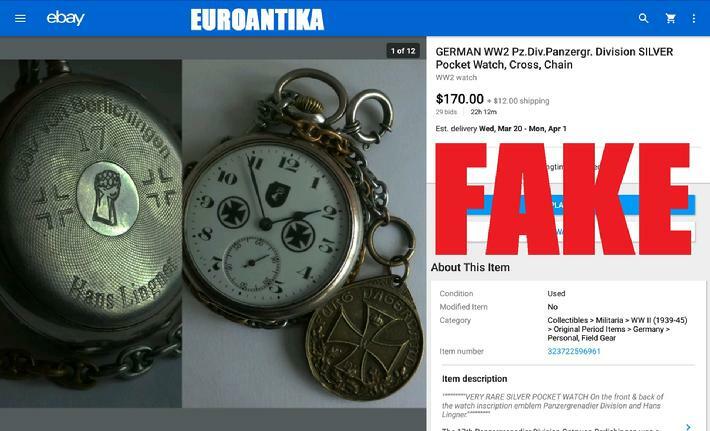 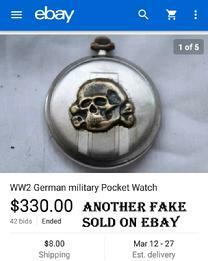 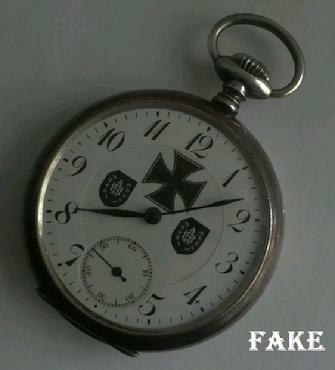 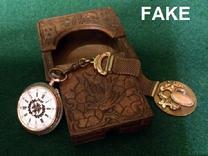 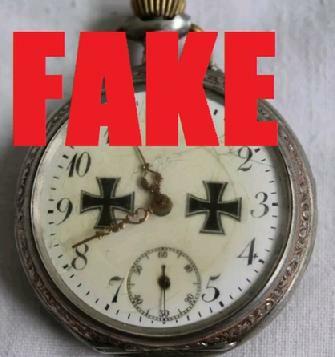 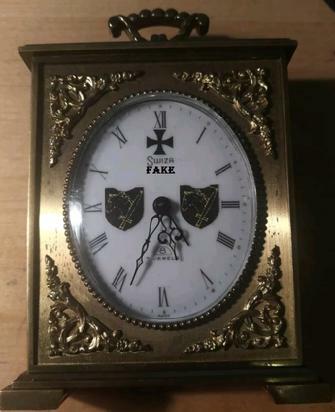 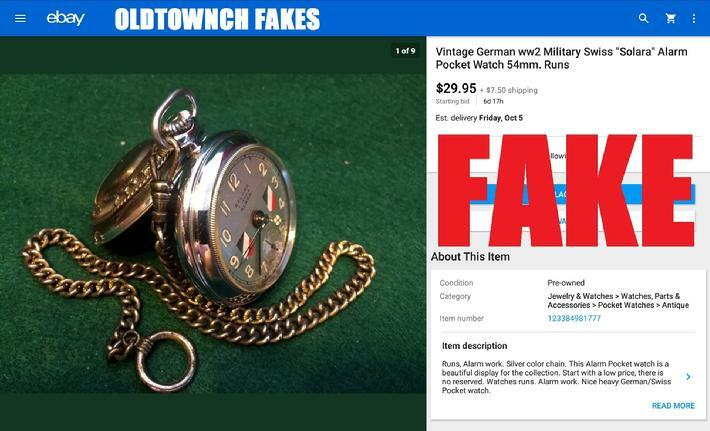 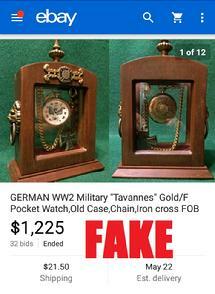 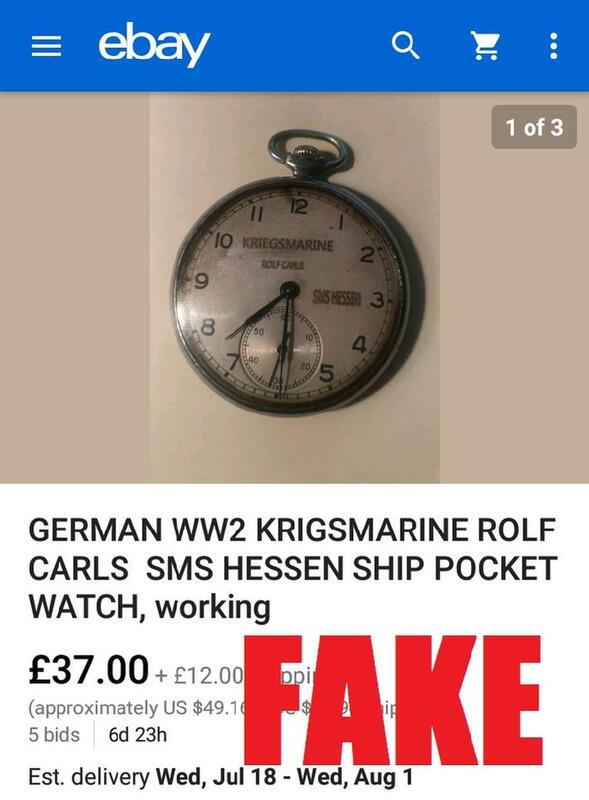 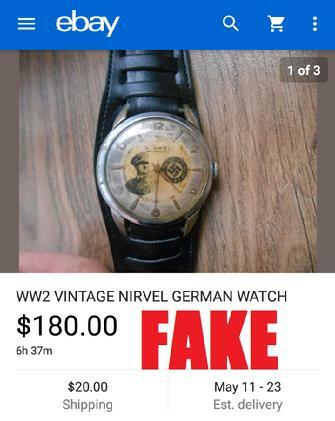 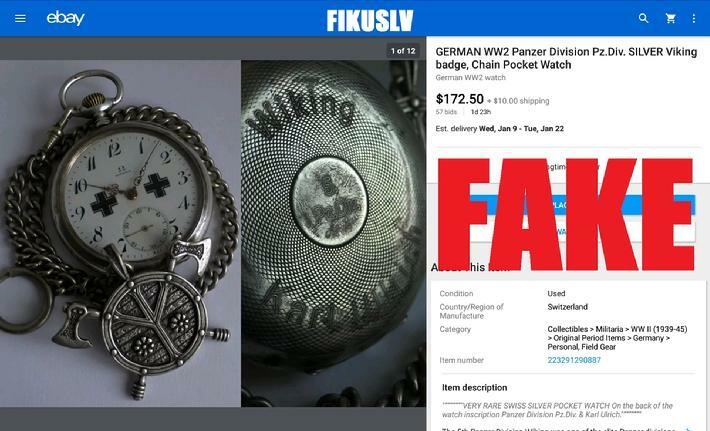 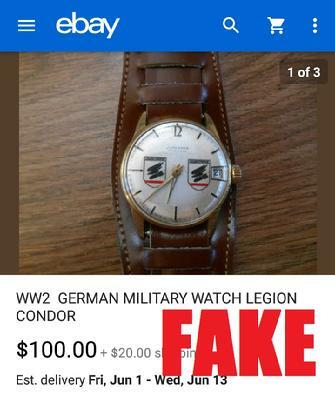 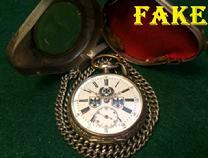 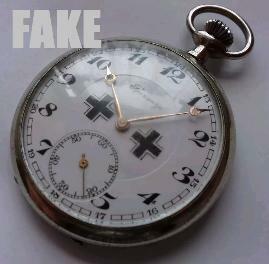 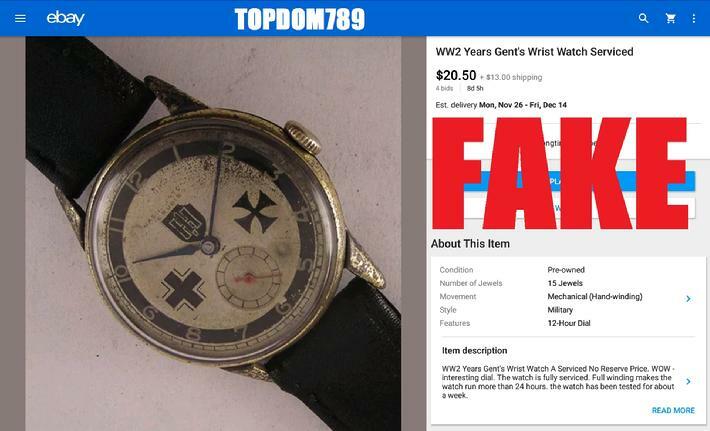 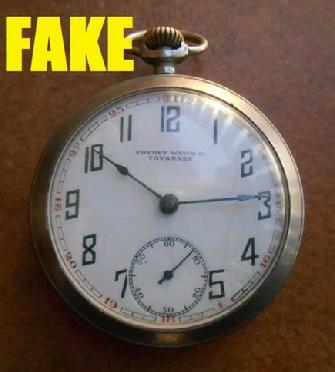 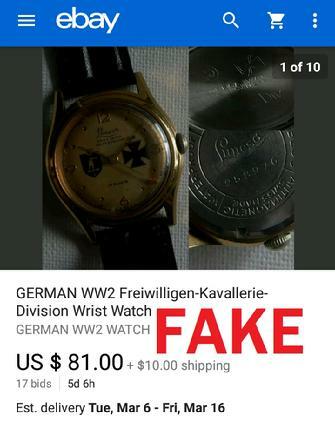 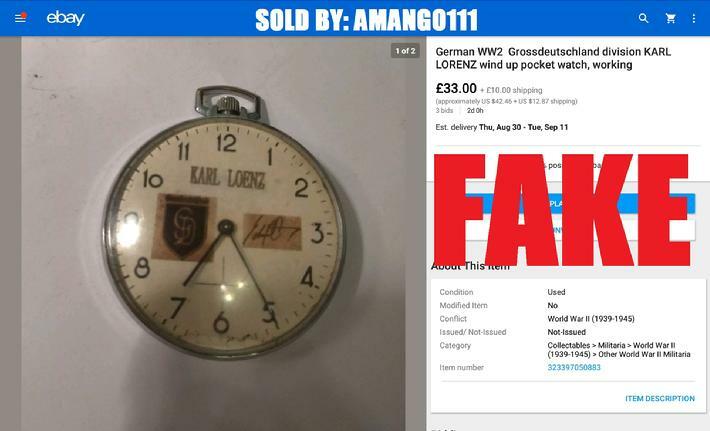 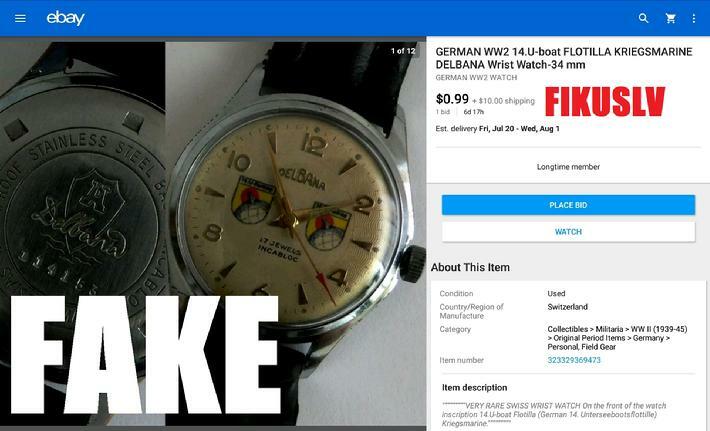 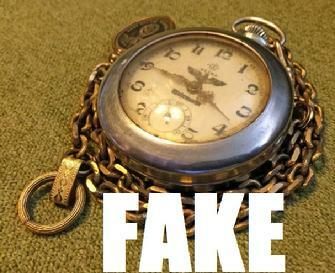 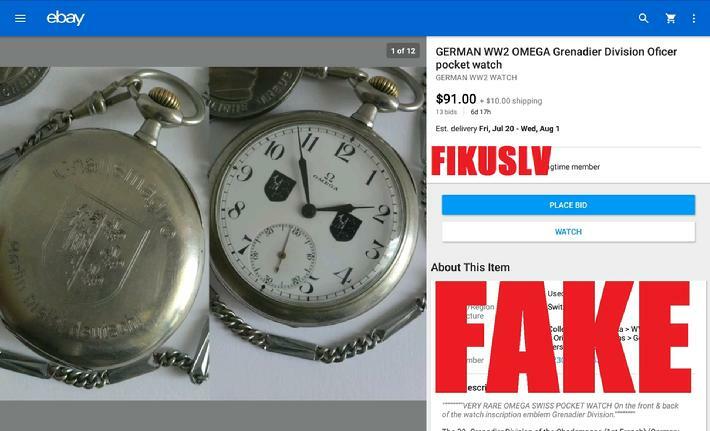 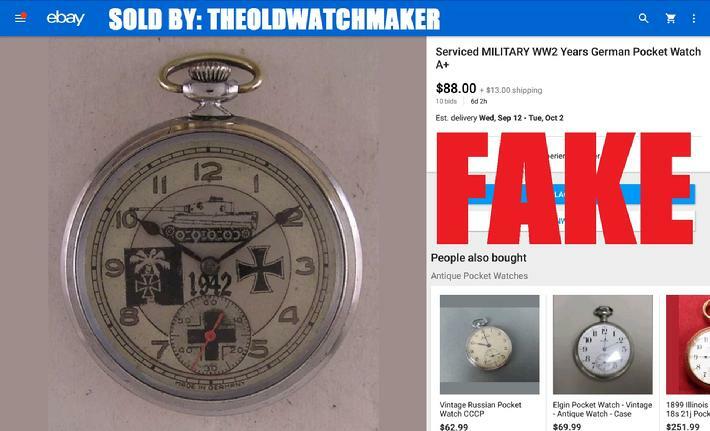 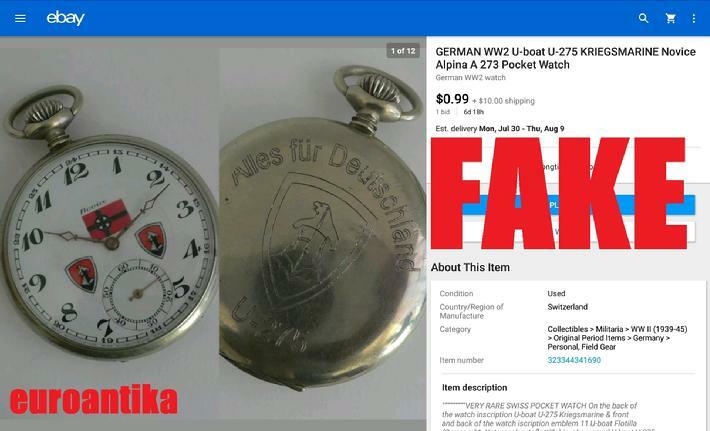 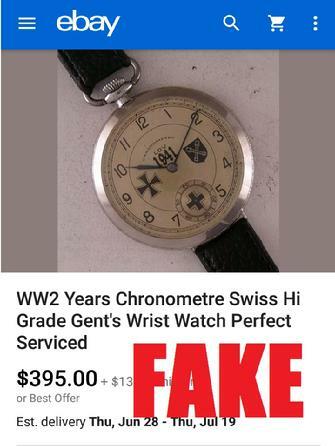 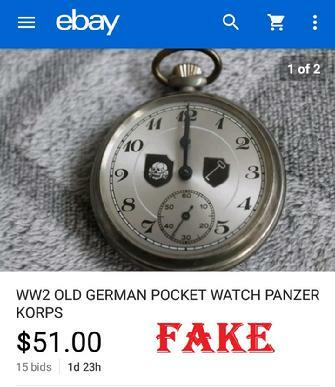 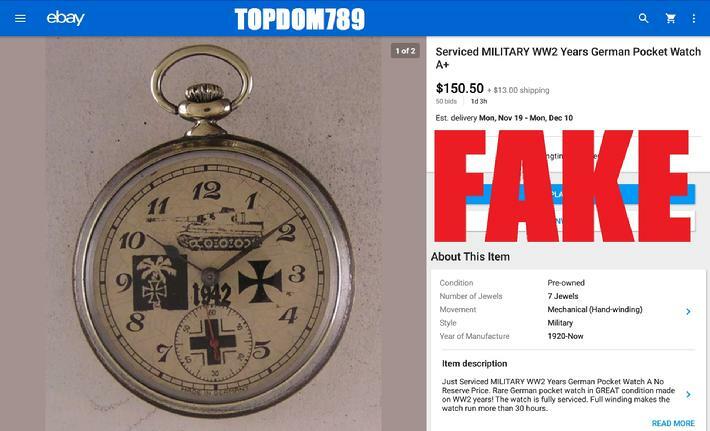 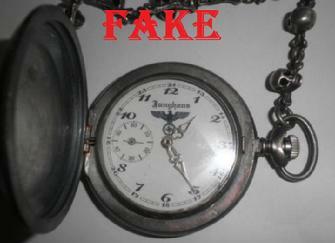 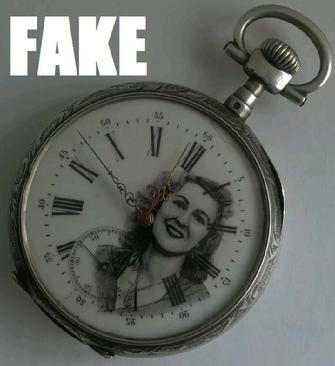 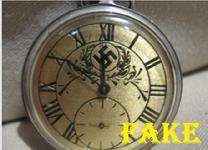 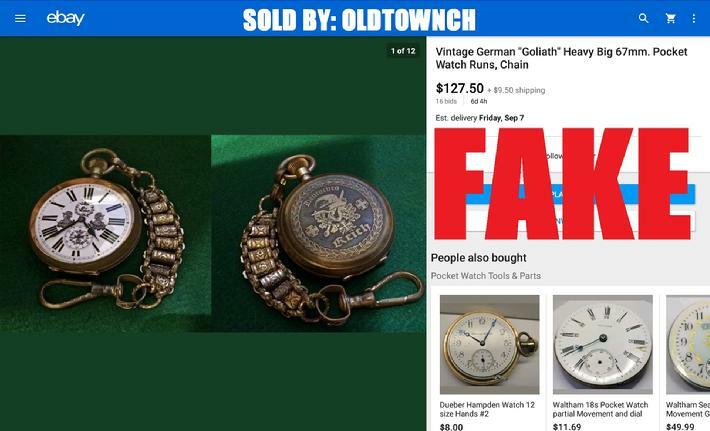 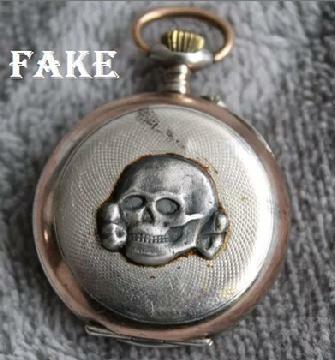 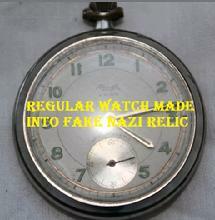 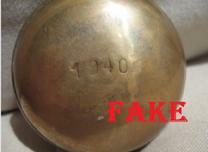 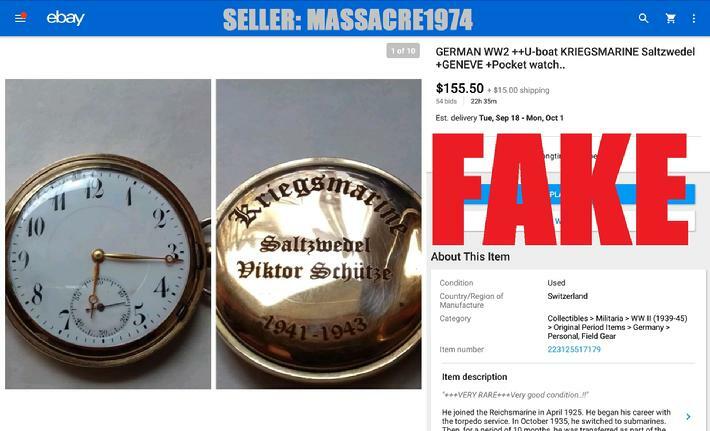 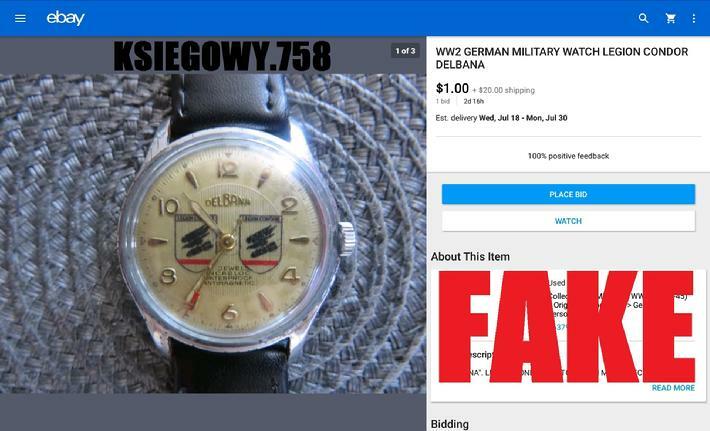 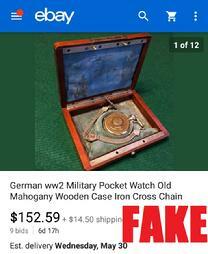 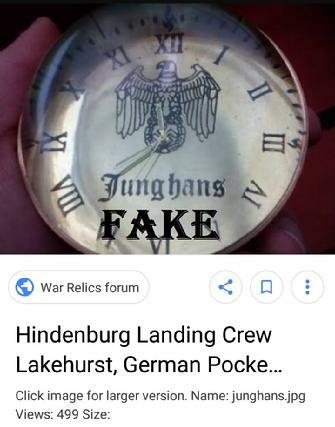 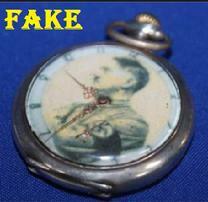 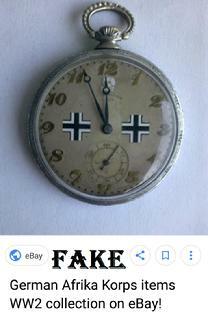 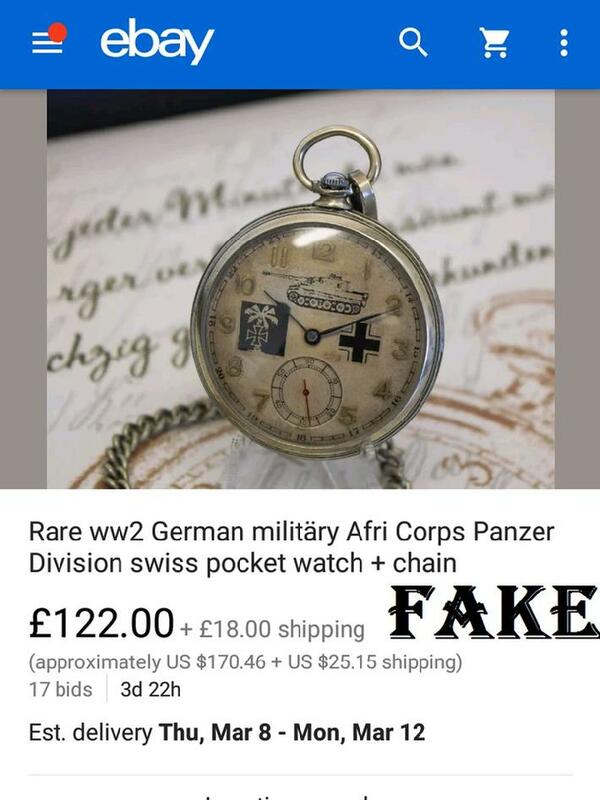 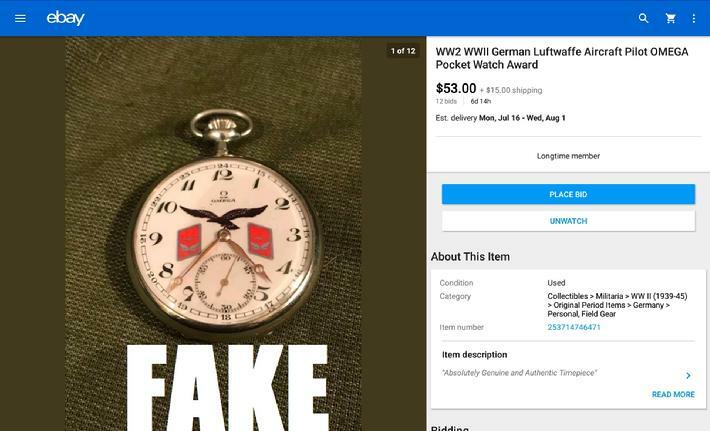 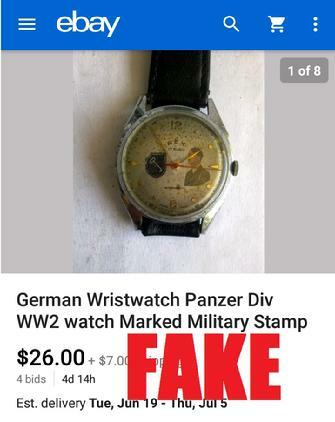 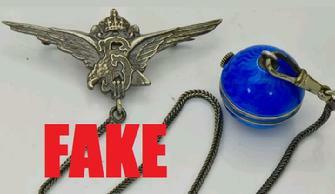 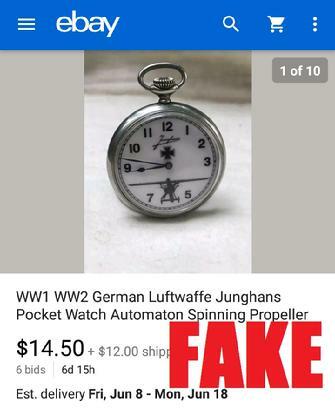 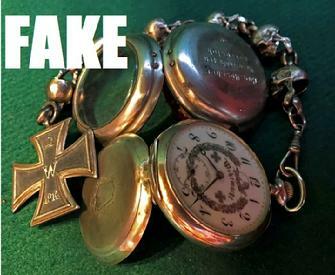 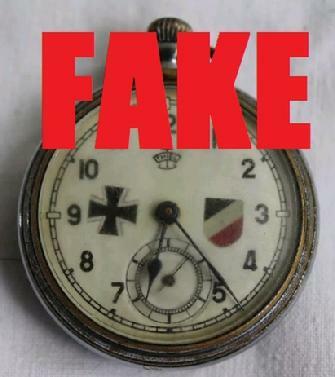 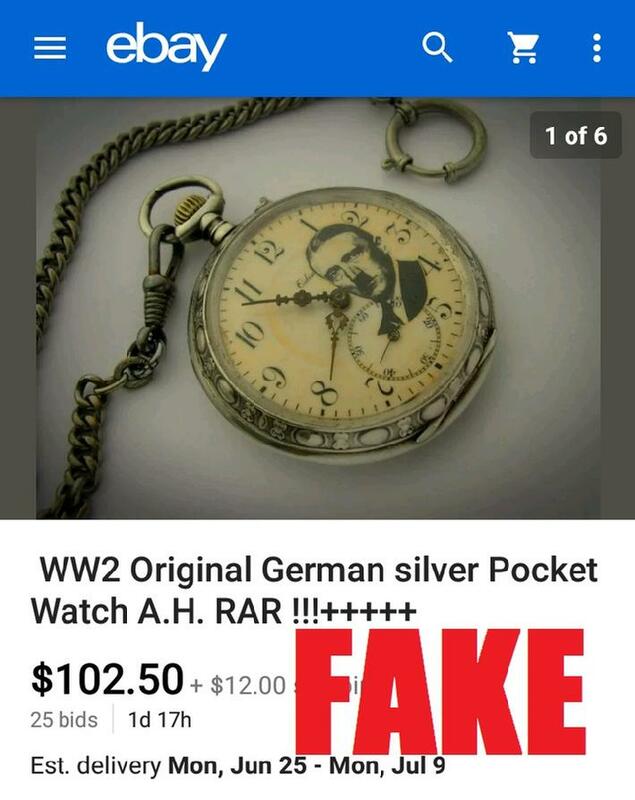 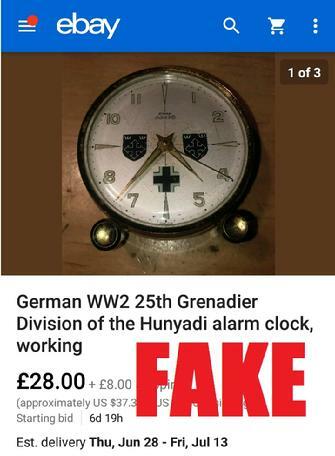 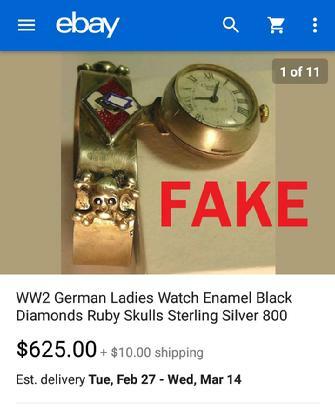 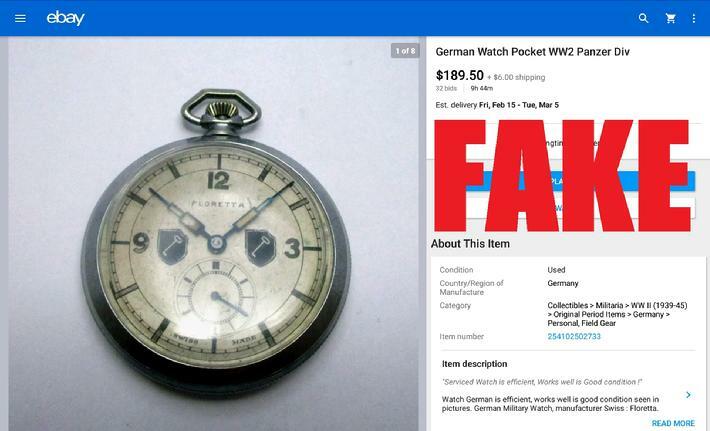 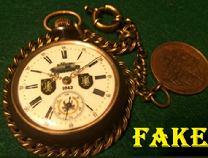 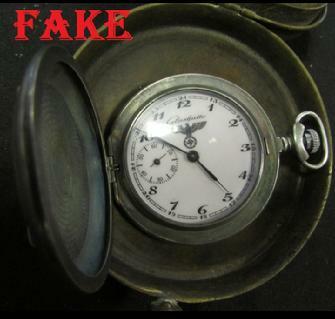 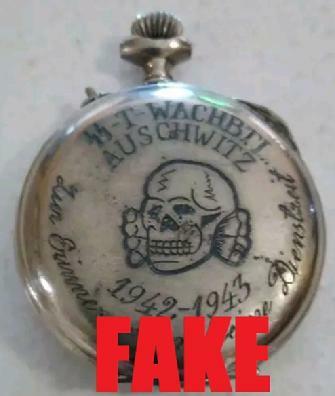 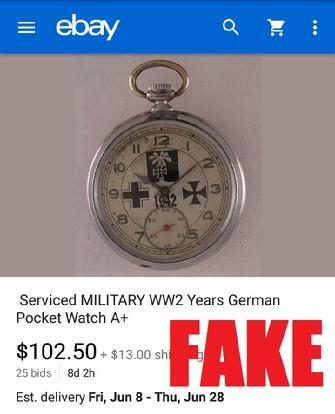 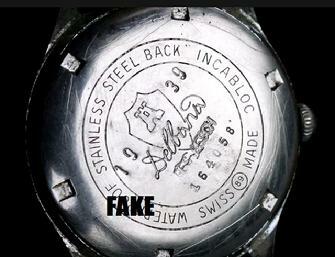 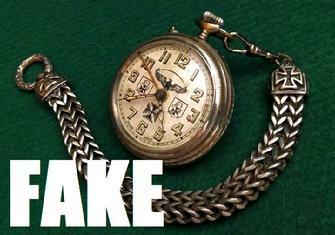 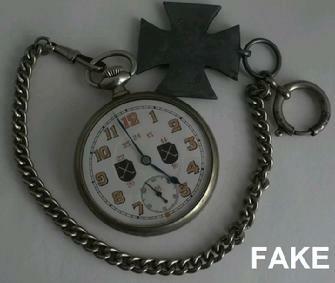 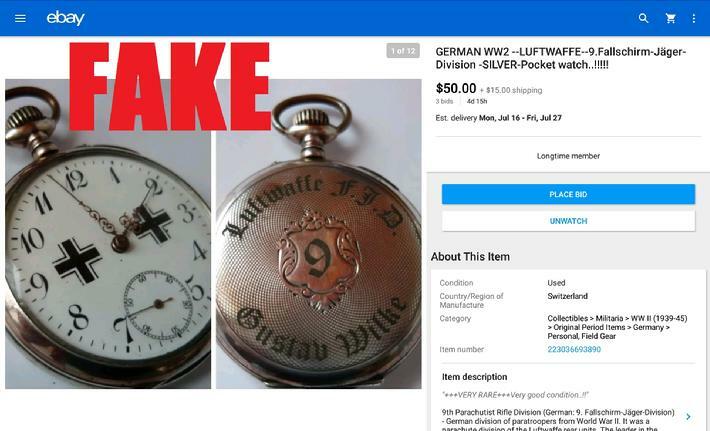 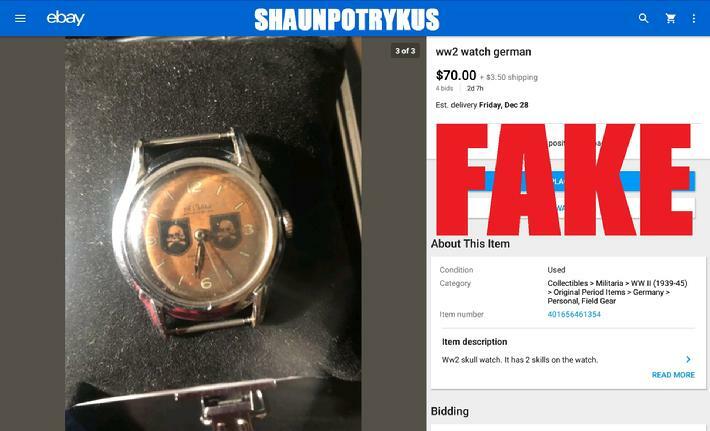 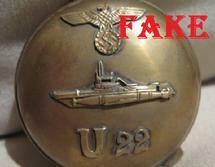 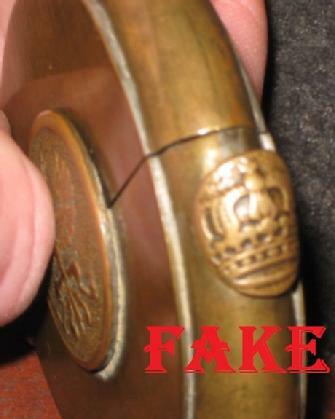 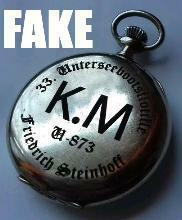 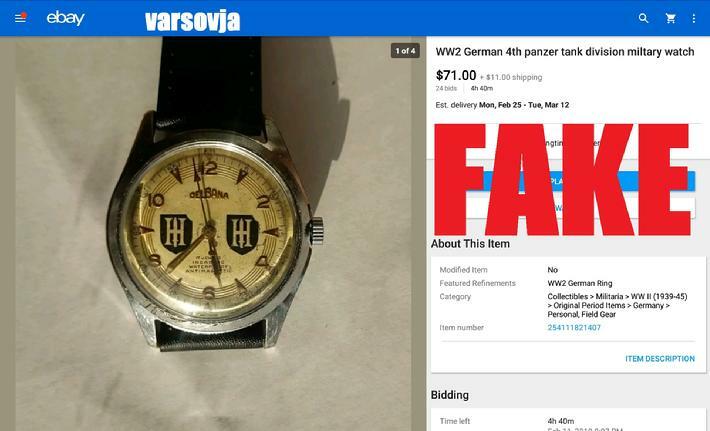 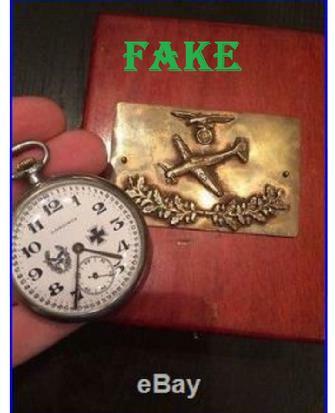 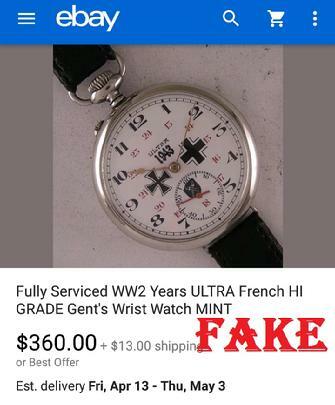 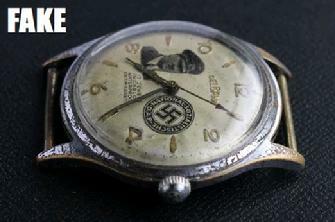 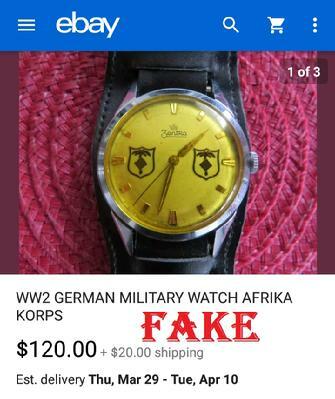 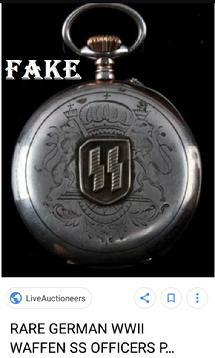 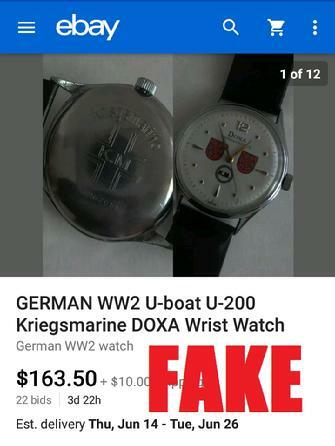 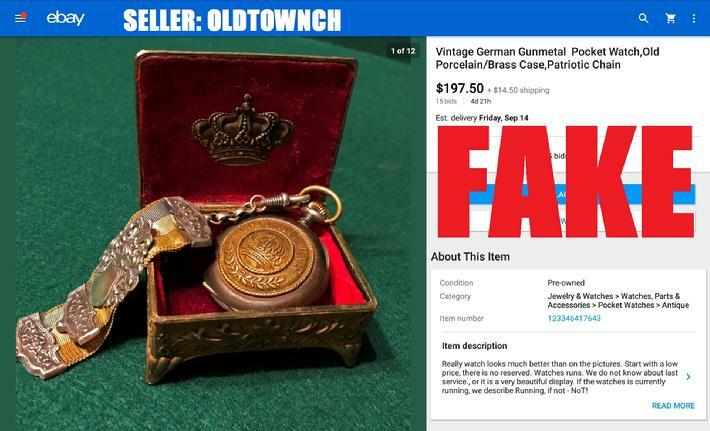 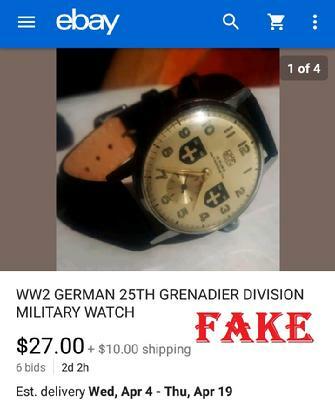 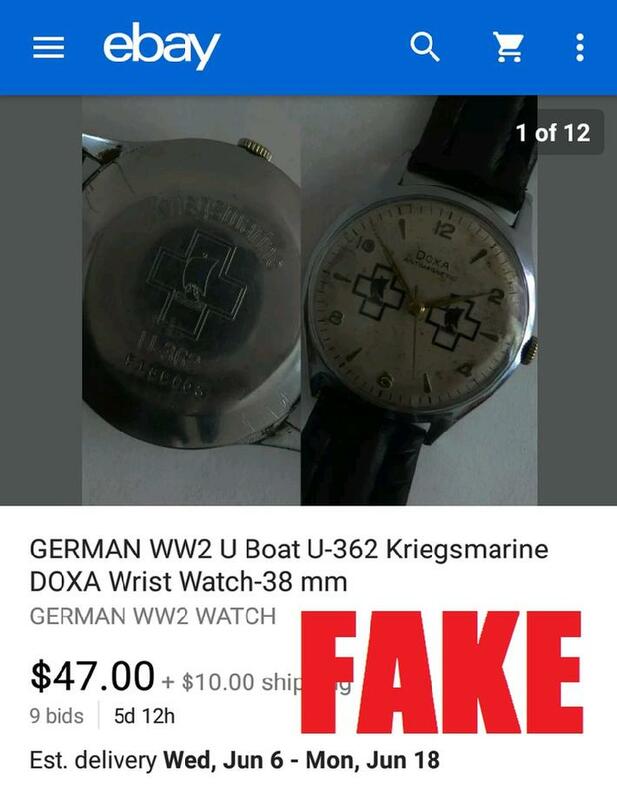 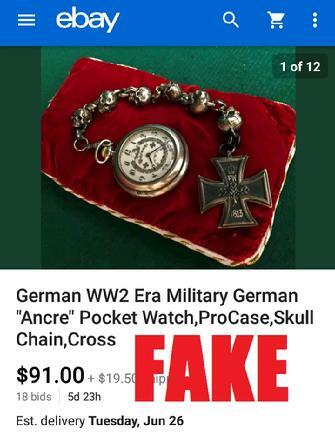 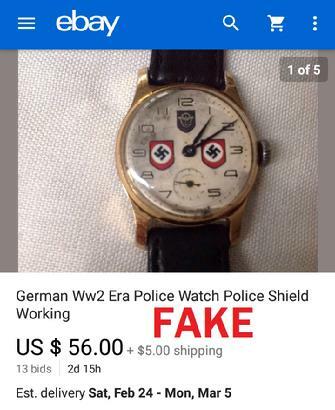 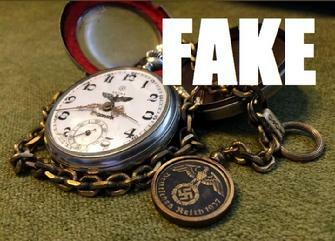 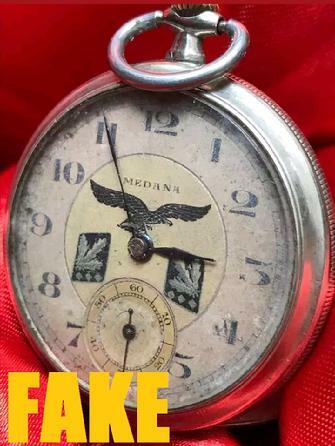 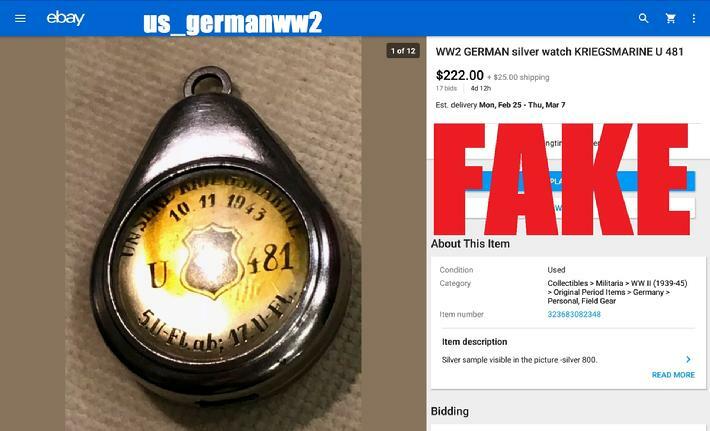 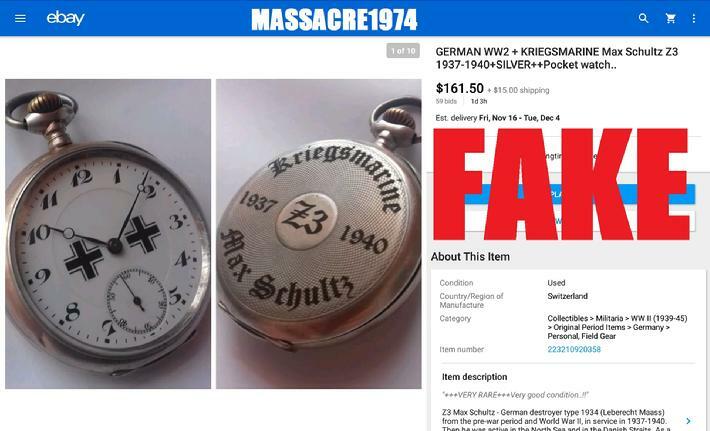 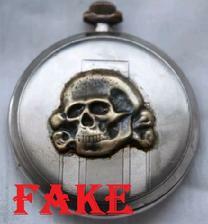 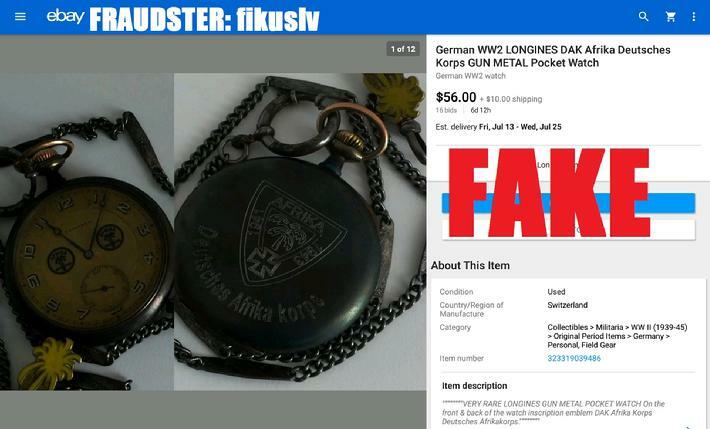 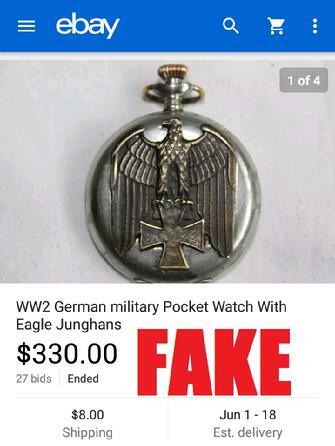 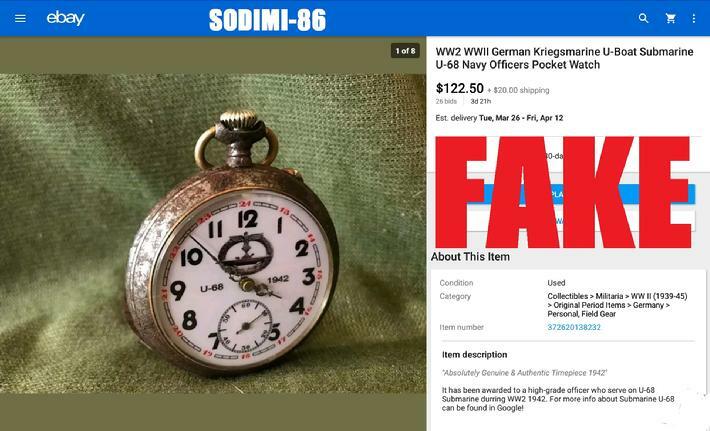 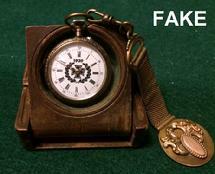 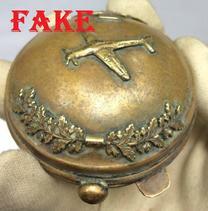 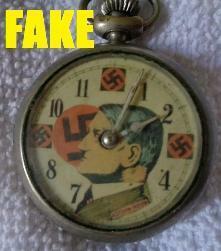 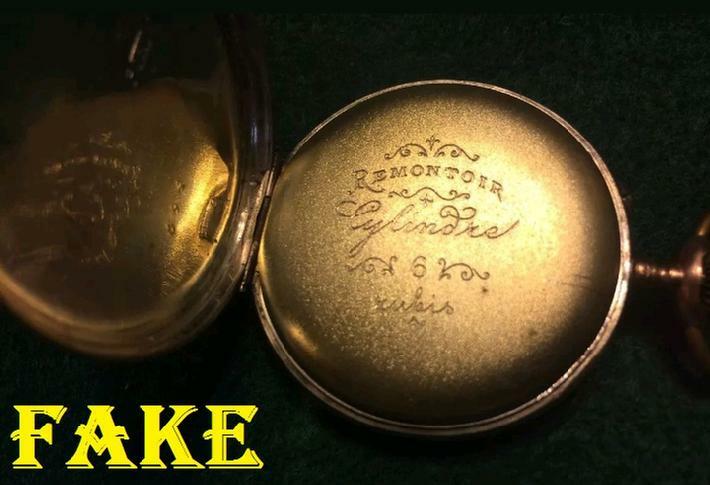 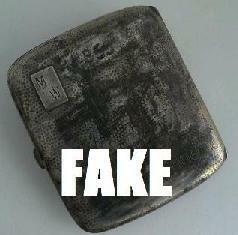 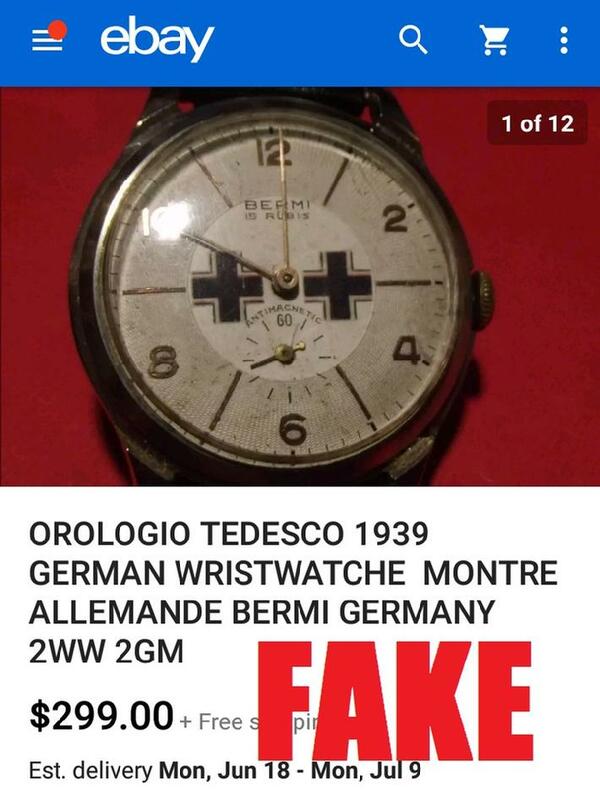 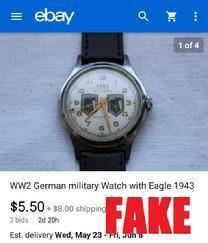 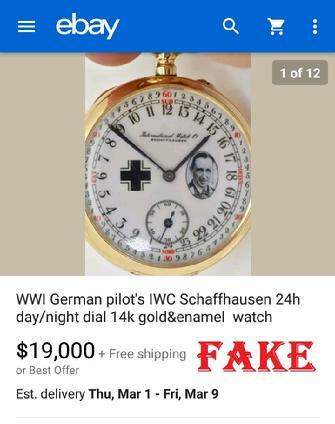 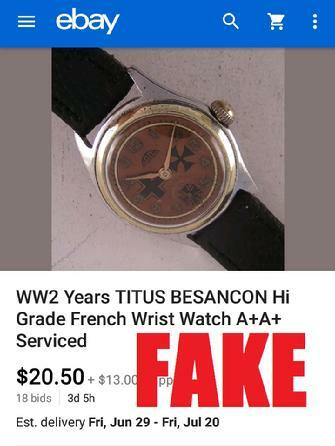 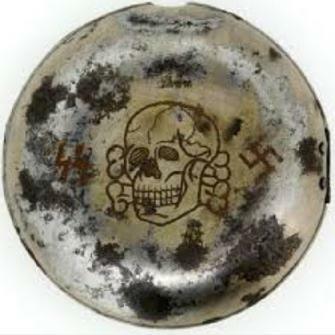 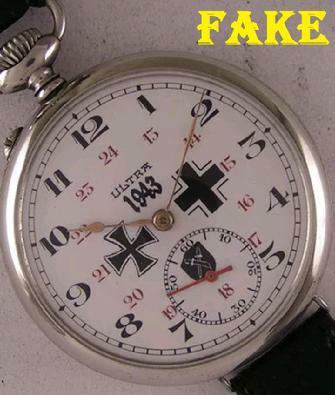 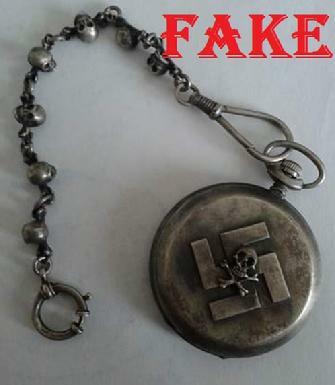 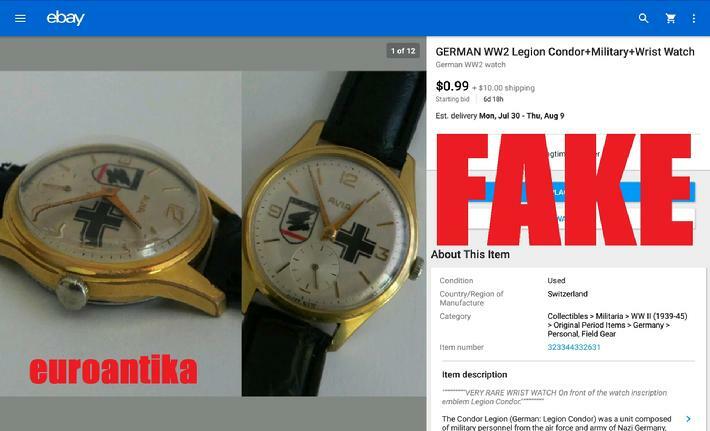 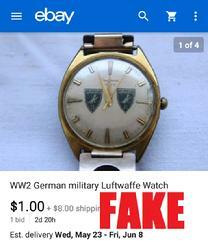 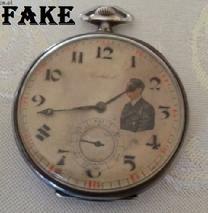 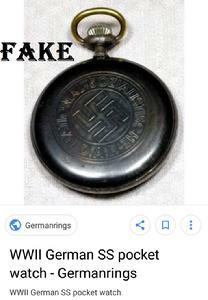 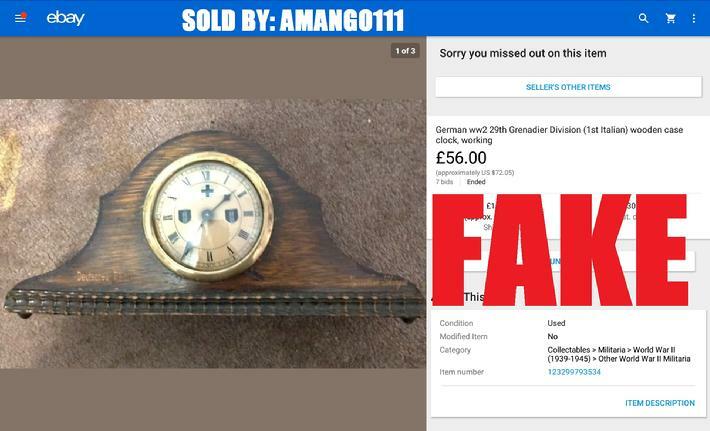 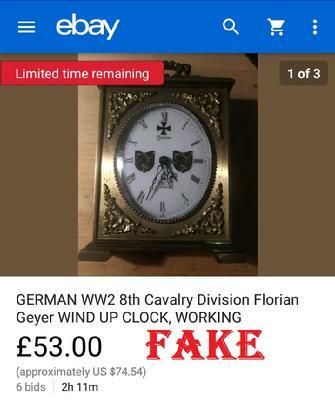 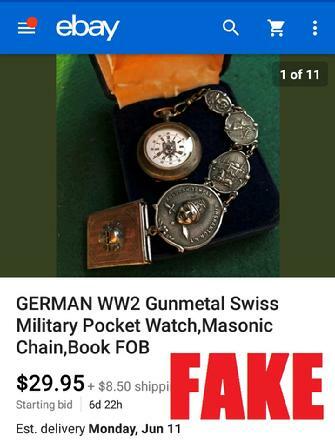 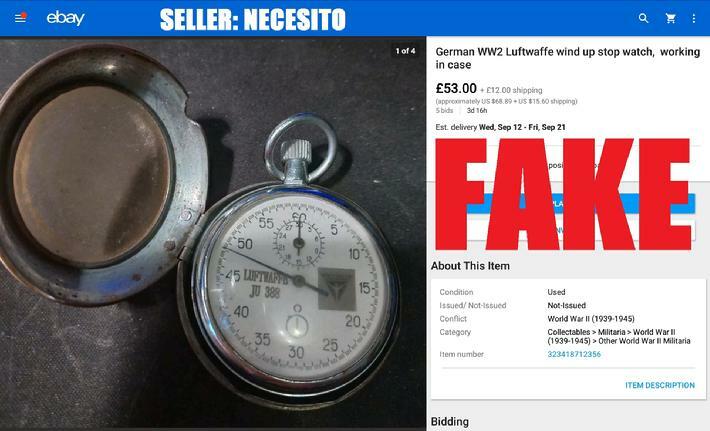 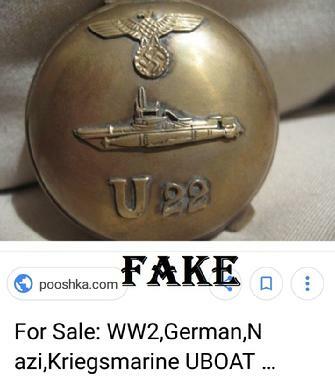 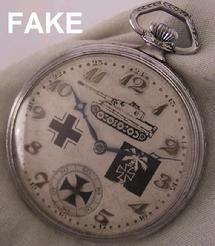 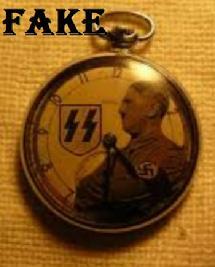 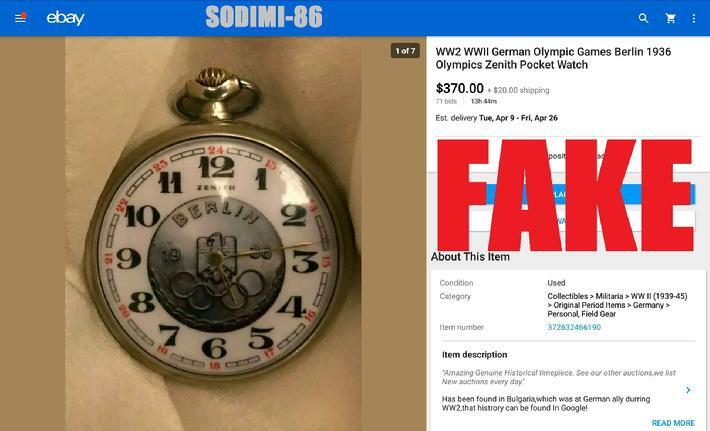 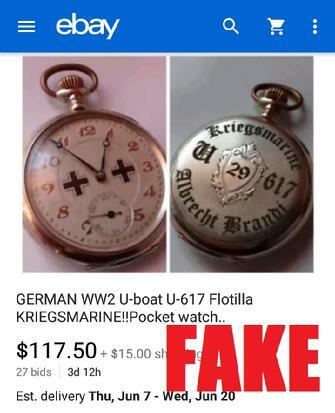 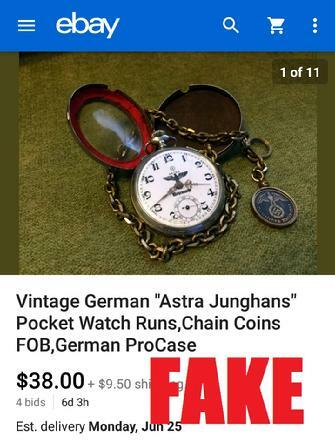 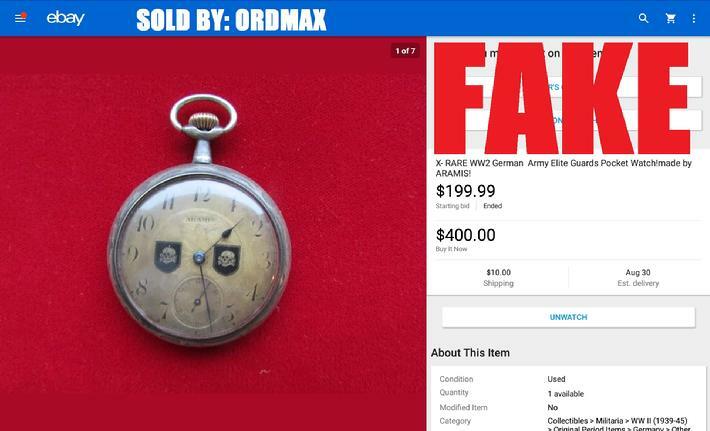 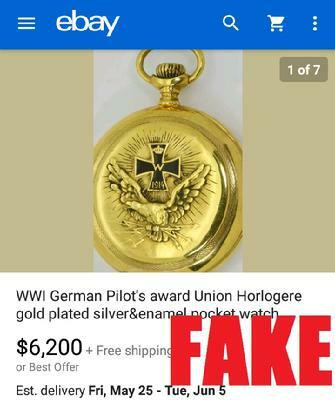 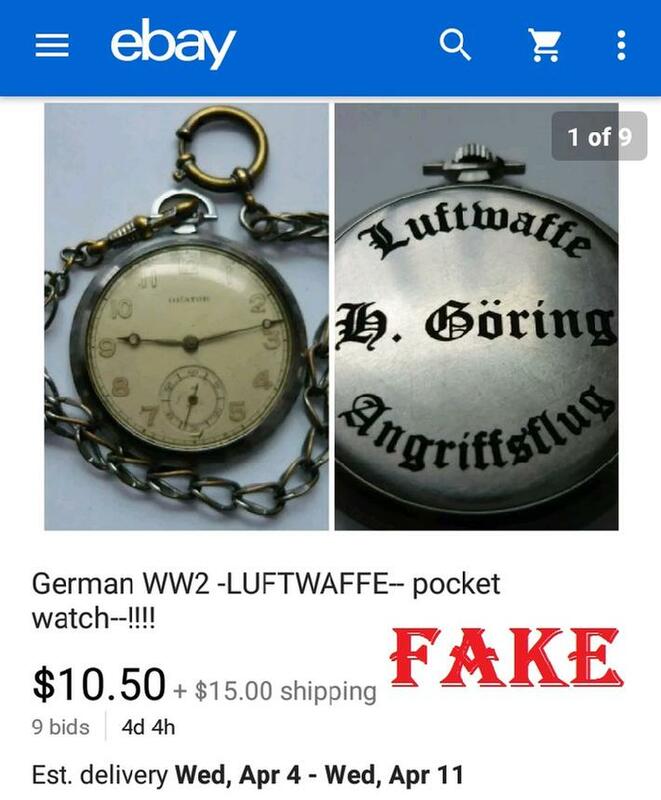 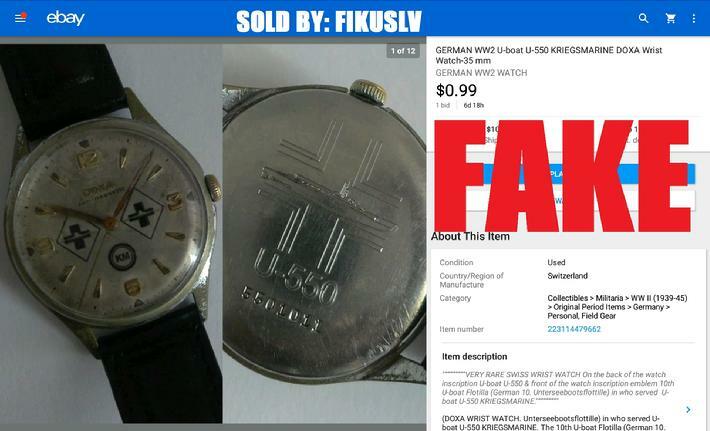 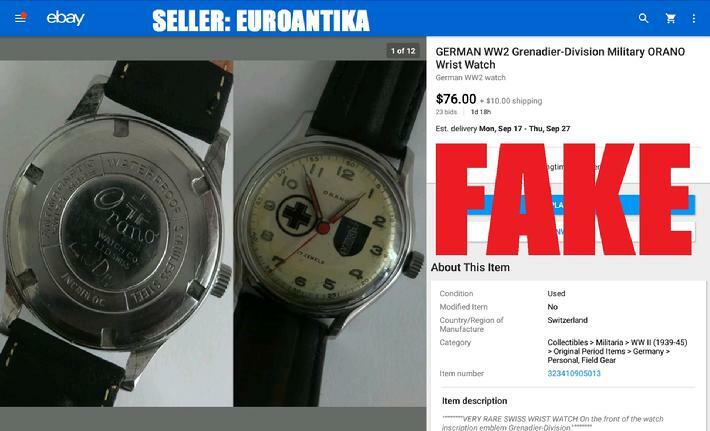 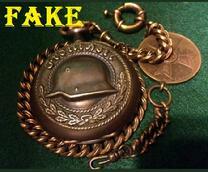 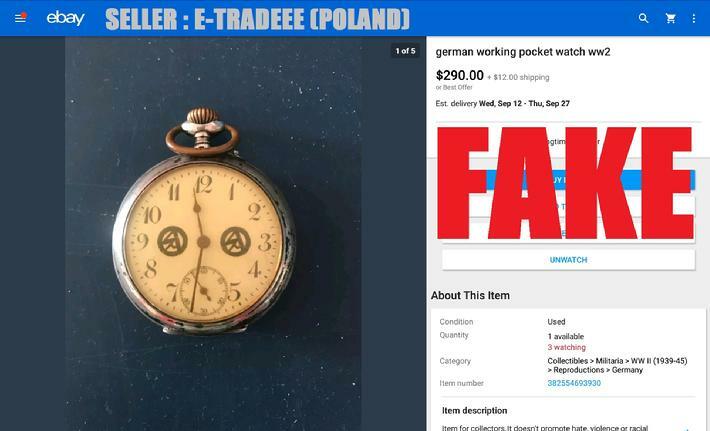 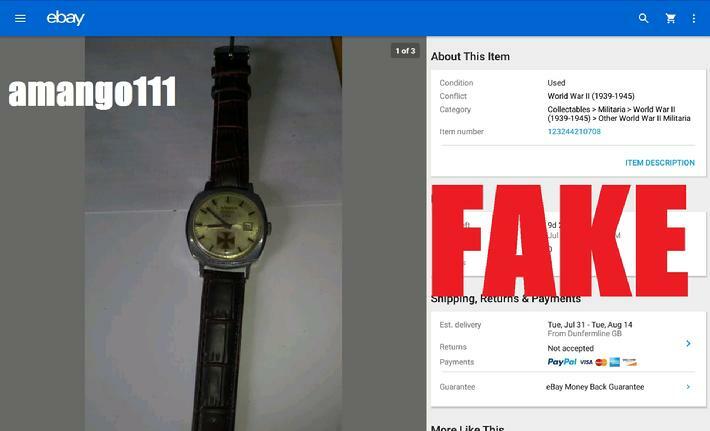 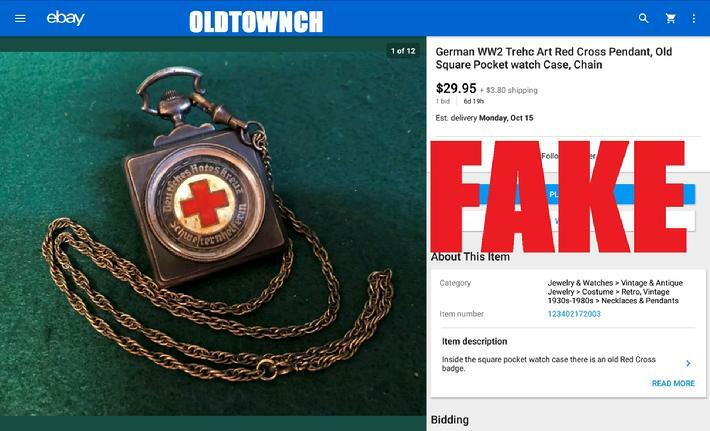 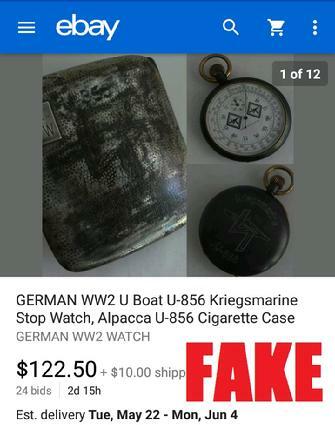 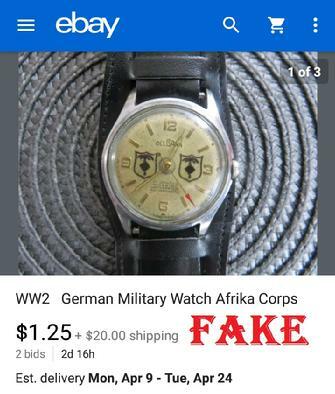 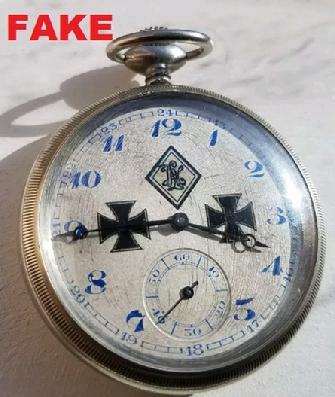 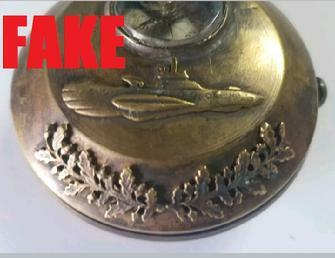 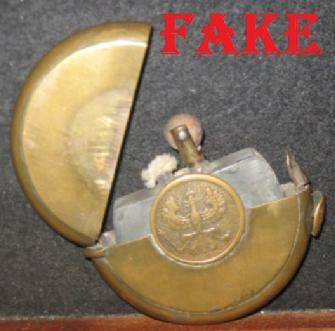 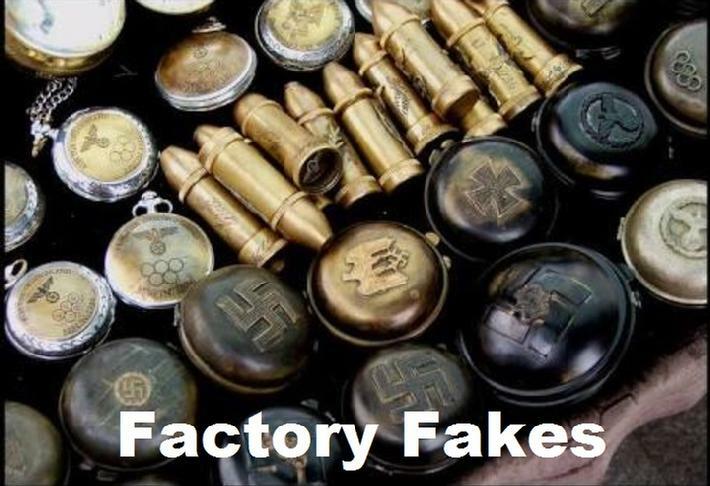 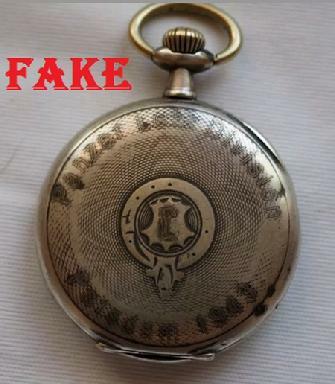 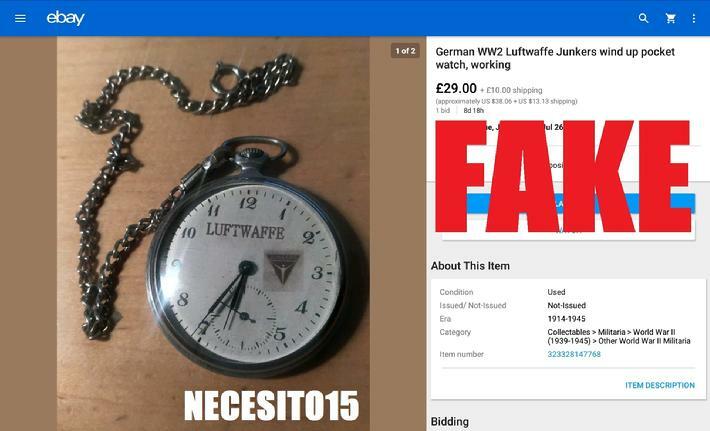 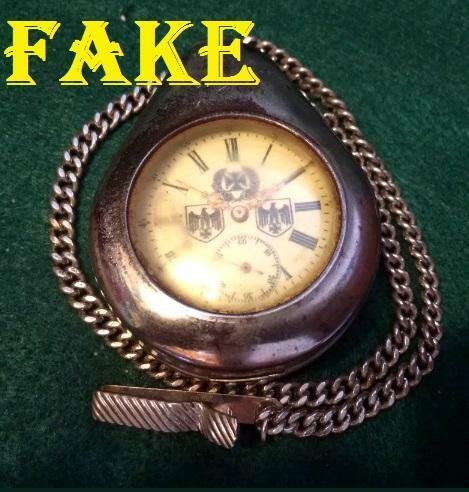 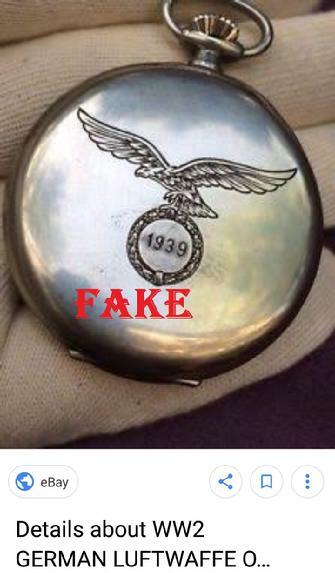 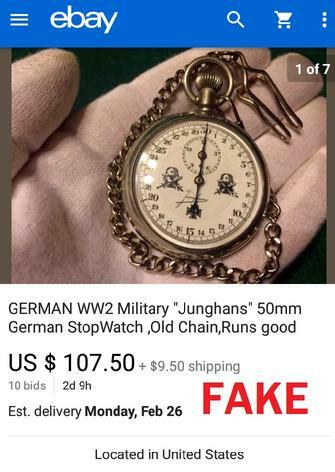 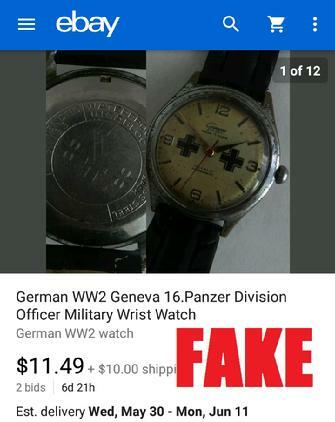 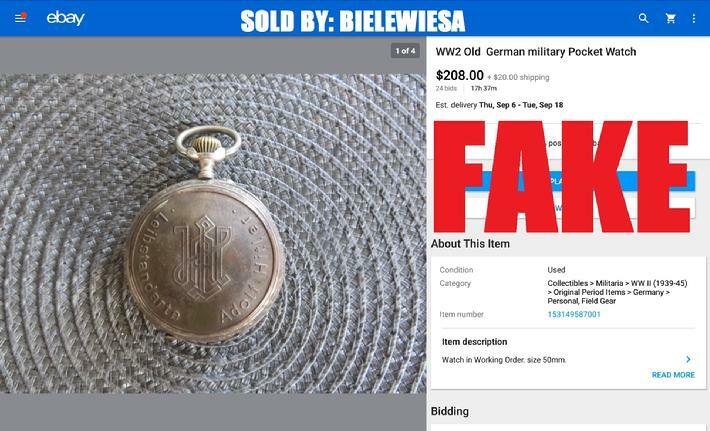 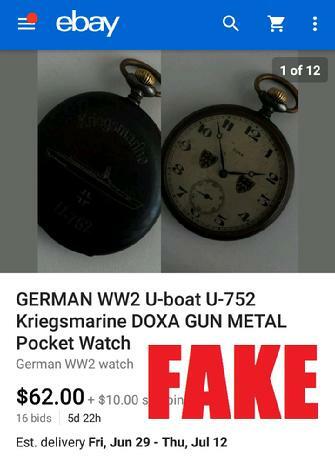 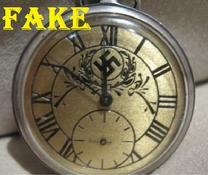 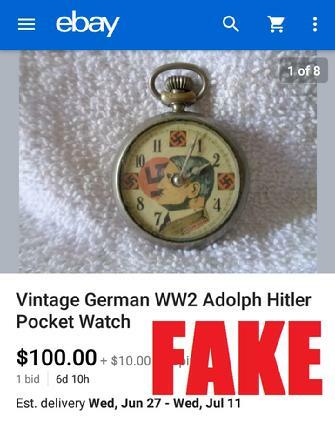 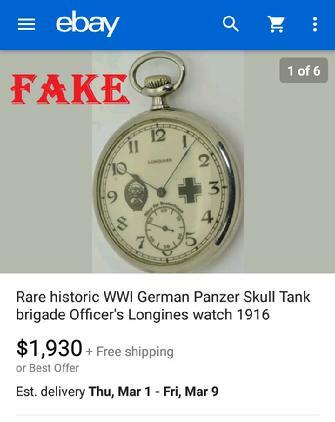 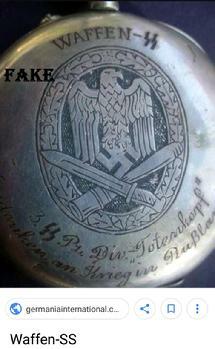 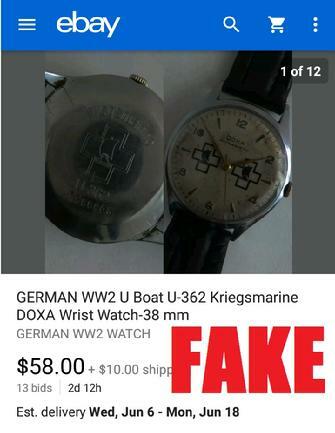 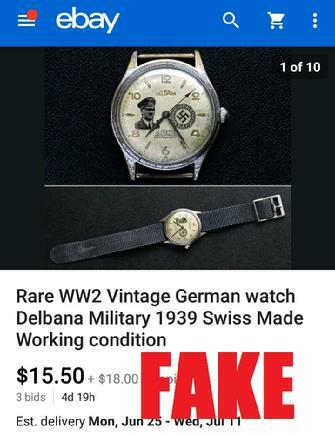 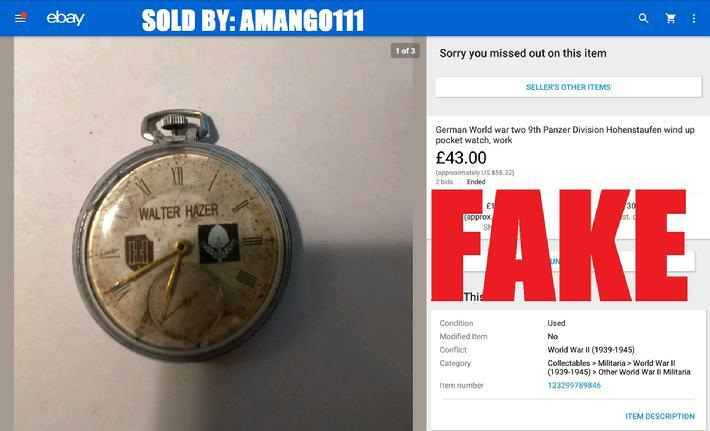 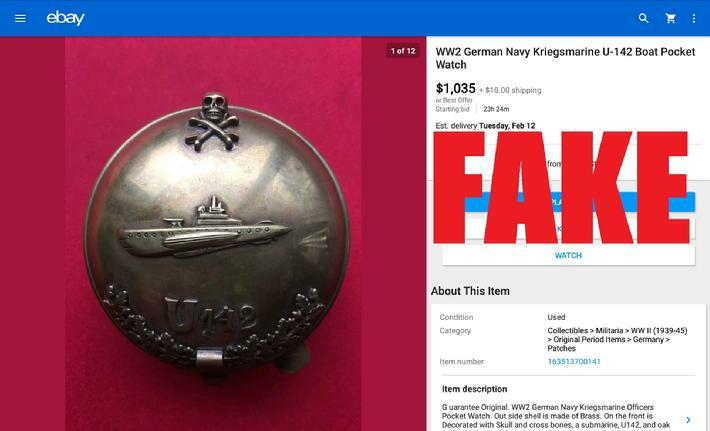 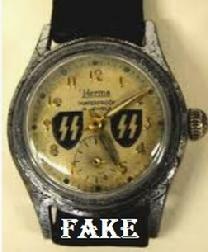 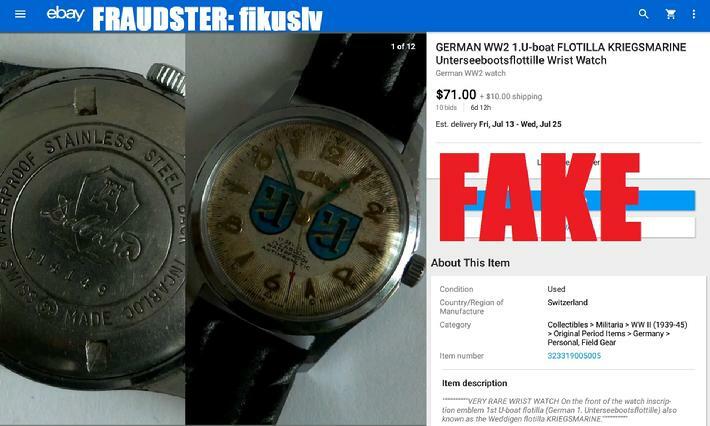 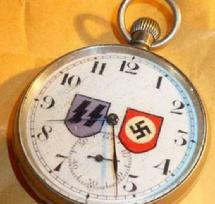 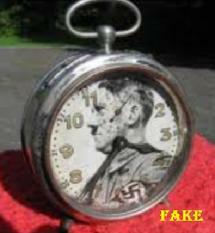 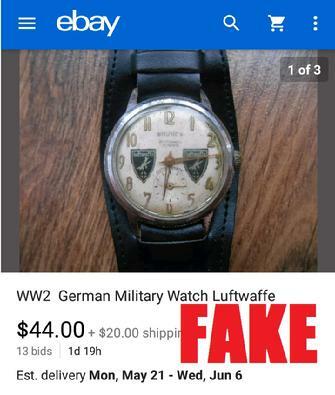 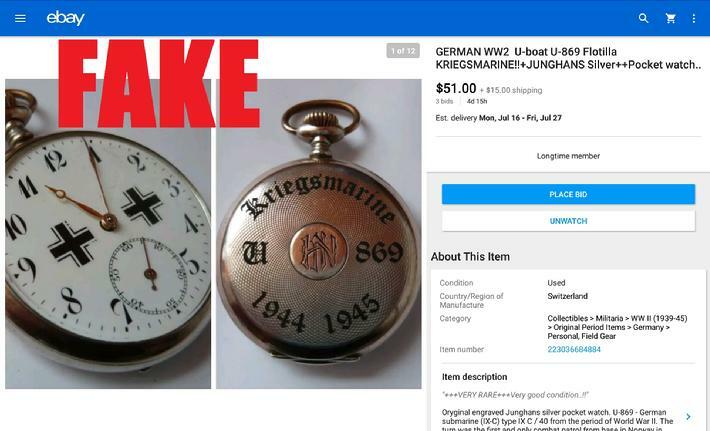 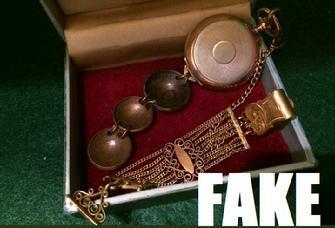 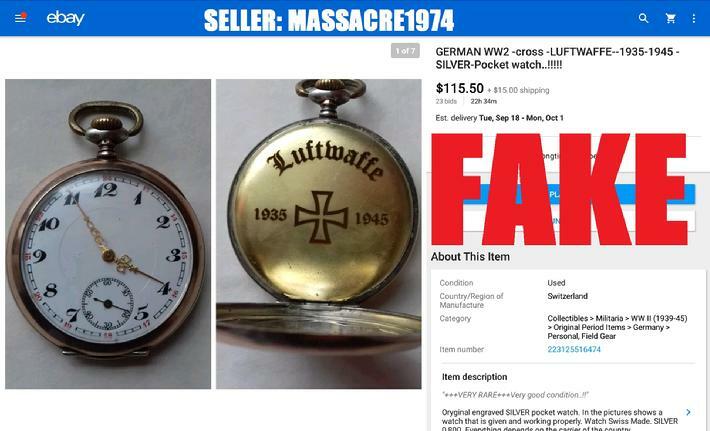 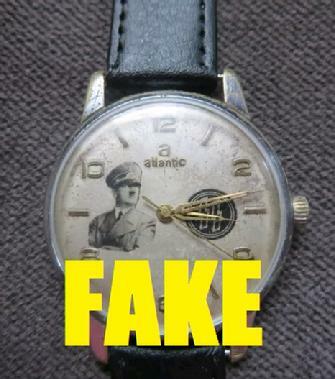 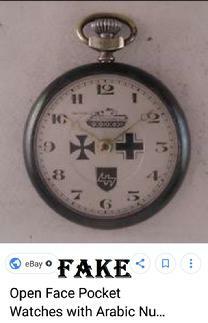 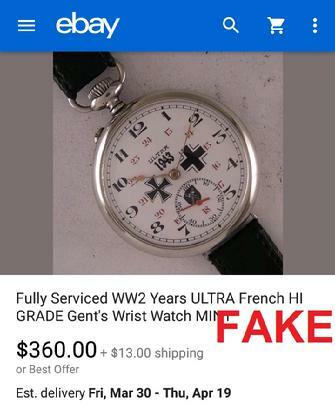 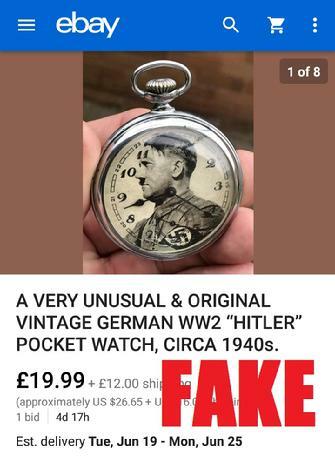 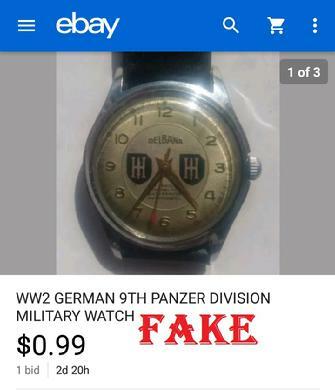 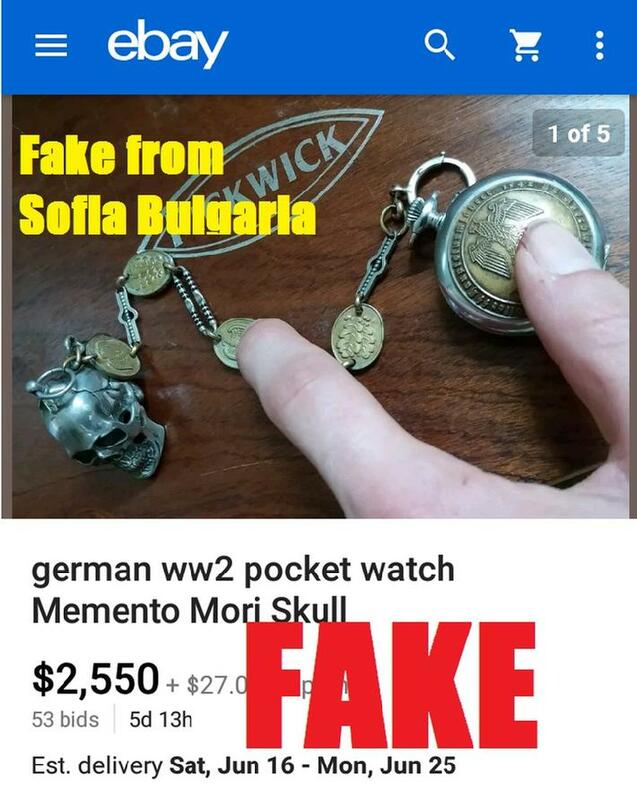 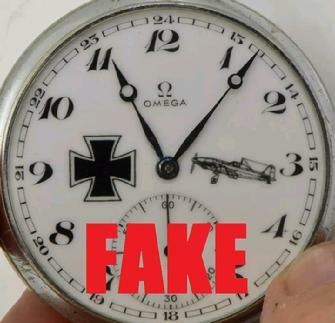 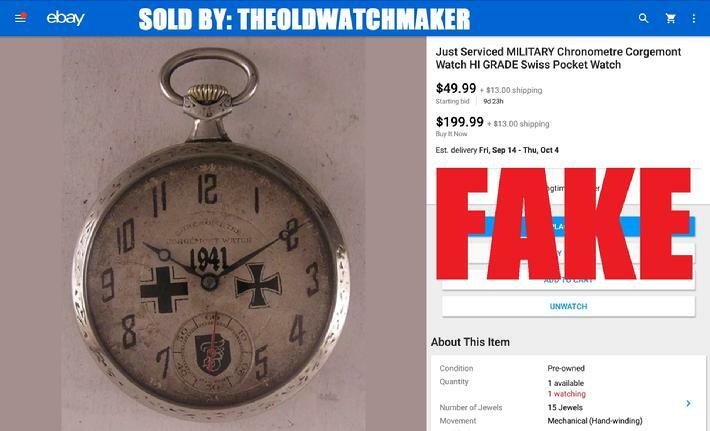 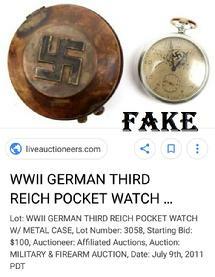 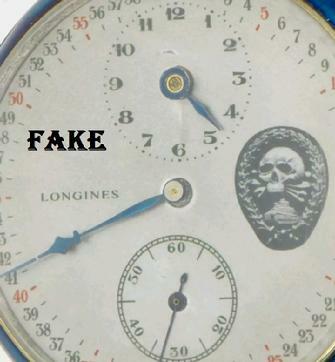 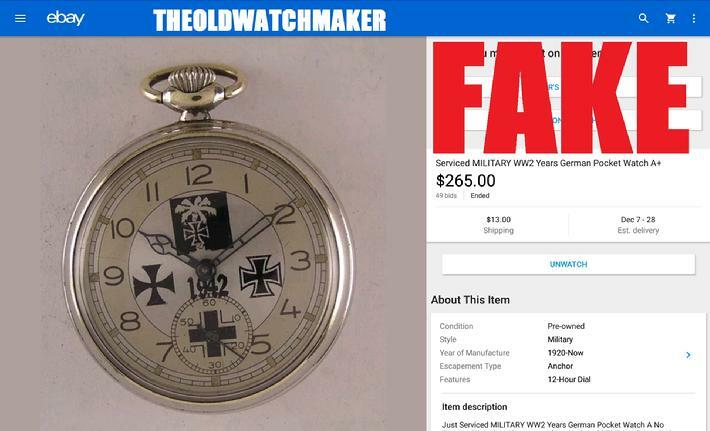 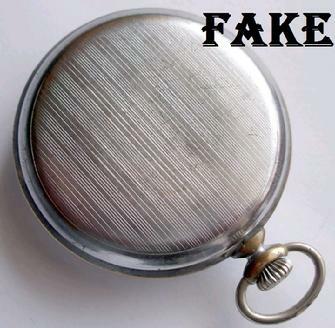 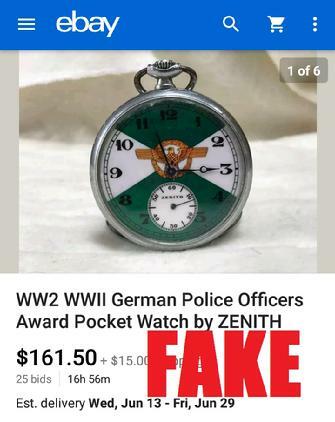 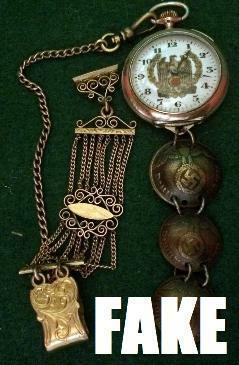 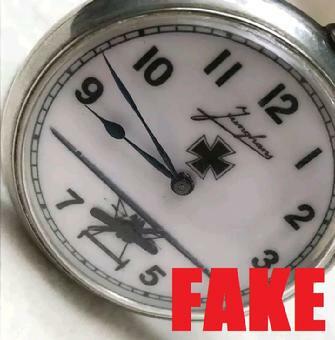 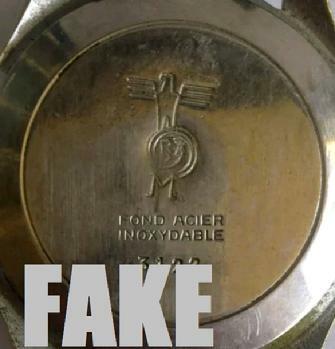 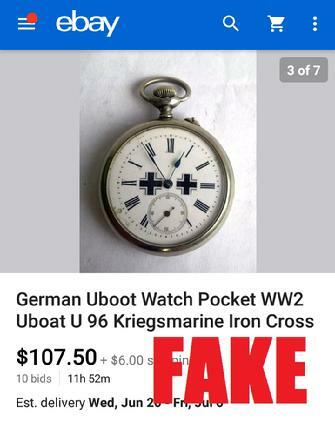 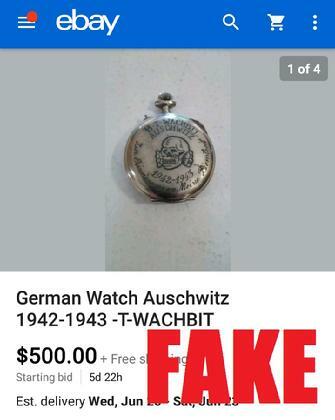 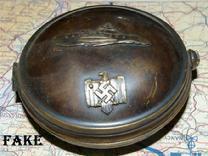 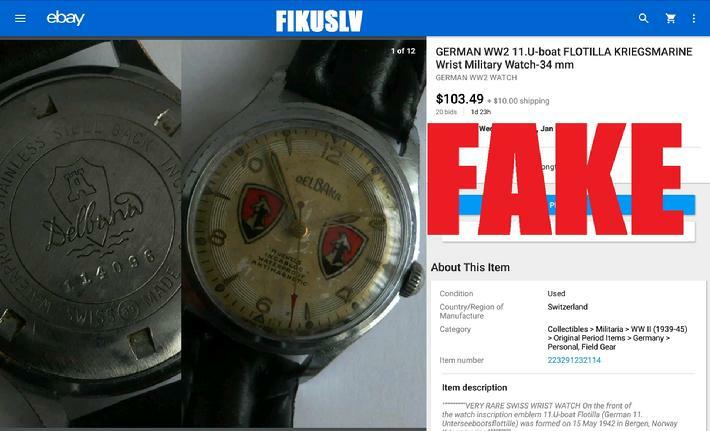 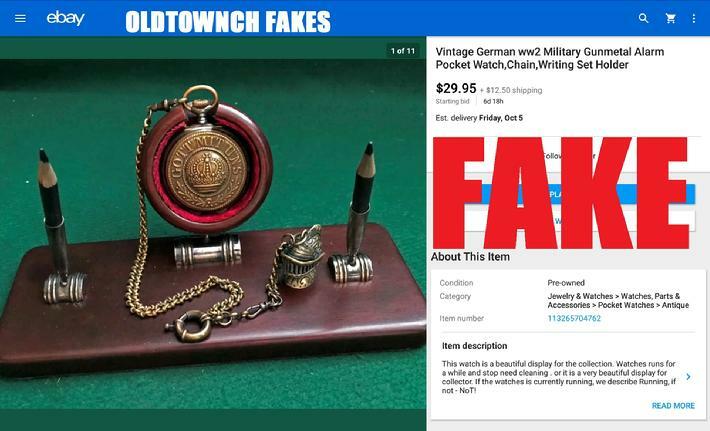 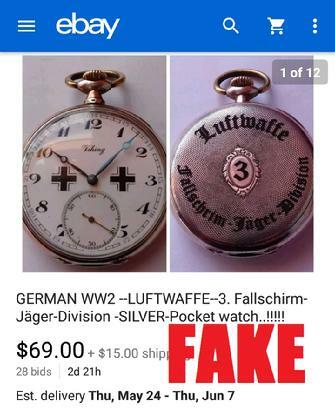 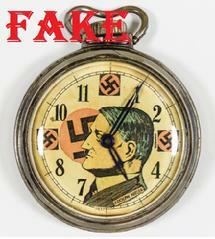 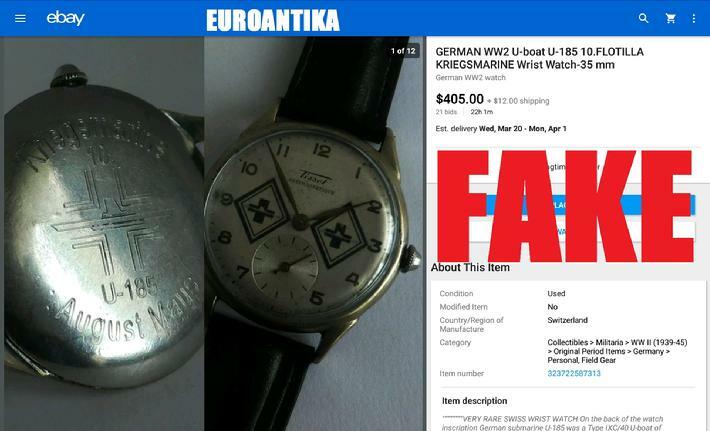 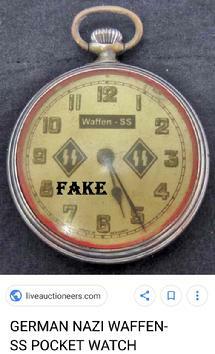 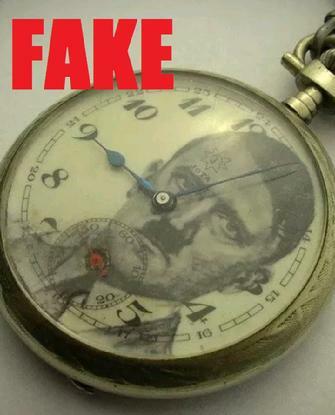 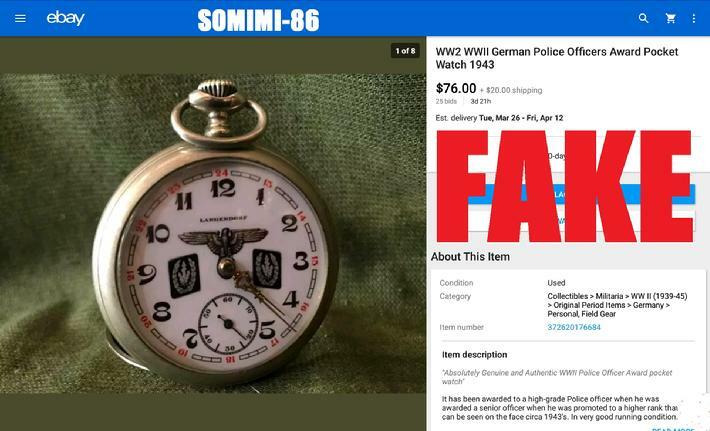 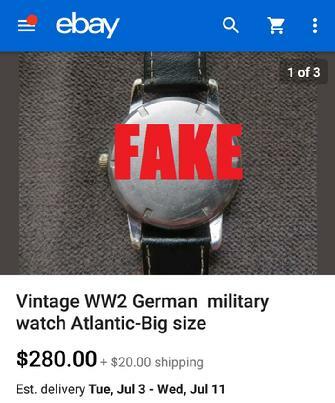 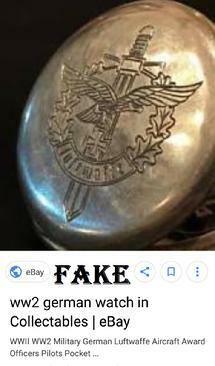 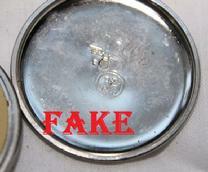 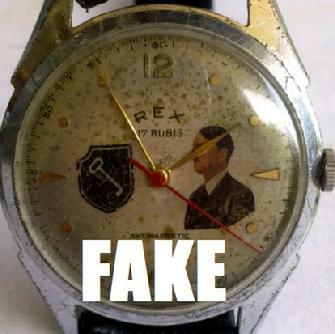 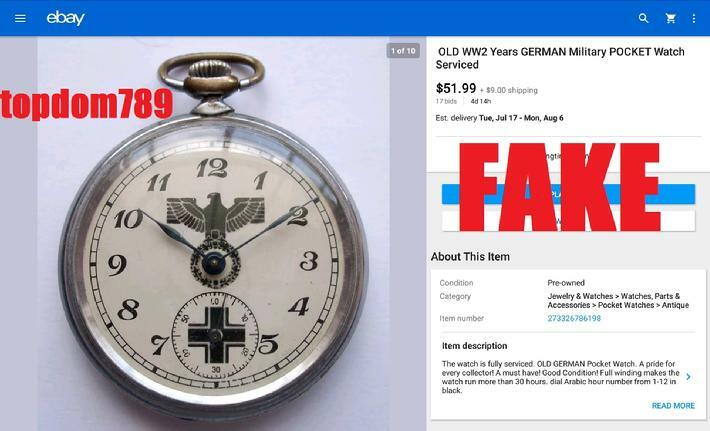 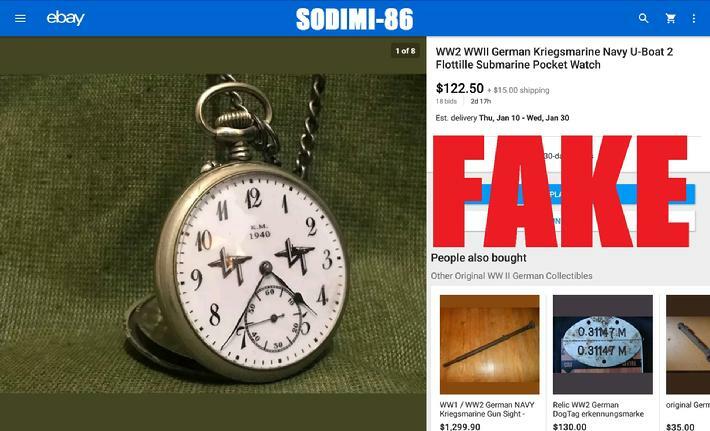 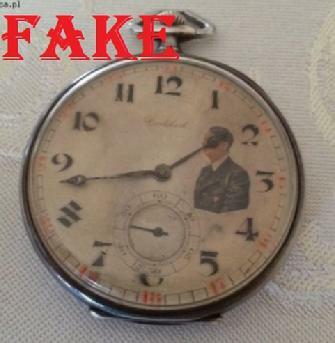 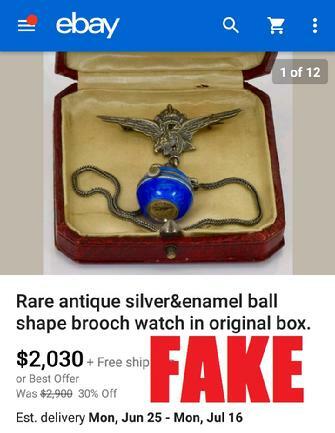 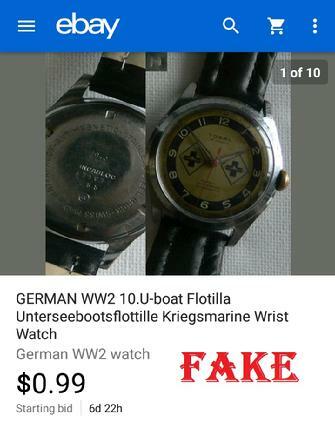 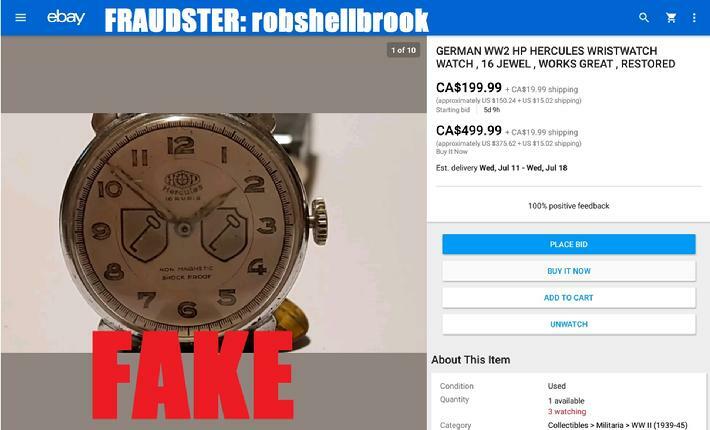 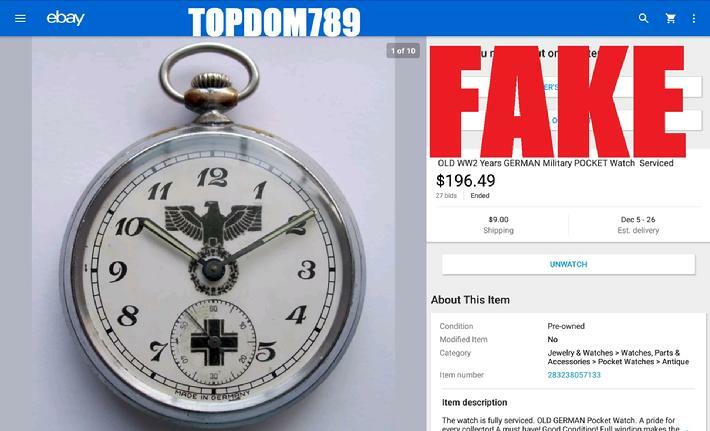 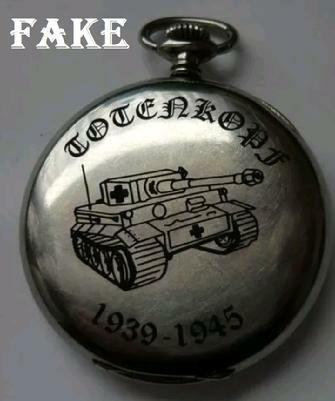 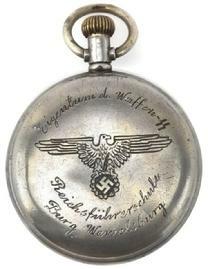 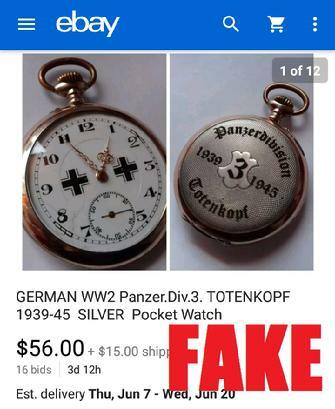 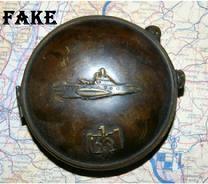 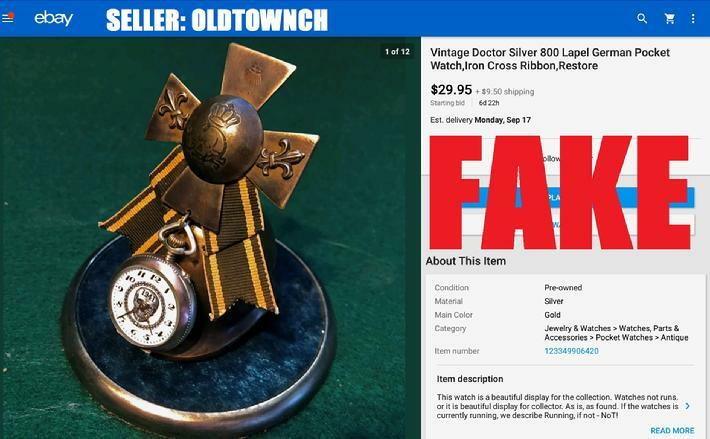 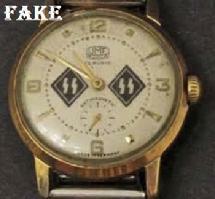 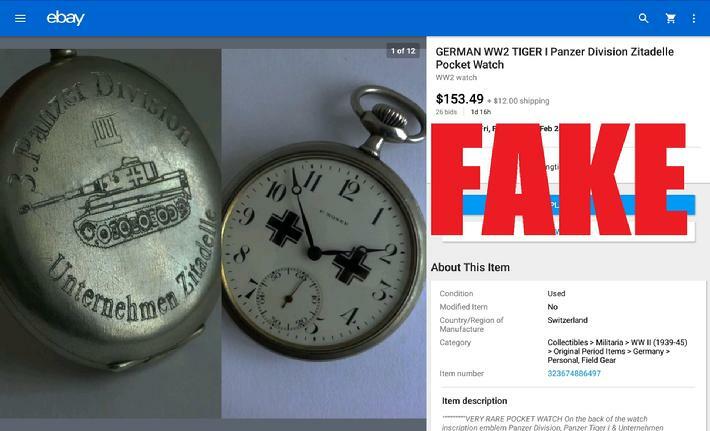 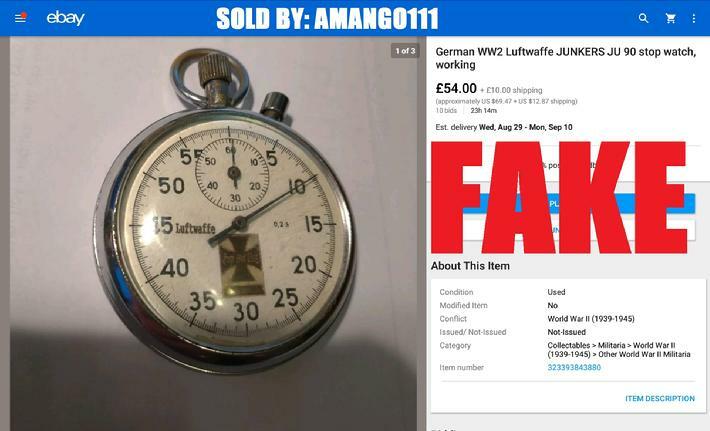 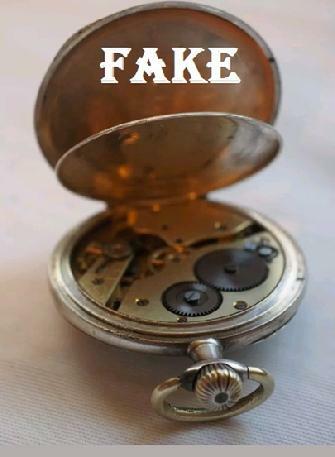 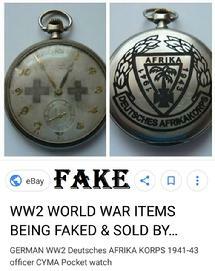 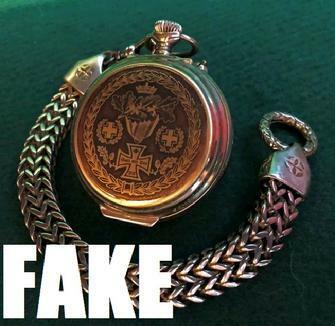 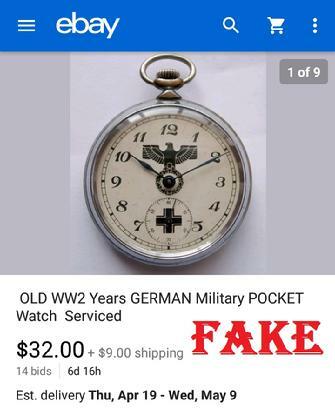 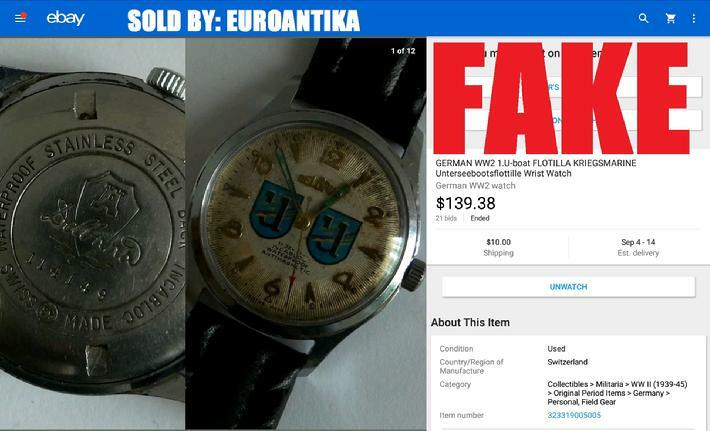 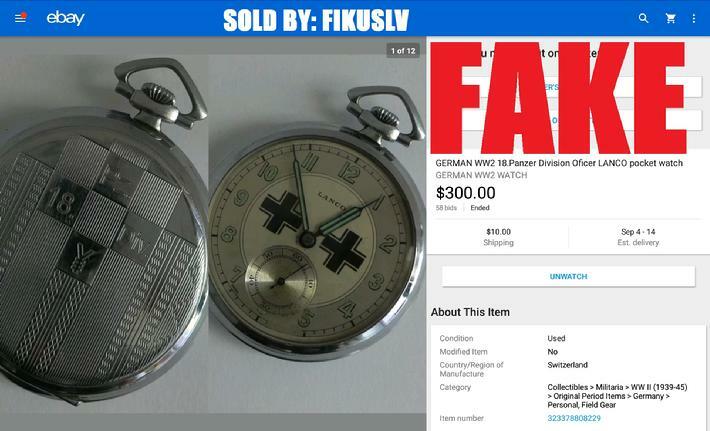 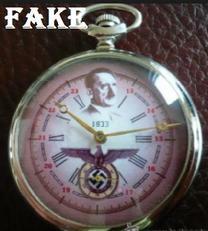 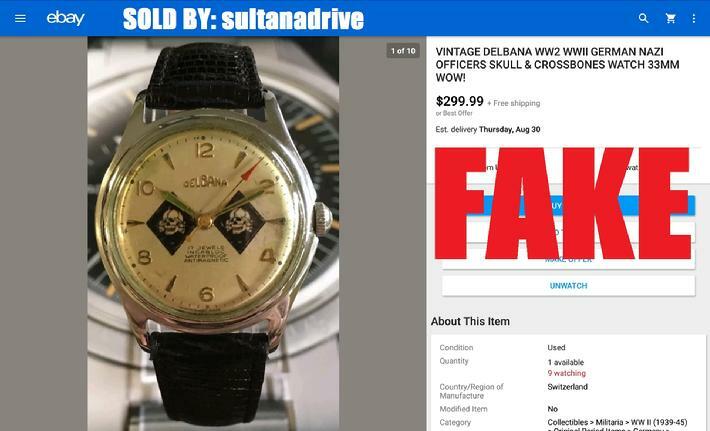 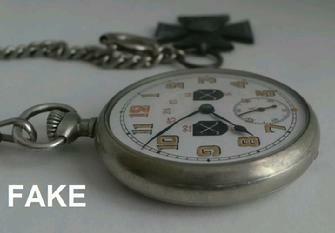 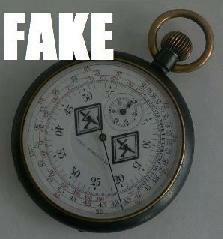 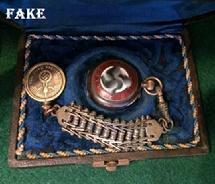 You will see very elaborate work on these fakes featuring skulls, swastikas, planes, tanks, boats and German crosses. 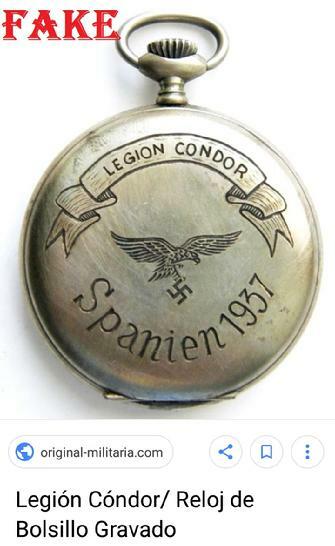 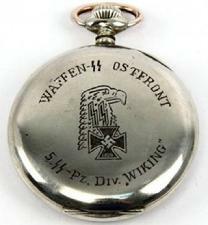 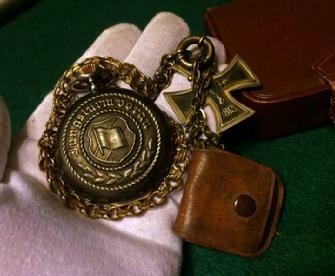 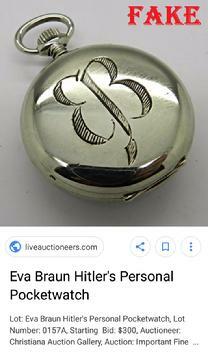 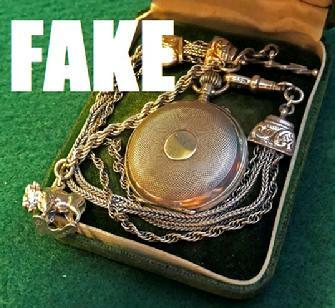 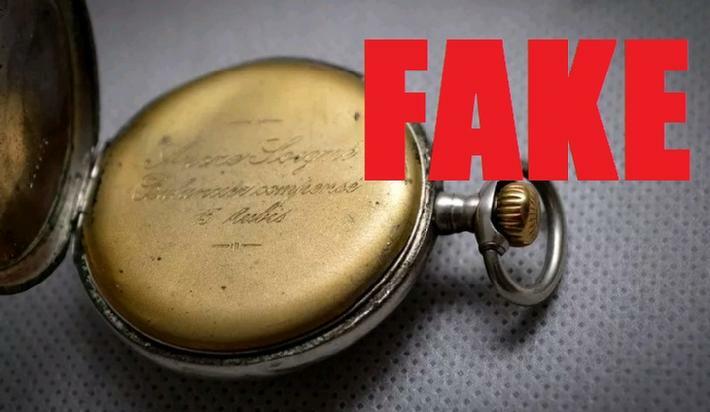 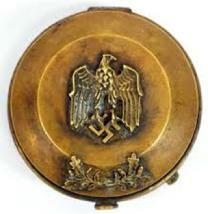 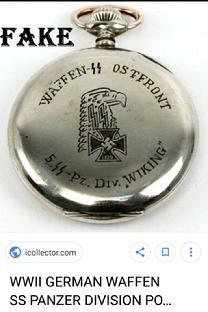 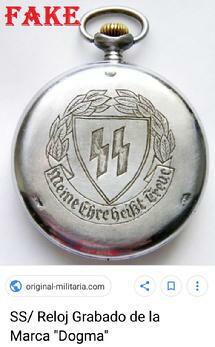 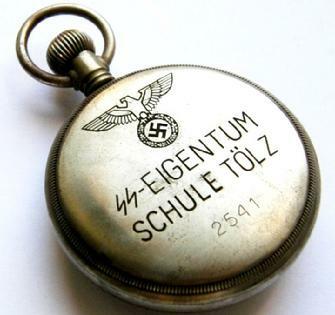 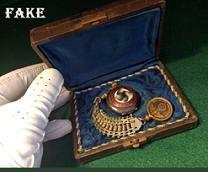 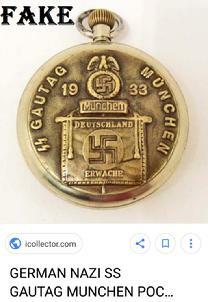 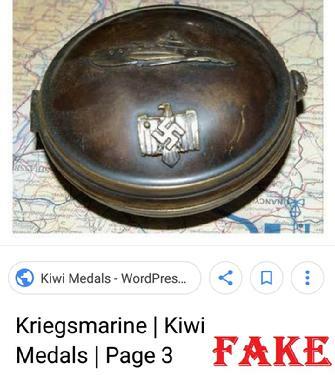 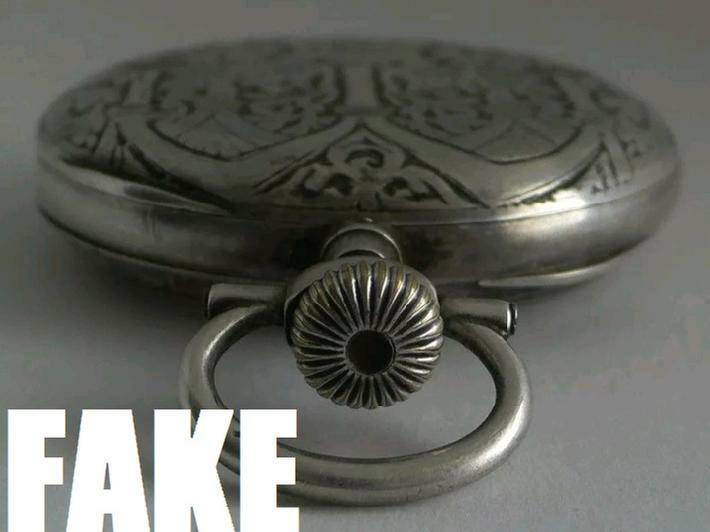 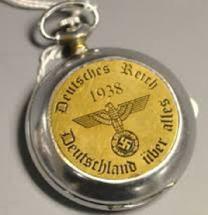 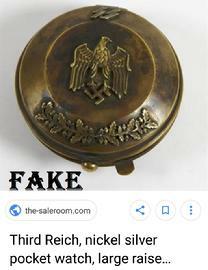 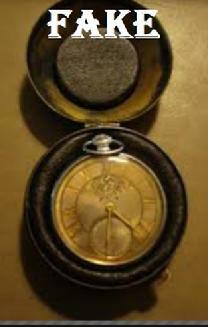 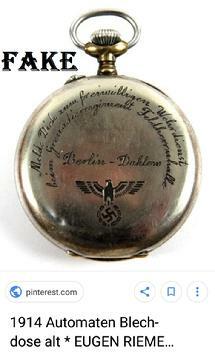 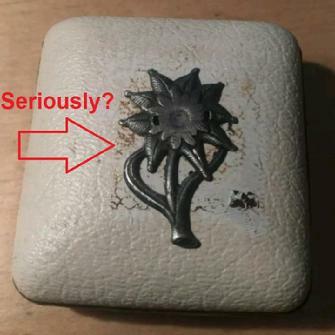 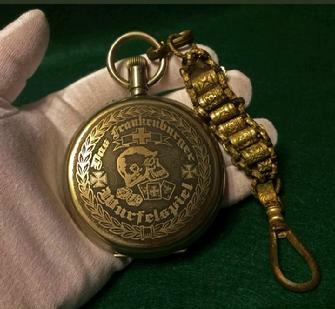 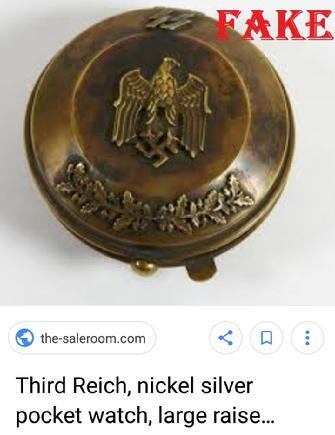 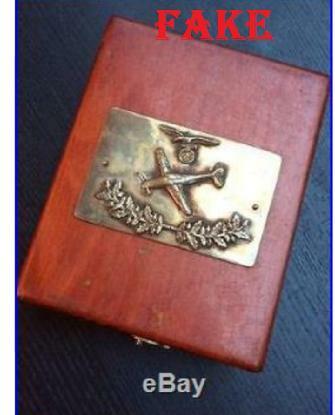 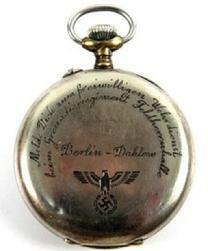 Many have equally elaborate “presentation cases” and claims that they were awarded to Nazi Officers during various campaigns; none of that is true. 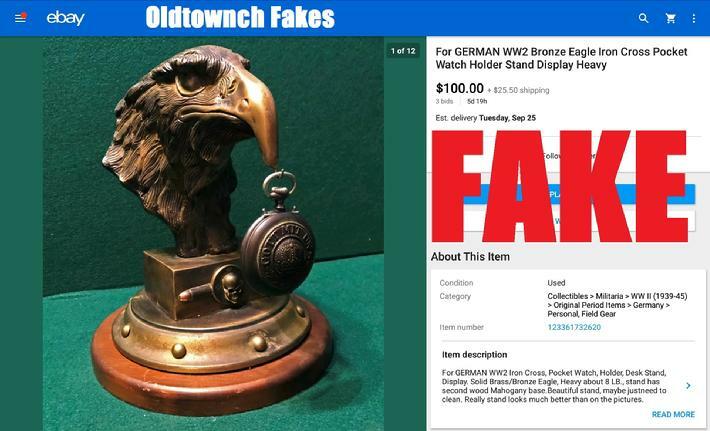 Some of these were created in the 50’s to capitalize on the public’s lust for war trophies, and many more produced in Sofia Bulgaria in recent years to take advantage of the online auction craze. 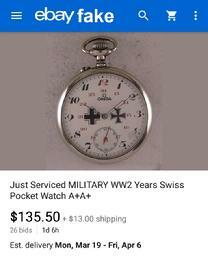 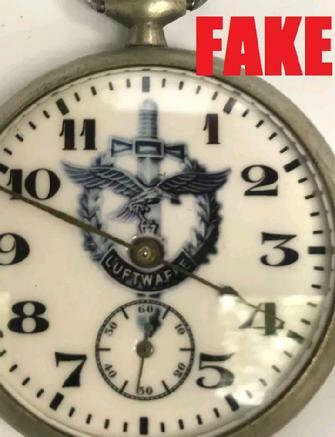 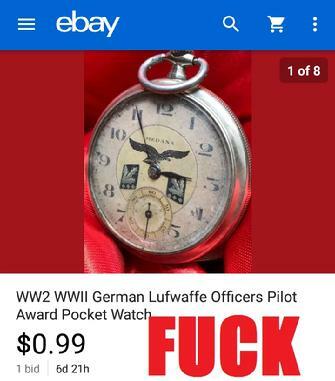 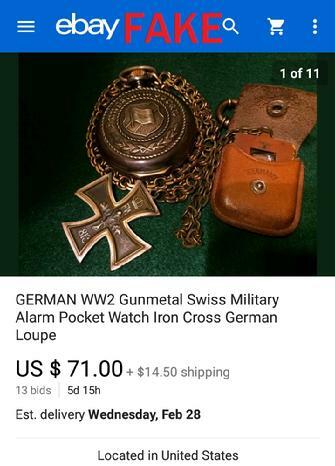 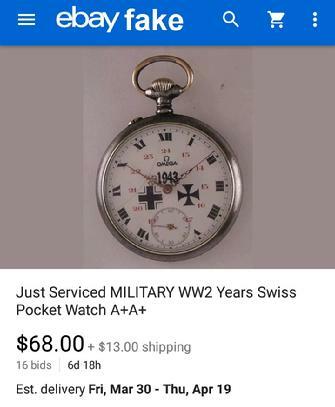 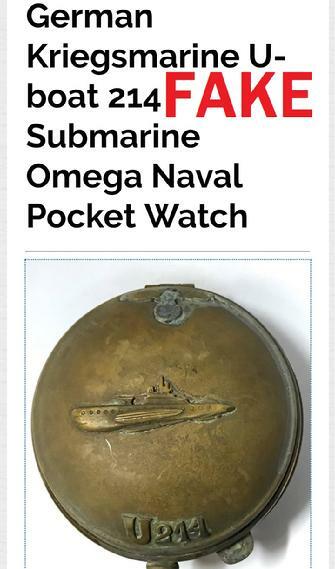 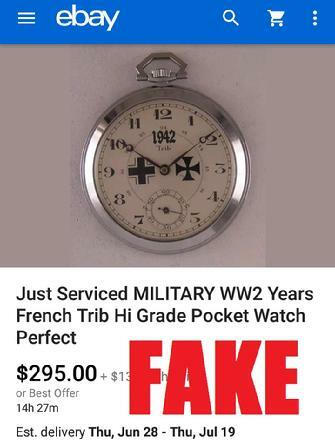 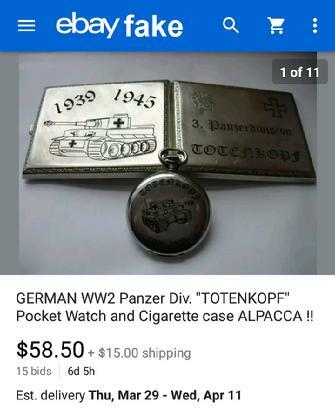 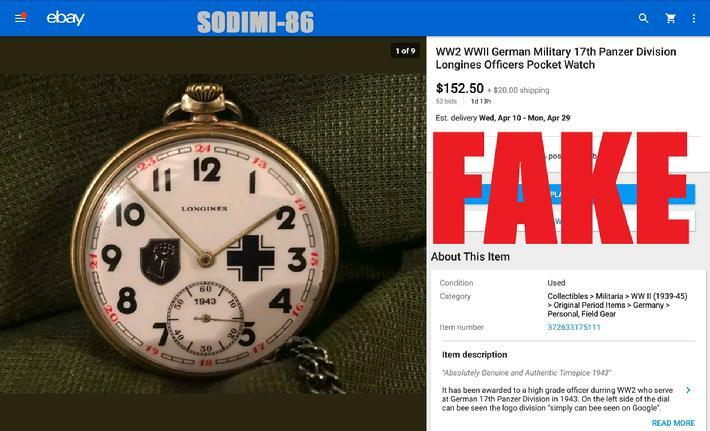 If you want to buy this garbage simply because you think it’s cool, that’s your business; just don’t confuse it with genuine war memorabilia, and don’t resell it as such when you finally realize its worthless junk. 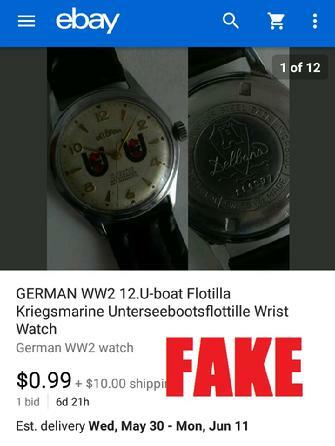 Above Right Fake Just Got a Whole Lot Cheaper! 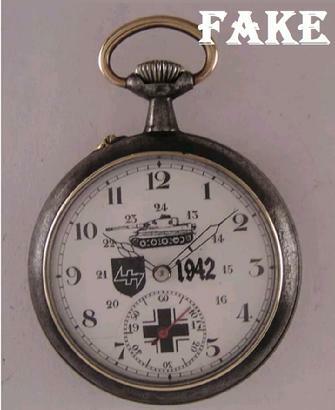 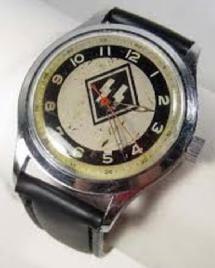 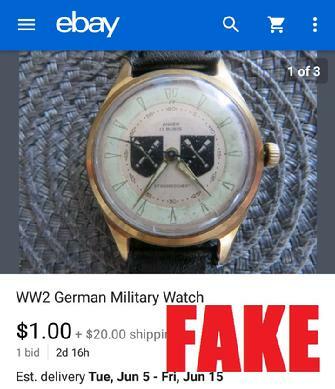 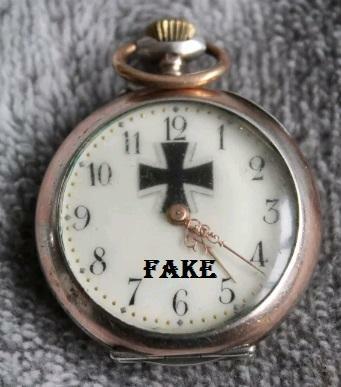 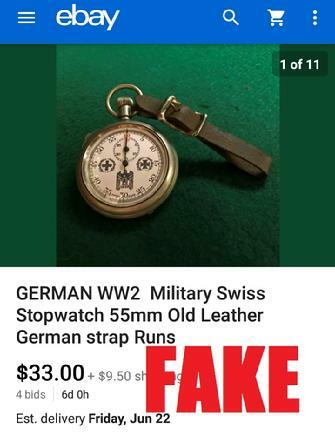 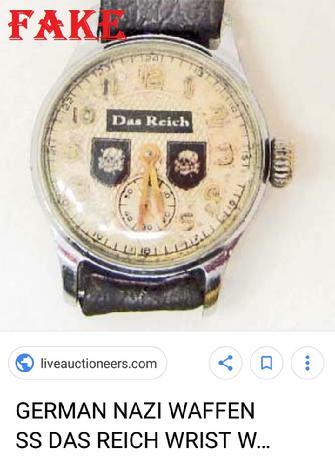 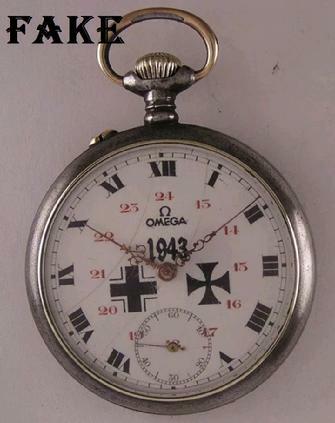 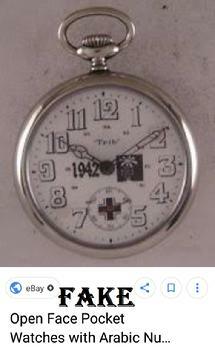 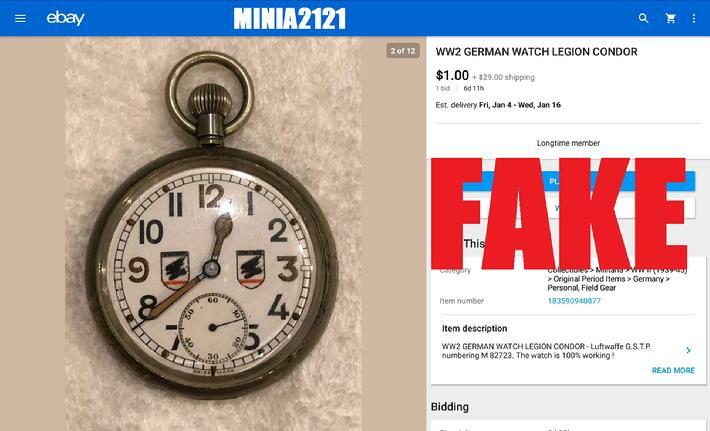 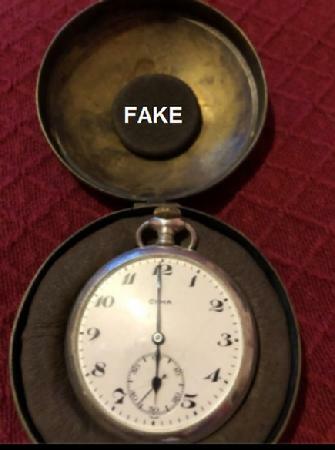 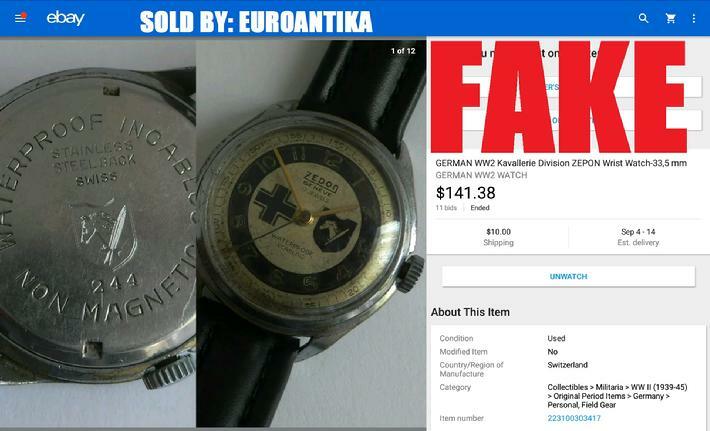 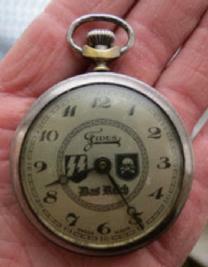 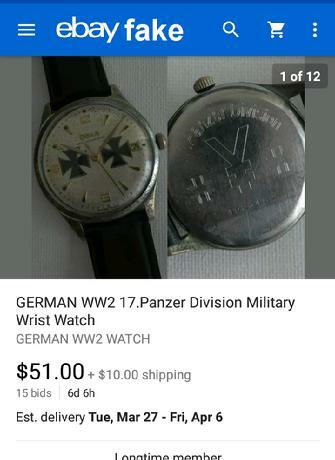 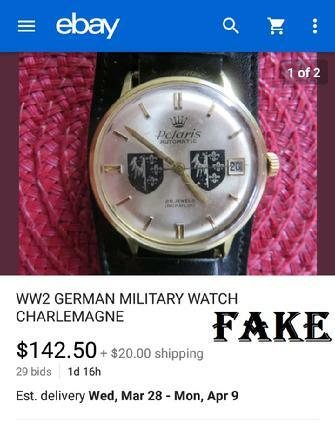 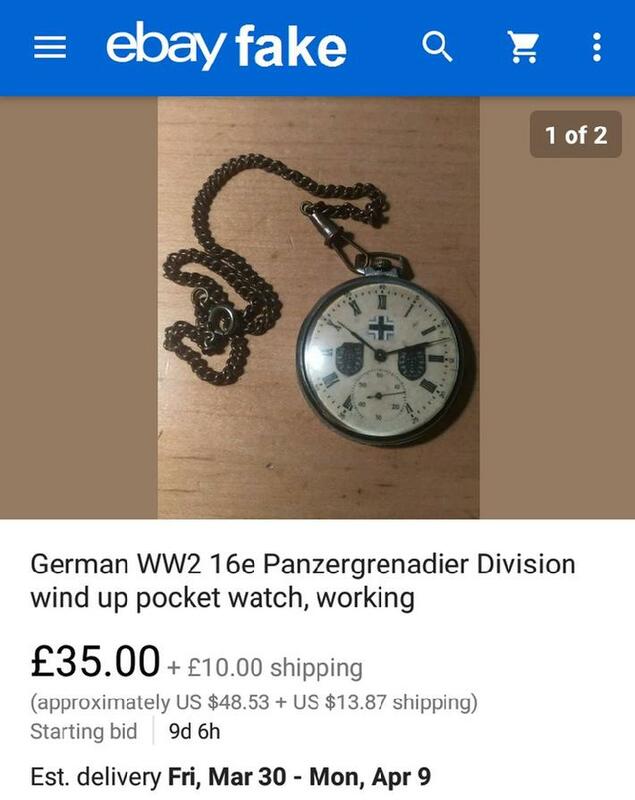 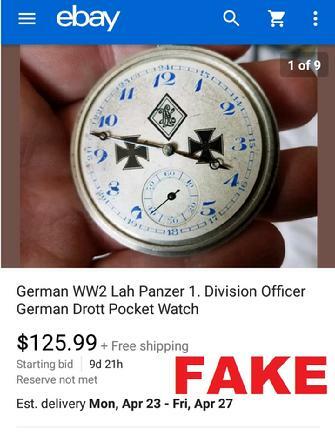 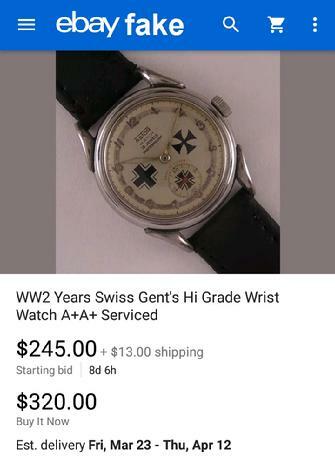 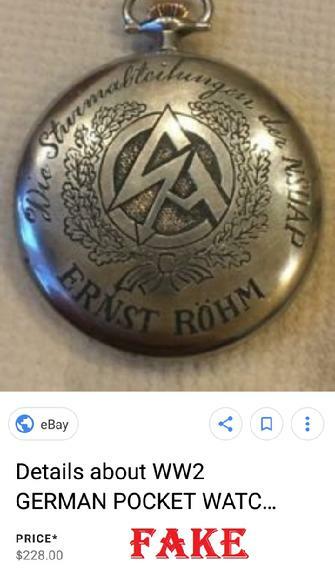 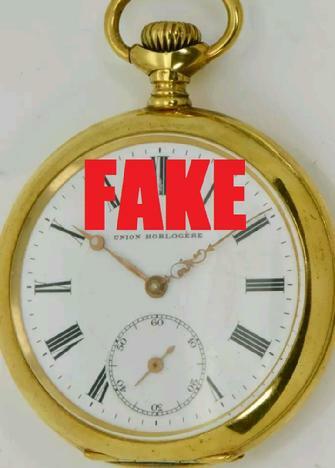 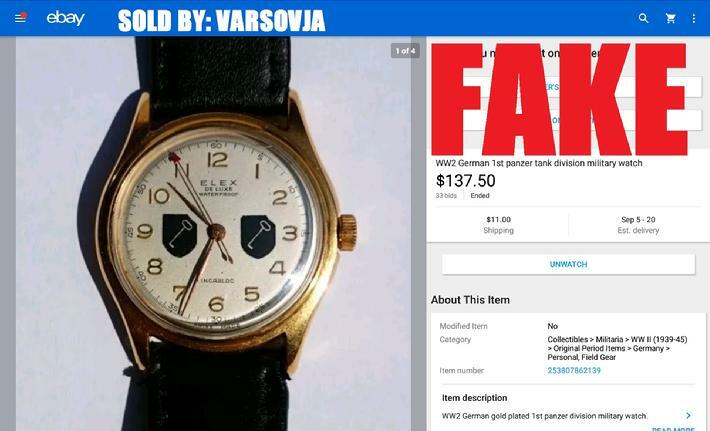 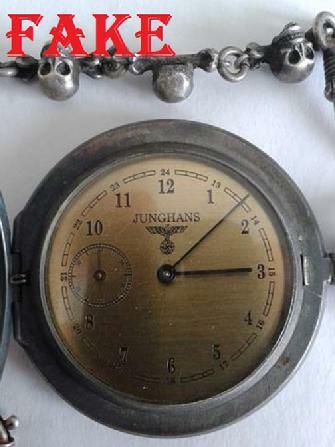 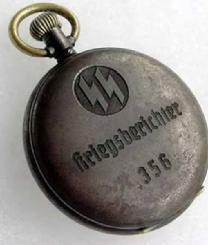 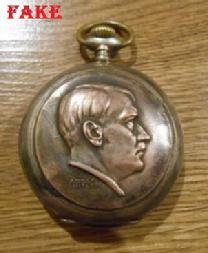 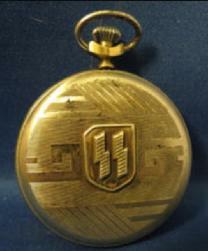 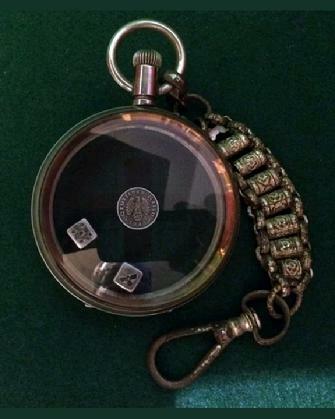 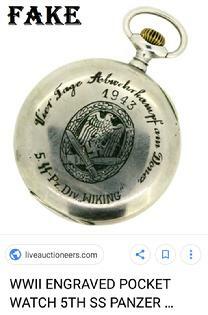 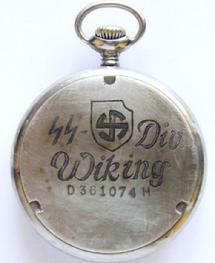 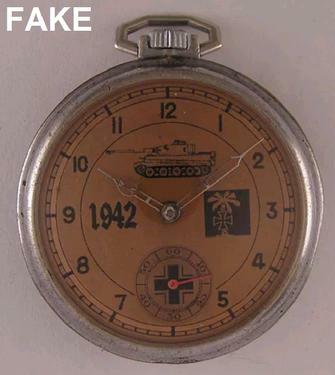 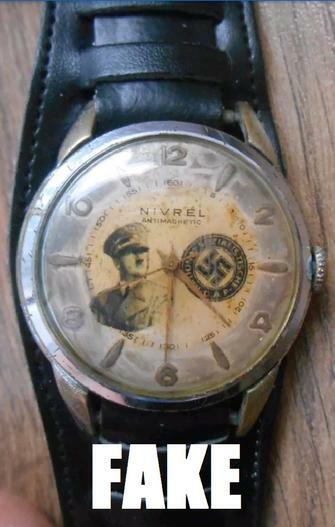 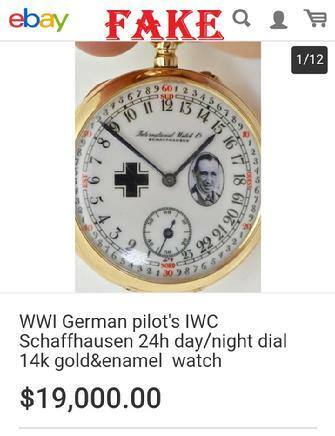 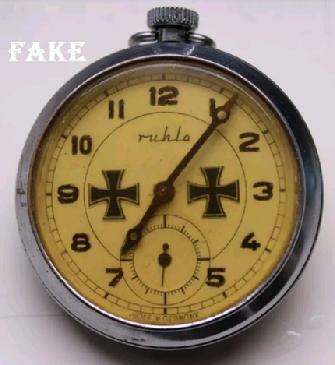 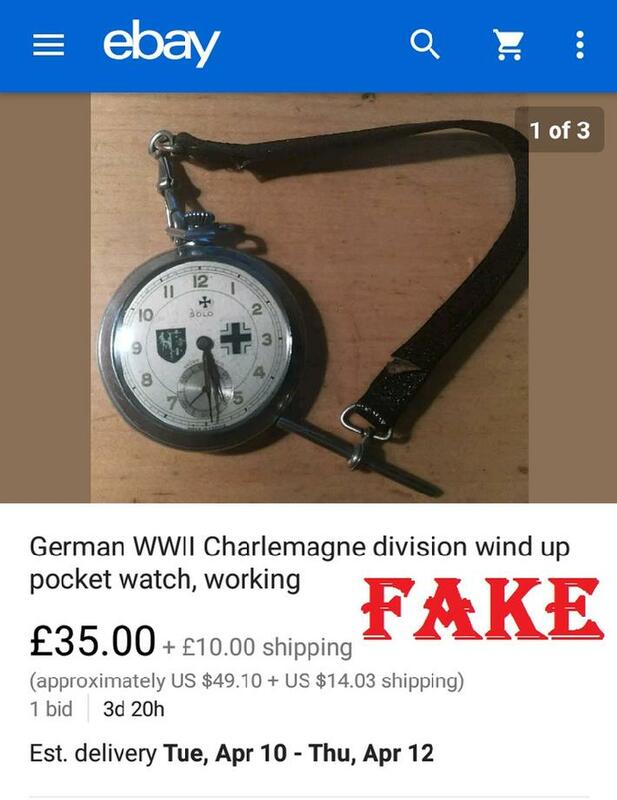 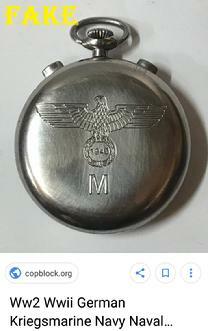 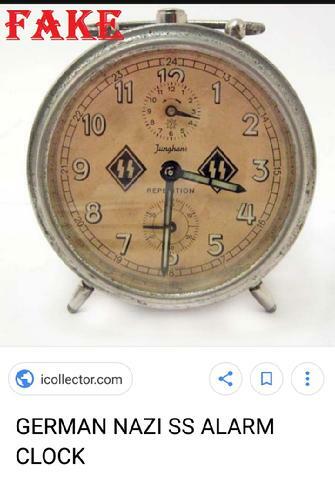 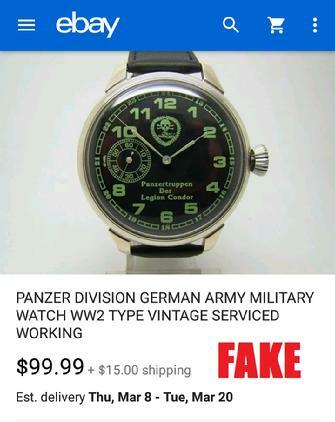 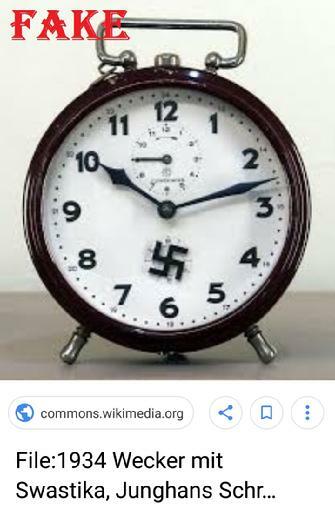 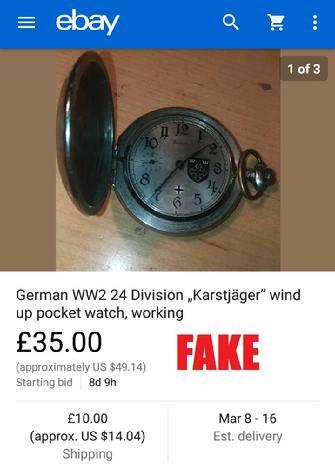 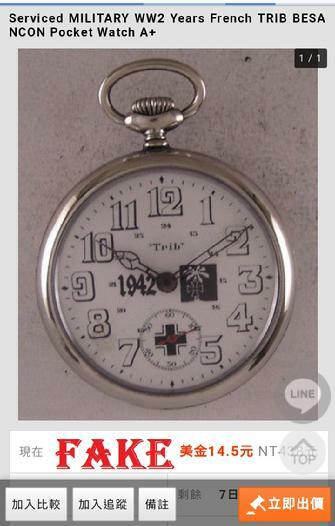 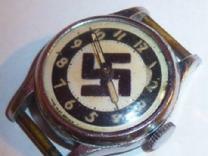 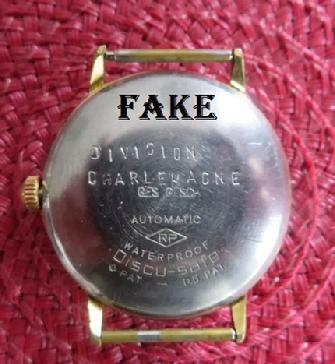 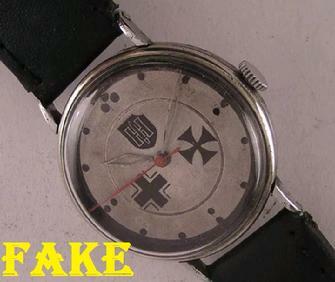 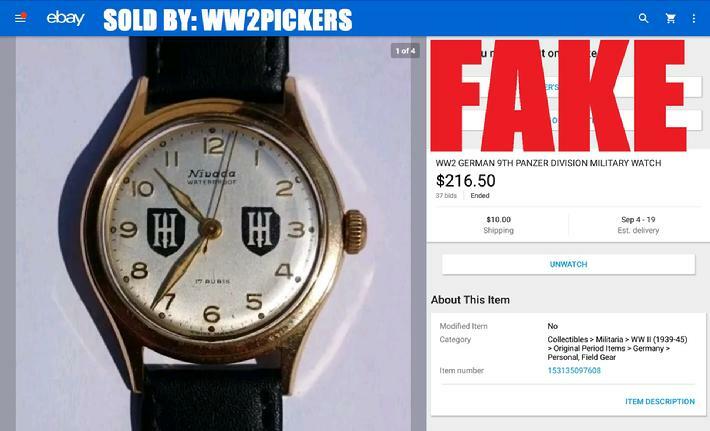 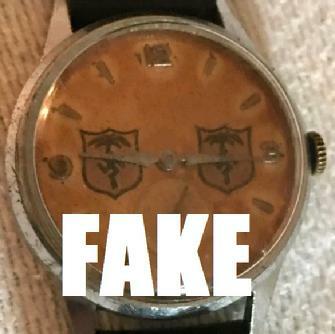 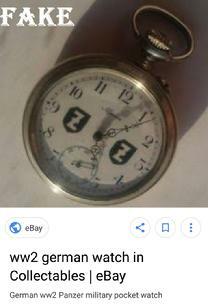 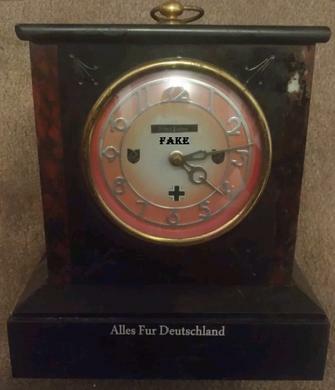 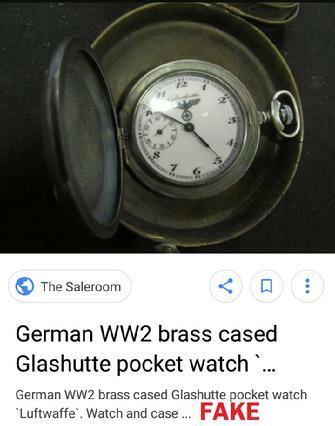 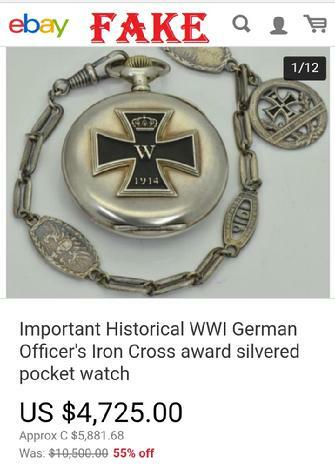 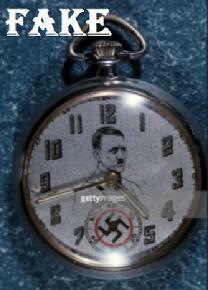 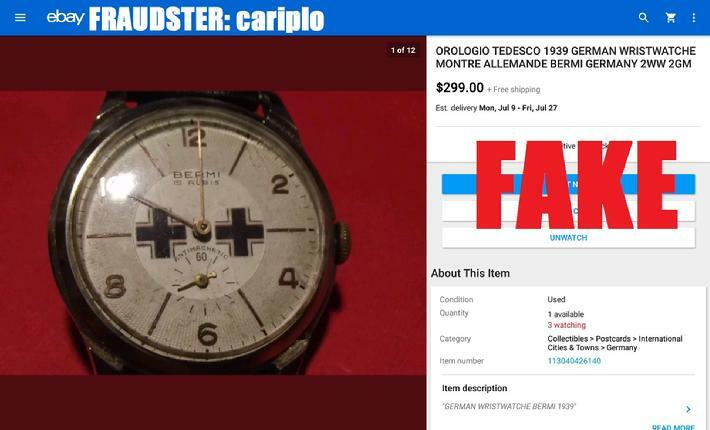 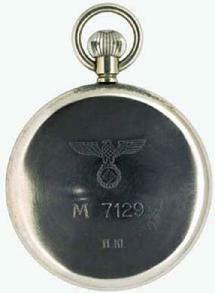 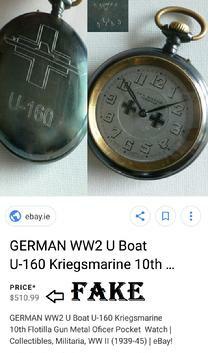 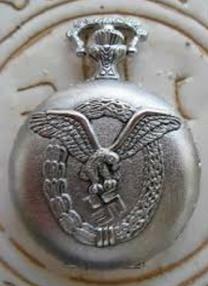 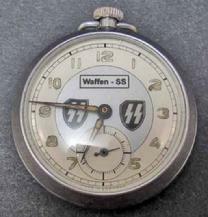 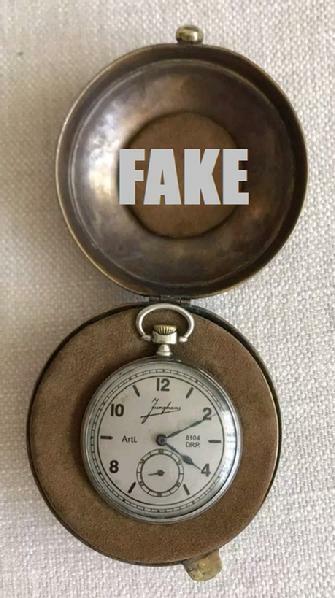 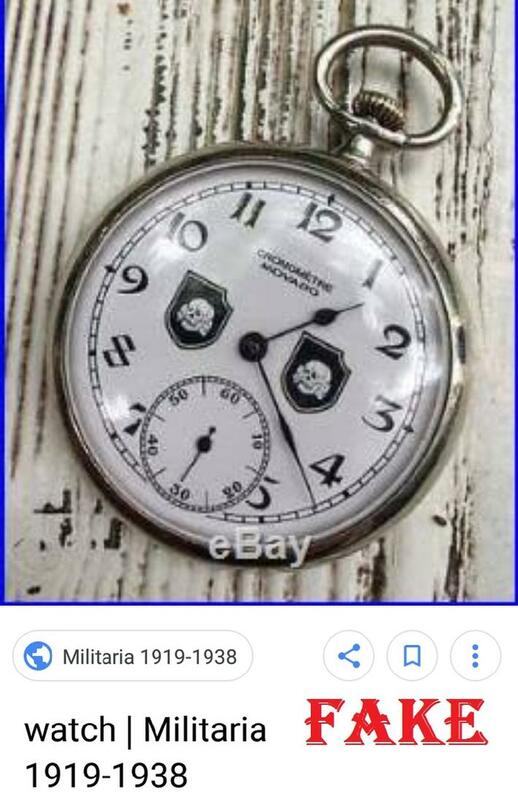 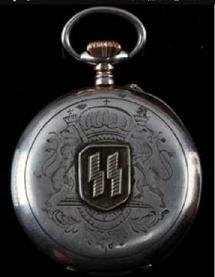 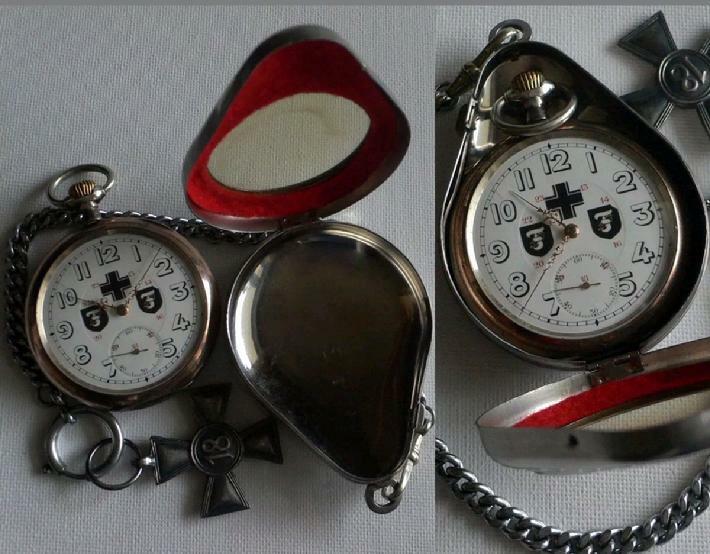 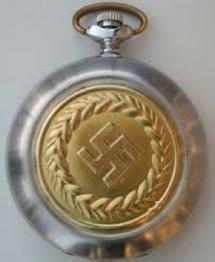 Hilariously Fake "Casino Trench Watch"
1st Panzer Division "Leibstandarte", short LSSAH,began as Adolf H. personal bodyguard, responsible for guarding the Führer's person, offices, and residences. 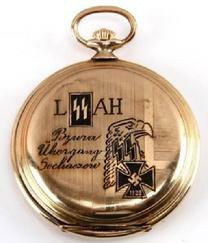 Initially the size of a regiment, the LSSAH eventually grew into a division-sized unit.The LSSAH participated in combat during the invasion of Poland, and was amalgamated into the Waffen together with the Verfügungstruppe and the combat units of the Totenkopfverbände prior to Operation Barbarossa in 1941. 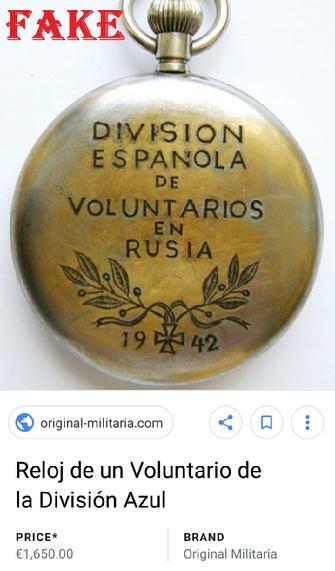 By the end of World War II it had been increased in size from a regiment to a Panzer division.Members of the LSSAH perpetrated numerous atrocities and war crimes, including the Malmedy massacre. 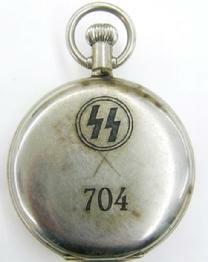 They killed an estimated 5,000 prisoners of war in the period 1940–1945, mostly on the Eastern Front. 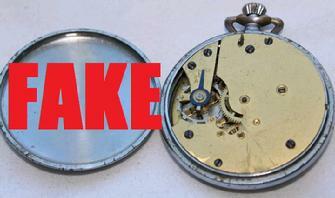 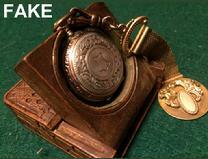 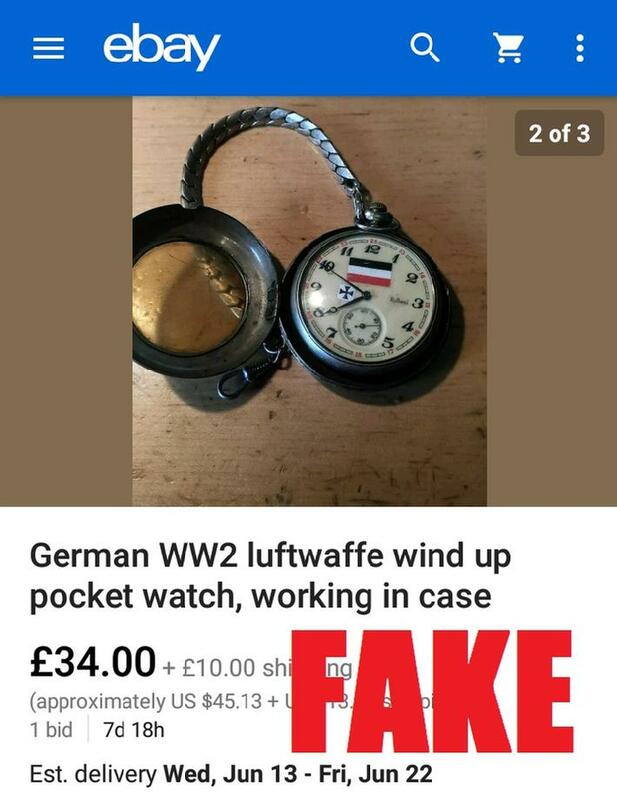 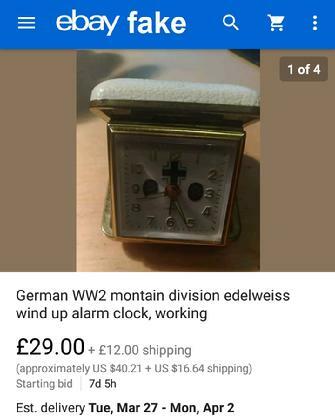 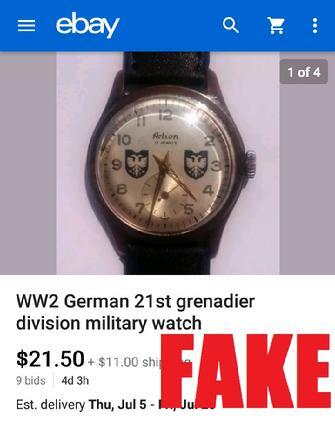 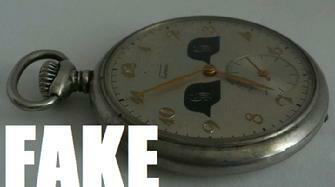 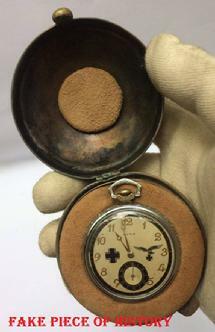 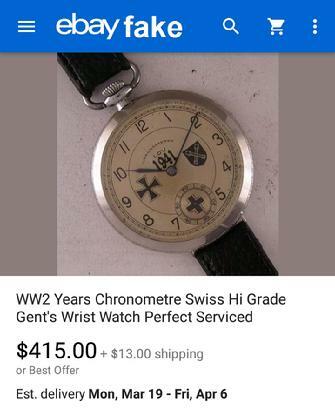 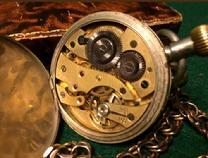 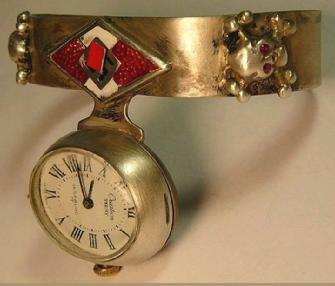 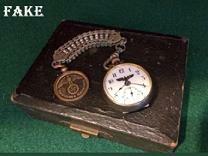 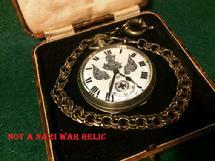 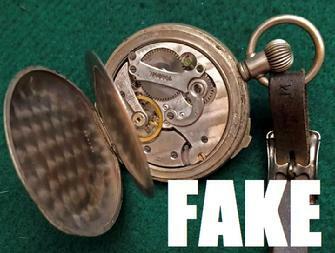 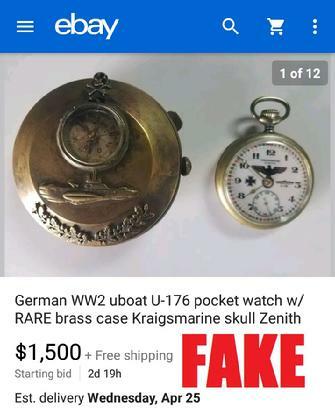 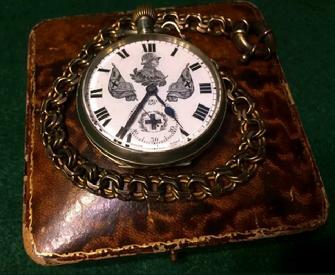 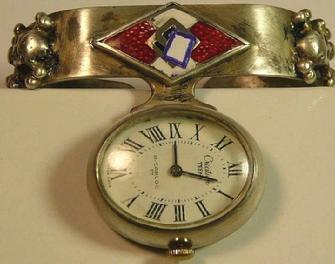 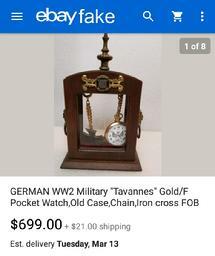 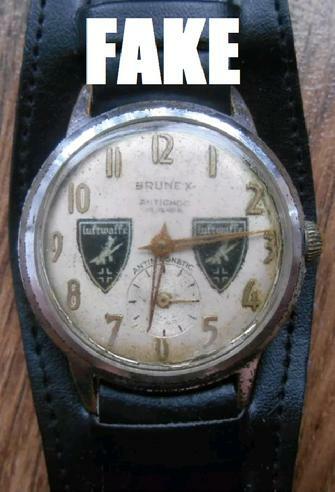 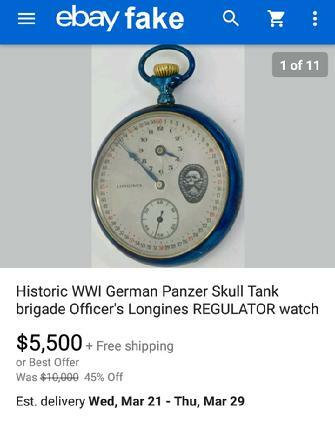 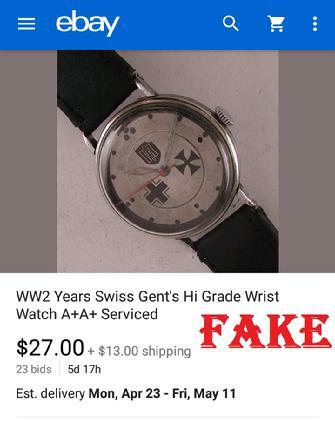 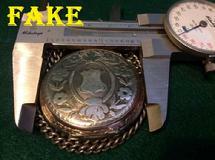 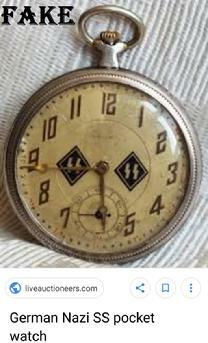 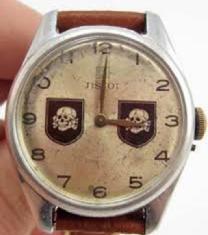 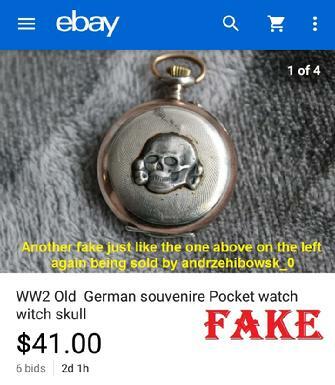 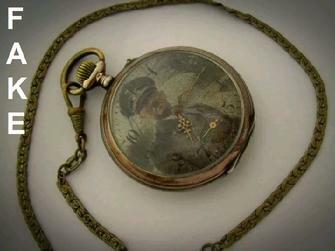 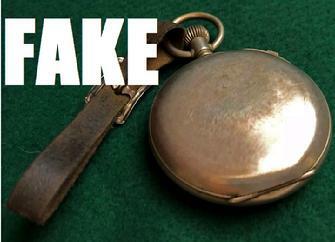 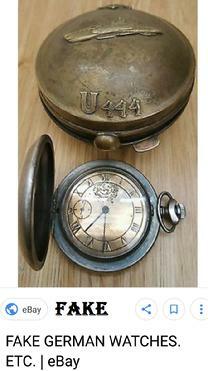 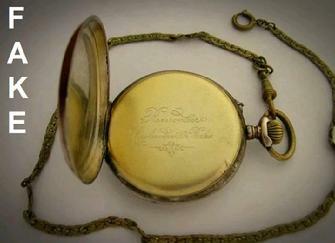 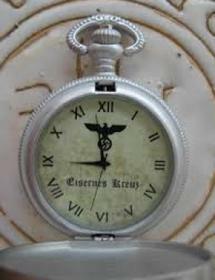 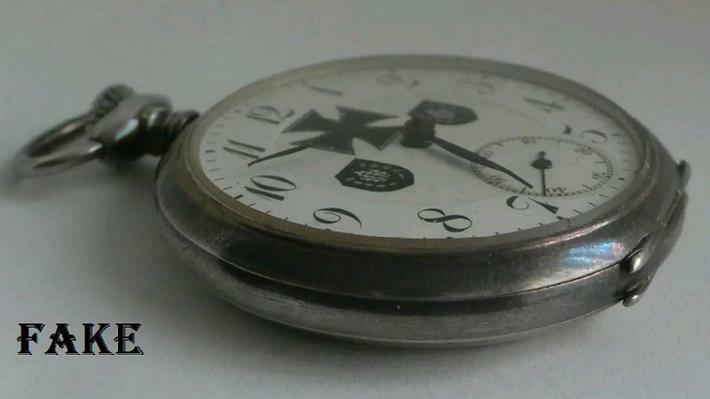 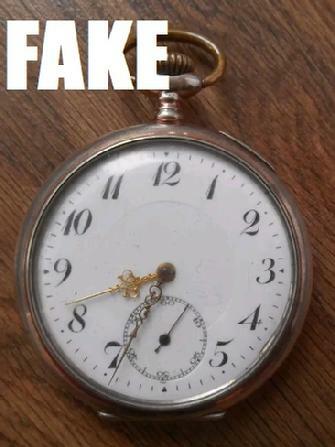 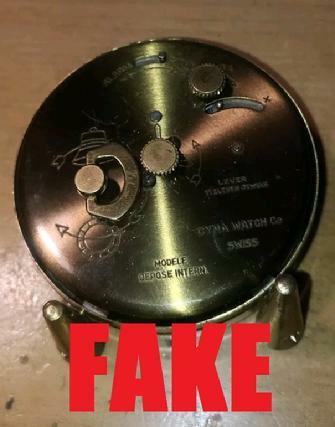 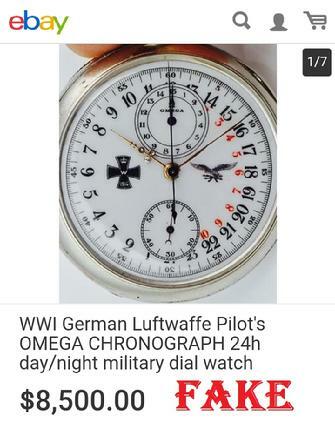 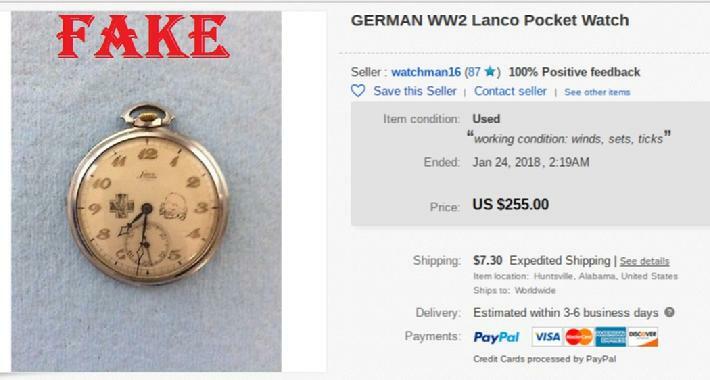 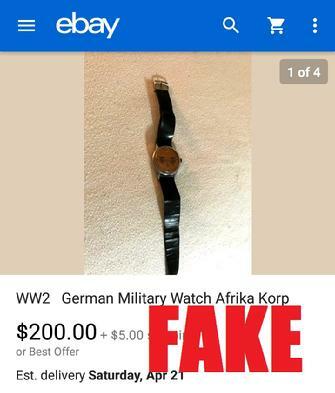 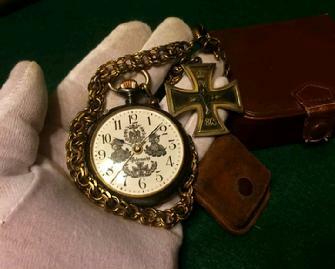 Attach a skull to an old crappy watch and it becomes a WW 2 "relic"